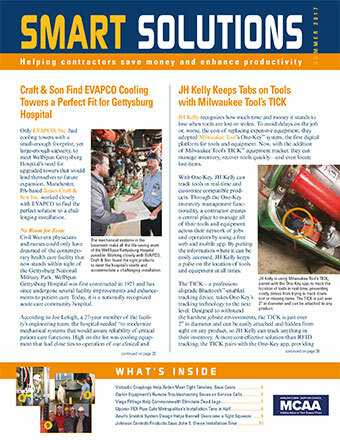 To meet new, stricter Occupational Health & Safety Administration (OSHA) standards for how much silica dust workers could inhale, McGilvray Mechanical partnered with MILWAUKEE TOOL to implement productivity-focused dust collection solutions. 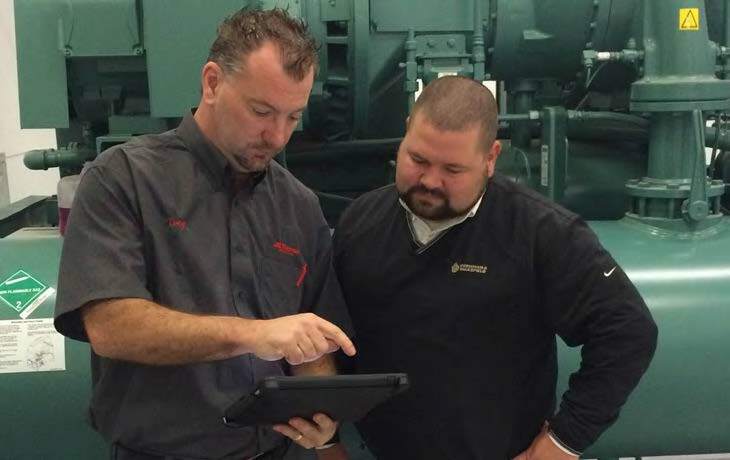 “At a time when many manufacturers were still trying to figure out how to address this standard, the MILWAUKEE team was very knowledgeable with regard to the new requirements and were able to apply their knowledge of our business to their offered solution,” said Kurt Lewis, director of operations at McGilvray. 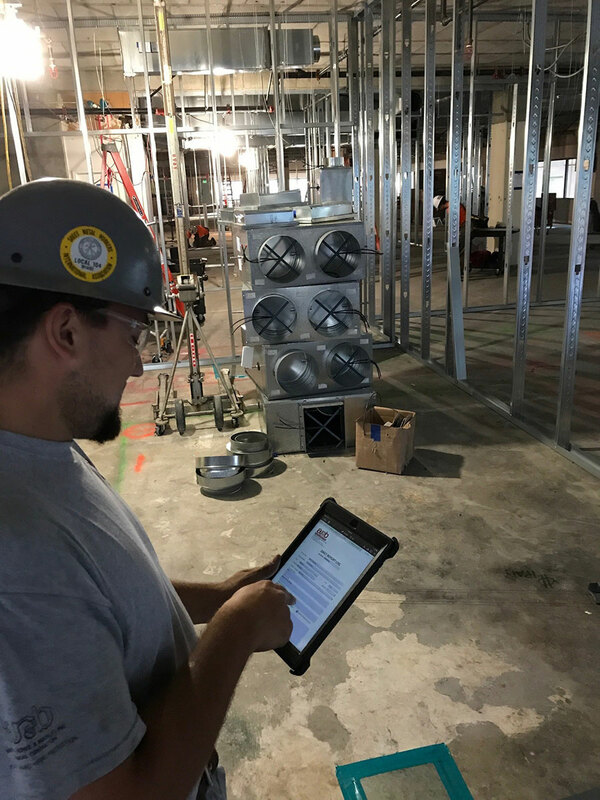 Indoor Environmental Services (IES) of California adopted XOi Vision technology, paired with Key2Act’s MobileTech, to provide technicians with an easy platform for capturing video and photos on the jobsite and sharing that content with customers. That investment has yielded many unexpected returns, including reducing the lead time for sales follow-up on field-originated opportunities from two weeks to one or two days. Thanks to careful planning, prefabrication, and easy-to-install Marley NC cooling towers from SPX Cooling Technologies Inc., Integrated Facility Services (IFS) replaced two large wooden cooling towers with two new steel cooling towers at a St. Louis, MO, government building while keeping the chiller system operational throughout to avoid disrupting essential county government services. The $1-million cooling tower replacement project received the Outstanding Mechanical Installation Award from the Mechanical Contractors Association of Eastern Missouri. The Herman Goldner Company expected that adopting Key2Act’s MobileTech would help them streamline processes and become more efficient. The mobile approach has also helped make technicians more independent, because they can rapidly exchange information with the home office, and it has reduced manual scanning and archiving. Built in the 1950s, White Plains High School in New York has stood the test of time, so when an HVAC upgrade was needed, school administrators wanted to keep it simple—and minimize cost and downtime. 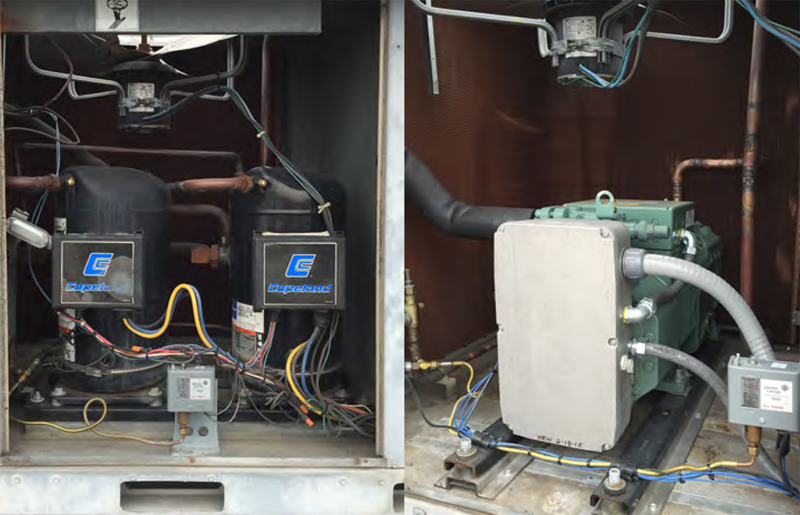 They selected Daikin Applied variable refrigerant volume (VRV) solutions to replace their aging systems with new, more efficient ones that fit the bill. Now, the school not only has a comfortable climate but also a more energy-efficient, quieter, and healthier classroom environment. 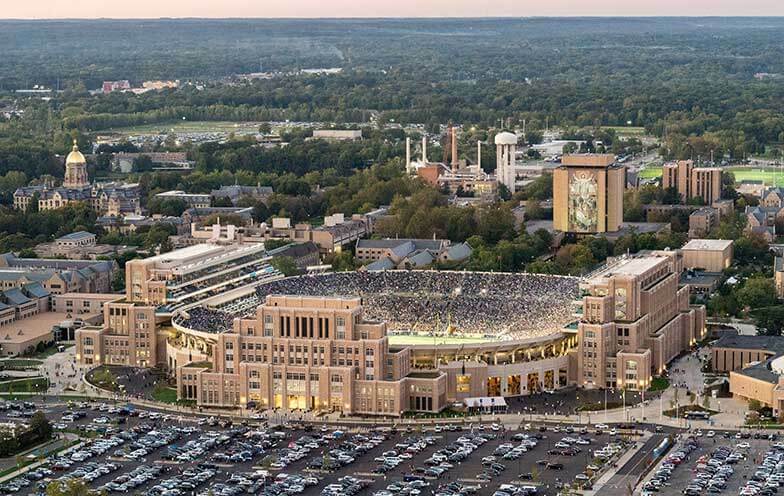 The University of Notre Dame and SLOAN have a 113-year-long relationship, so the university chose SLOAN products as the basis of design for the expansion and renovation of their athletic complex. As a result, Notre Dame is conserving water, saving money, improving hygiene, and paving the way for easy maintenance in the long term. Taking over a project months into the schedule and facing an extremely tight deadline, The Poole and Kent Corporation managed to complete work 15 days early by teaming up with Victaulic’s Virtual Design and Construction (VDC) team. The Victaulic VDC team’s expertise and use of BIM software allowed Poole and Kent to plan and coordinate so that they could make up for lost time on a new Baltimore apartment building. MCAA and our Supplier Partners know contractors aren’t just looking for solutions, you’re looking for Smart Solutions. 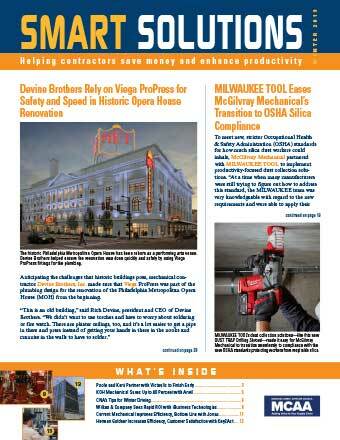 Anticipating the challenges that historic buildings pose, mechanical contractor Devine Brothers, Inc. made sure that Viega ProPress was part of the plumbing design for the renovation of the Philadelphia Metropolitan Opera House (MOH) from the beginning. Within 90 days of adopting the XOi Vision™ platform’s field service management program See, MacDonald-Miller Facility Solutions (MacMiller) landed a huge national account, based in part on the company’s use of video technology. With See, MacMiller technicians can easily link video and photos to customer accounts through mobile devices. By working closely with Daikin on design and modeling, ACCO Engineered Systems successfully installed 875,000 tons of sheet metal, miles of condenser and hot-water piping, and 21 large-capacity Daikin Self-Contained air conditioning (AC) units on a fast-track schedule with no room for delays. The energy-efficient HVAC systems helped the premier $1.2-billion Levi’s Stadium, home of the San Francisco 49ers, become the first NFL stadium to achieve LEED® Gold certification. Based in the San Francisco Bay Area, design-build contractor Western Allied Mechanical, Inc. has been using Viewpoint software for over a decade. As a result, it has streamlined project management and processes—for example, cutting RFI response time from days to minutes. 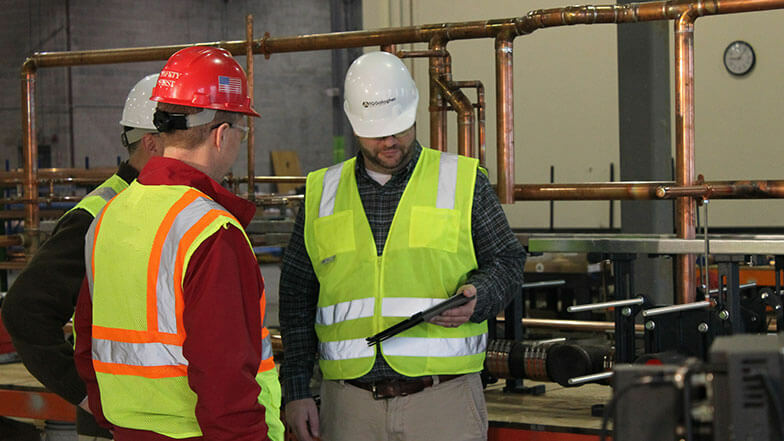 Using KEY2ACT’s Connect technology to gather building data during a year-long retrofit project, Brandt found glitches in the products it was installing and was able to fix them before completing the work—without going over schedule. Brandt also uses Connect during commissioning to validate a building’s entire system at one time, which has proven invaluable. 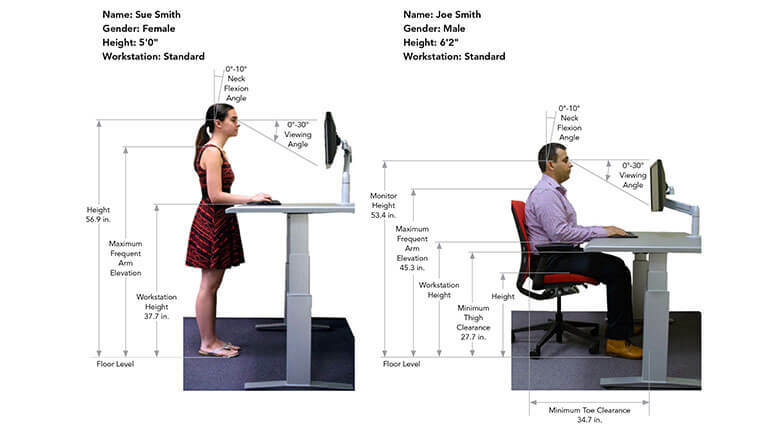 Are Your Office Workers Getting the Same Level of Ergonomics Care as Your Jobsite Workers? Over the past few years, a greater focus has been placed on employee health and wellness as it relates to the issue of sitting versus standing at a computer workstation. The number of sit/stand workstations is on the rise, causing employees to ask the question, “Is a sit/stand workstation right for me?” Working in the same location for hours can affect concentration and muscles, which can in turn affect work productivity. CNA offers this guidance on how to maximize comfort while working at a computer workstation and reduce pain and injuries. For a recent retrofit, Arden Engineering Constructors knew that an accurate as-built assessment of the project was essential to ensure a smooth process, so they put their Trimble® TX6 Scanner and RealWorks® Office software to the test. The scan took one field worker about 4 hours, compared with an estimated 32-man hours for manual measurements—a labor savings of 90 percent. Close coordination with Jay R. Smith Mfg. 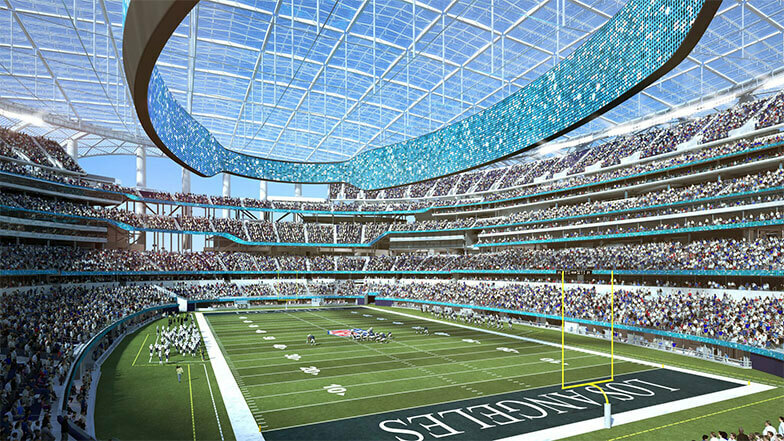 Co. is helping the mechanical design assist subcontractor Pan-Pacific/Murray Company (PPMC) tackle a tough job: building the NFL’s most massive stadium complex. At 3.1 million square feet, the Los Angeles Stadium and Entertainment District at Hollywood Park will house not just a 70,000-seat stadium but also a hotel, offices, retail spaces, residences, and restaurants. Murray CompanyPan-Pacific MechanicalJay R. Smith Mfg. Co.
To meet an engineer’s demanding criteria for embedding hanger assemblies into concrete slabs for a new seven-story building, Wm. T. Spaeder Company used DEWALT HangerWorks™ software, not only achieving the difficult task but saving weeks of layout time as well. 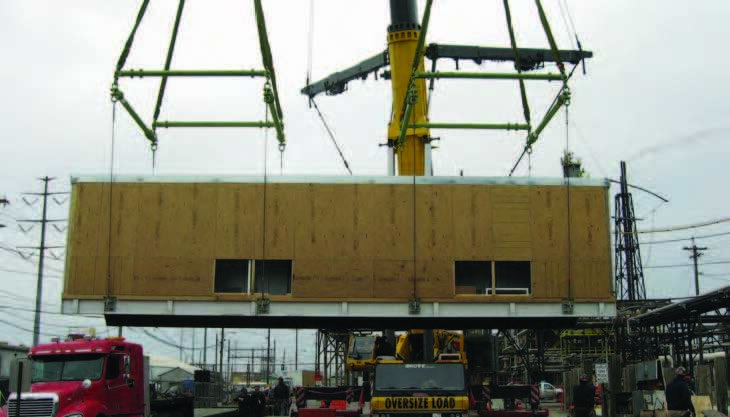 HangerWorks also improved the prefabrication process by enhancing labeling and reporting in Spaeder’s building information modeling (BIM) program. 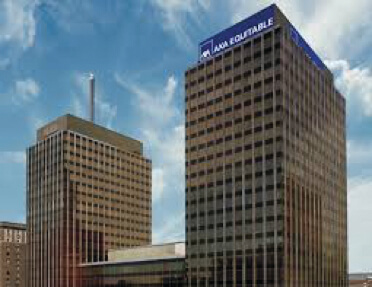 When the Centre Square commercial office complex needed a new cooling tower system, HVAC contractor Herman Goldner Co., Inc. turned to SPX Cooling Technologies to address the building needs, then brought in Erickson Incorporated to conquer the formidable challenge of installing the system in a busy, urban site. 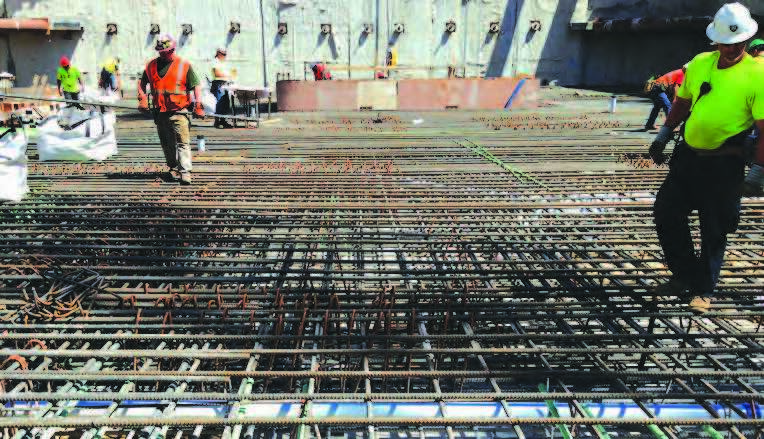 For a record-setting continuous concrete pour, Couts Heating and Cooling, Inc. installed more than 20 miles of Uponor radiant tubing to create a thermal cooling system that would ensure the integrity of the concrete as it cured. Applying this new technique, Couts not only smoothed the way for this rapid, massive project, it also benefitted from the ease of installation. 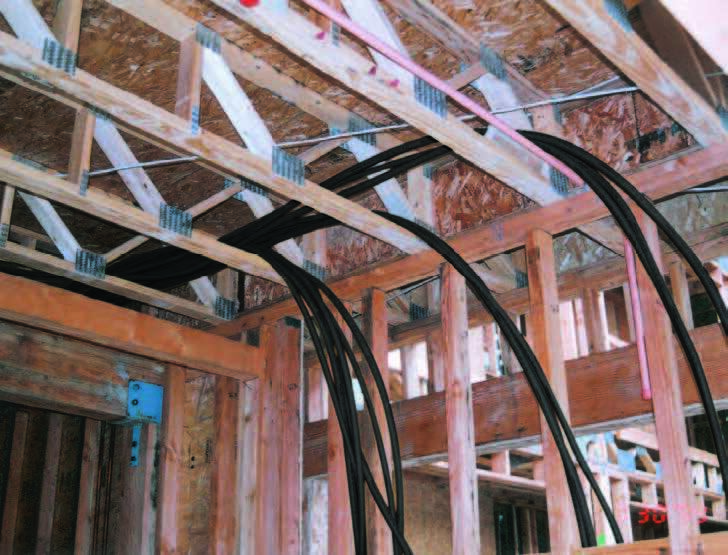 The PEX tubing’s “extreme flexibility made it fast and easy to install around the rebar in the base of the structure,” said Mike Martin, Couts piping department manager. 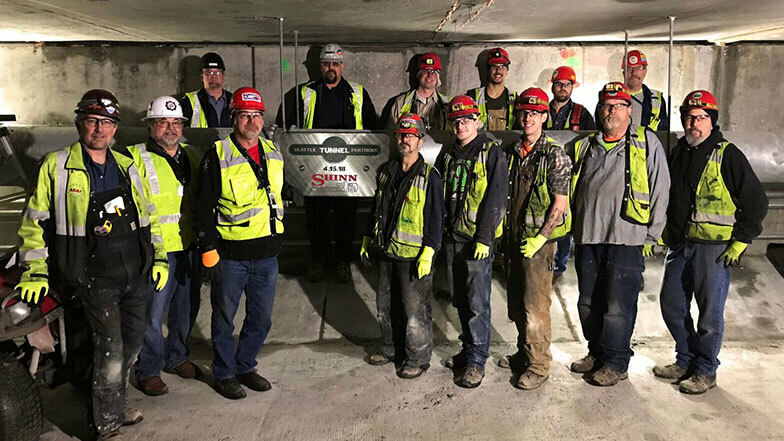 Under pressure to make up for lost time on a huge tunneling project, Shinn Mechanical Inc. used cordless Milwaukee tools to install Victaulic grooved couplings on an innovative piping design, shaving months off the original schedule. 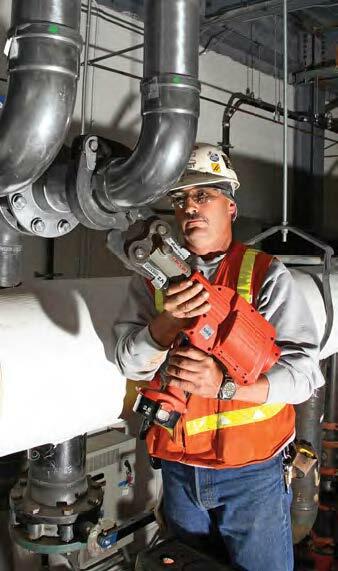 “Pairing Victaulic couplings with Milwaukee tools allowed us to finish a job scheduled to take eight months in only 10 weeks,” said Mike Shinn, company founder. 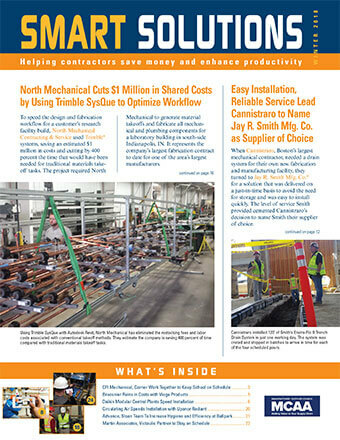 To speed the design and fabrication workflow for a customer’s research facility build, North Mechanical Contracting & Service used Trimble® systems, saving an estimated $1 million in costs and cutting by 400 percent the time that would have been needed for traditional materials takeoff tasks. The project required North Mechanical to generate material takeoffs and fabricate all mechanical and plumbing components for a laboratory building in south-side Indianapolis, IN. It represents the company’s largest fabrication contract to date for one of the area’s largest manufacturers. 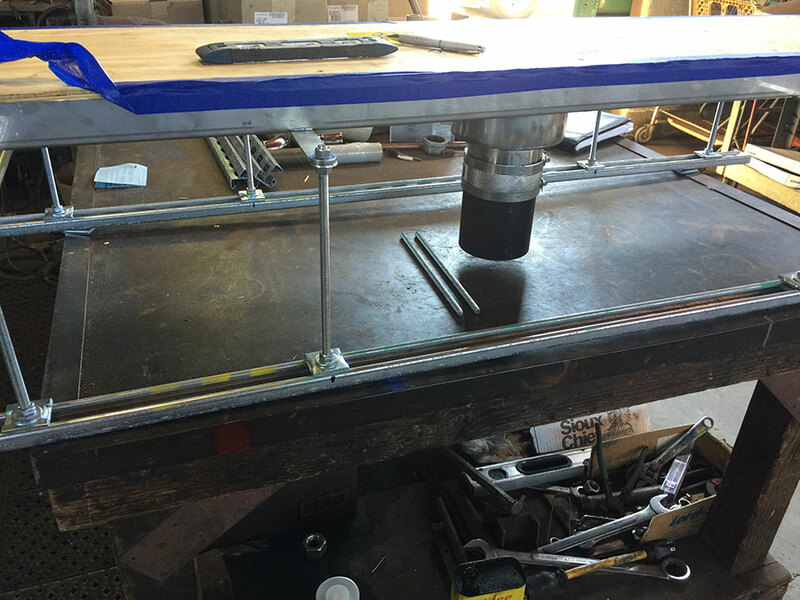 When Cannistraro, Boston’s largest mechanical contractor, needed a drain system for their own new fabrication and manufacturing facility, they turned to Jay R. Smith Mfg. Co.® for a solution that was delivered on a just-in-time basis to avoid the need for storage and was easy to install quickly. The level of service Smith provided cemented Cannistraro’s decision to name Smith their supplier of choice. J.C. CannistraroJay R. Smith Mfg. 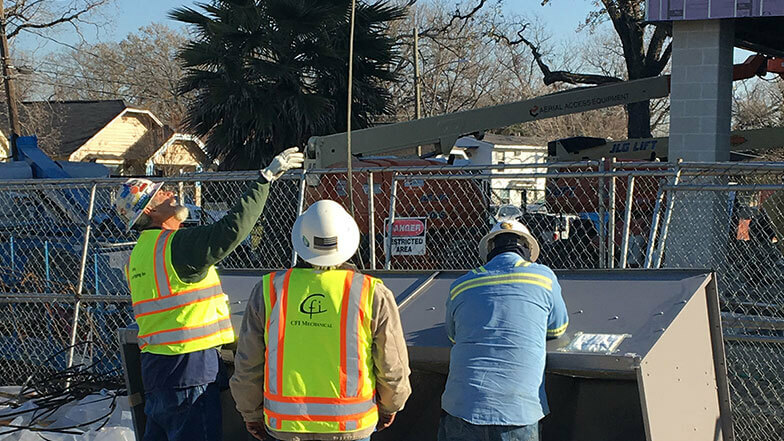 Co.
Close coordination with Carrier on a “just-in-time” delivery schedule is helping CFI Mechanical keep a Houston school renovation project on track while saving the contractor installation time and costs. By using Carrier HVAC systems, CFI mechanical is also meeting the school’s energy-efficiency goals. 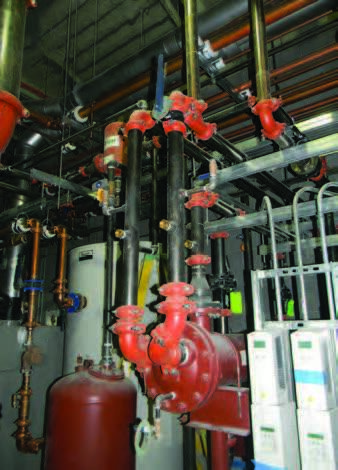 Faced with the possibility of losing money on a building expansion project, Braconier Mechanical and Plumbing found that using Viega products was an easy way to trim costs. The ease of installation with the Viega press approach cut installation time dramatically, bringing costs back under control. In addition, Viega turned out to be a better choice for a job where the original specs called for threading pipe. Wire rope is a machine, and a rather complex machine. There are no precise rules to determine exactly when a wire rope sling has passed its service or expiration date. There are guidelines, though, to follow to know whether a sling is suitable for continued use or needs replacement. What are you doing in your mechanical service contracting business to get more by doing more for your best customers? Do you have a premium program like Amazon Prime that includes exclusive benefits covered by the price of a subscription? Is there a tier of service that includes the basic preventive maintenance program plus a bunch of extras that entices customers to pay upfront? With the ManufactOn cloud and mobile solution, TG Gallagher has increased and improved its prefabrication capacity. The TG Gallagher leadership team can keep tabs on the status of prefab work and materials at all times. The field team can monitor the progress of prefabbed items, request them as they are completed, and tag products to keep track of them. By integrating prefabrication into TG Gallagher’s supply chain, ManufactOn has helped them take the next step in the prefab revolution. Describing the Circulating Air crew’s first experience using Uponor products, Job Foreman Matt Fitzgerald said, “We were truly amazed at how quickly and easily we installed the tubing for the radiant heating and cooling system.” The Los Angeles-based mechanical contractor’s four-man crew installed 16,000’ of Uponor’s Wirsbo hePEX™ tubing in a new research building on the campus of the University of California, Los Angeles (UCLA). 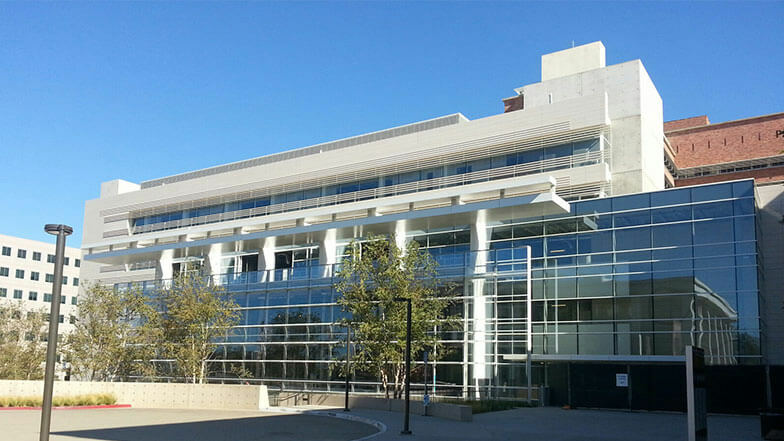 Using the radiant heating and cooling system helped earn LEED® Gold status for the six-story, 100,000-square-foot Edie and Lew Wasserman Eye Research Center. 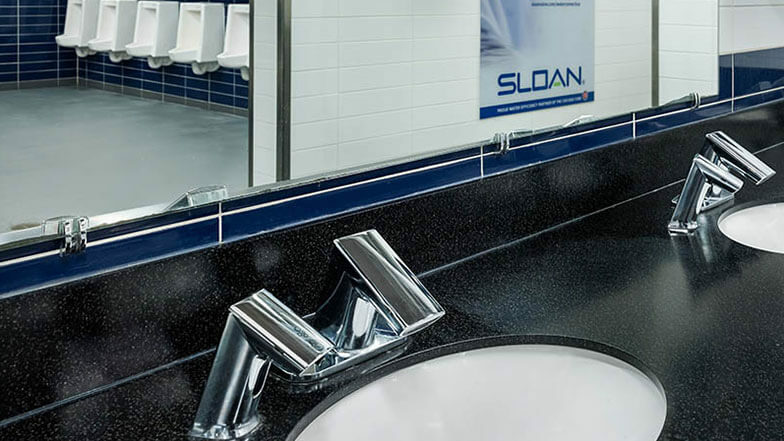 Restoring Wrigley Field was an opportunity for Advance Mechanical to install sleek Sloan products that allow fans to experience an efficient, hygienic trip to the restroom and get back to their seats to enjoy the game. Sloan was named the official Water Efficiency Partner for the Chicago Cubs baseball team in 2015. 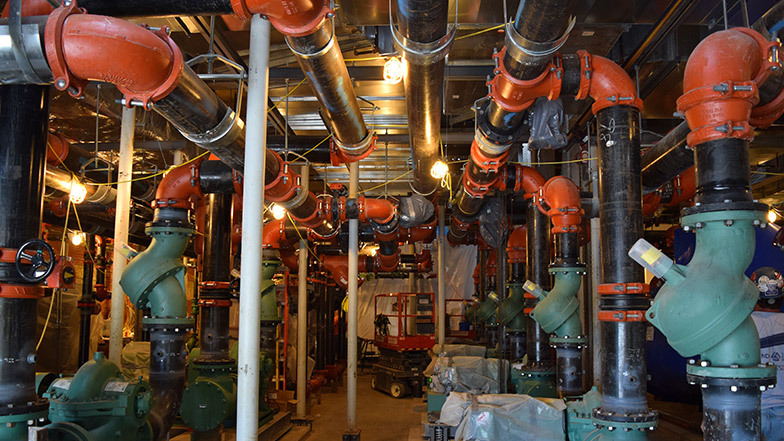 Using Victaulic grooved mechanical solutions and Construction Piping Services (CPS) for a cramped mechanical room in a new luxury apartment building, Martin Associates streamlined its drawing and installation processes, reduced waste, and cut overall project costs by three to four percent. Martin successfully installed, tested, and completed the HVAC system at 525 West 52nd Street in New York City’s Hell’s Kitchen neighborhood in a week and a half, staying on budget and ahead of schedule. Goshen Mechanical is billing on the same day as service, has eliminated lost work orders, and has increased customer satisfaction by adopting MobiliForms from iBusiness Technologies. Cash flow has accelerated from even larger customers, such as hospitals, that now pay in as little as four days when Goshen times the invoice submissions to synch with their accounts payable cycle. “We should have adopted MobiliForms a year ago,” said Chris Gaffney, co-owner of Goshen. Manual collection of paper time cards in the field is prone to errors, takes too much time, and, most importantly, takes attention away from important jobs in the field. Since rolling out Rhumbix so their foremen could go paperless, Independent Mechanical Industries, Inc. (IMI) has found, “Foremen use the Rhumbix app on their iPhones to record time cards in just minutes, [which] allows them to clear their minds and attack the work in front of them,” said David Reynolds, IMI vice president. Anderson, Rowe & Buckley (AR&B) deployed MobiliForms from iBusiness Technologies, cutting labor costs and going paperless painlessly. “Our 100+ field techs are shaving time each day, and I’ve personally recaptured eight hours per week,” said Darin Sheridan, HVAC superintendent, who is tasked with overseeing the solution. 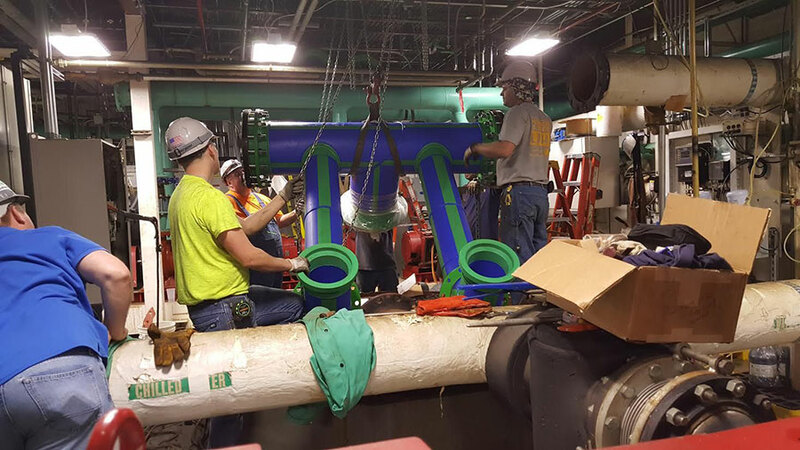 By using Aquatherm polypropylene-random (PP-R) Blue Pipe® to replace carbon-steel pipe at Berry Global’s injection-molding facility, the P1 Group of Lawrence, KS, successfully completed installation in just 24 hours. The lightweight pipe is easy to transport and easy to join using a flameless heat-fusion technique that saves time. The speed of installation was more than just a productivity win for the contractor; at Berry Global, a mere half-second loss in production time can cost tens of thousands of dollars. Faced with new, more stringent building requirements mid-project, J.W. McClenahan Co. got a boost from the engineers at Jay R. Smith Mfg. Co.,® who rapidly designed new trench drains and had them verified by a third party to satisfy city inspectors—all in just four months. J.W. McClenahan Co.Jay R. Smith Mfg. 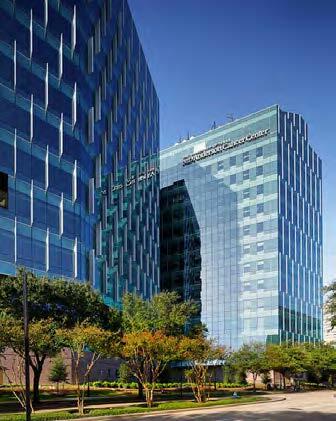 Co.
John E. Green Company (JEG) trusted its longtime partner, Johnson Controls, to help them meet the demands of Detroit Medical Center’s (DMC’s) new tower and identify products that could save the contractor installation time. YORK® YMC2 centrifugal magnetic drive chillers paired with the Metasys® building automation system (BAS) with Central Plant Optimization 10 (CPO10) optimized energy efficiency, while using YORK Solution Air Handling Units and SimplexGrinnell’s addressable notification system ensured speedy installation. Savvy design from Anvil® International allowed Bennell, Inc. to install all the needed systems in the very small mechanical room of a new residence hall and bookstore at Bloomsburg University of Pennsylvania. 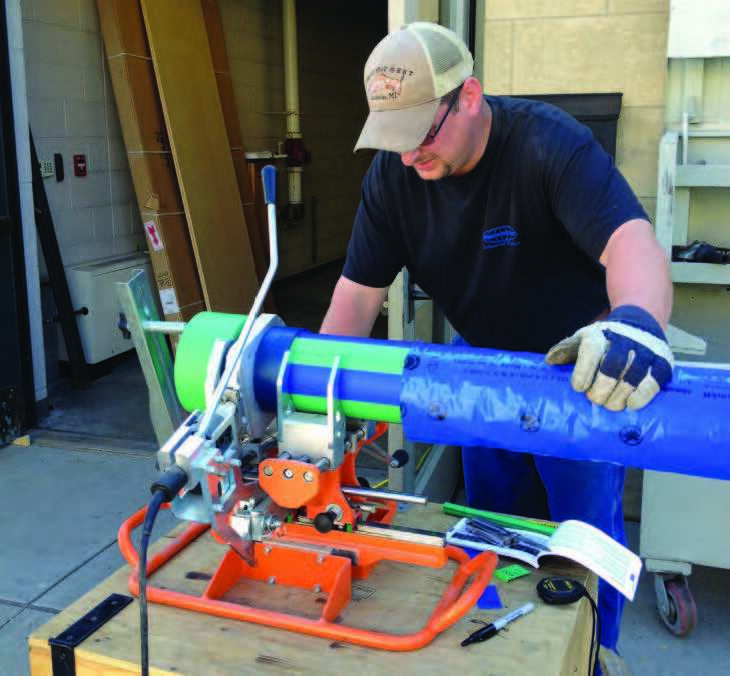 Because of the creative design, which included Anvil’s Gruvlok® connections for the heating and cooling pipe, Bennell managed to “make 10 pounds fit in a five-pound bag,” said President Craig Hosler. 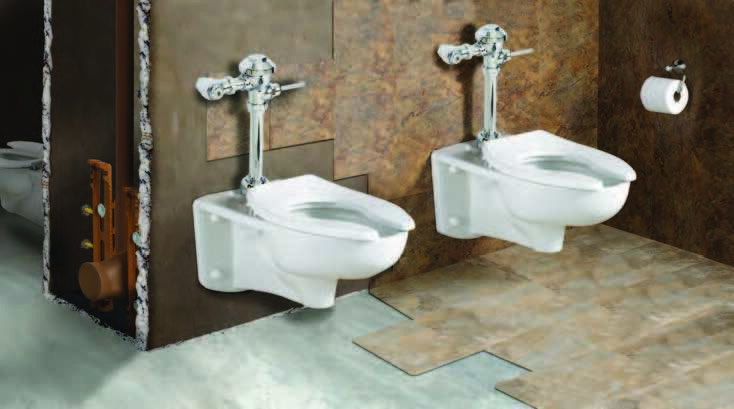 While renovating a historic building, Commonwealth Plumbing found that Viega’s double drop elbows were the best solution for accommodating new bathroom sinks in a tight space with limited design options. By using pressed fittings, Commonwealth not only saved time on installation but also avoided soldering in an old building with a lot of wood. To meet the stringent standards for climate control required to protect its treasured artwork and artifacts in storage, the University of California Berkeley’s Regatta Museum installed Daikin Rebel® commercial rooftop systems, paired with the Daikin Intelligent Equipment® solution that provides real-time data. 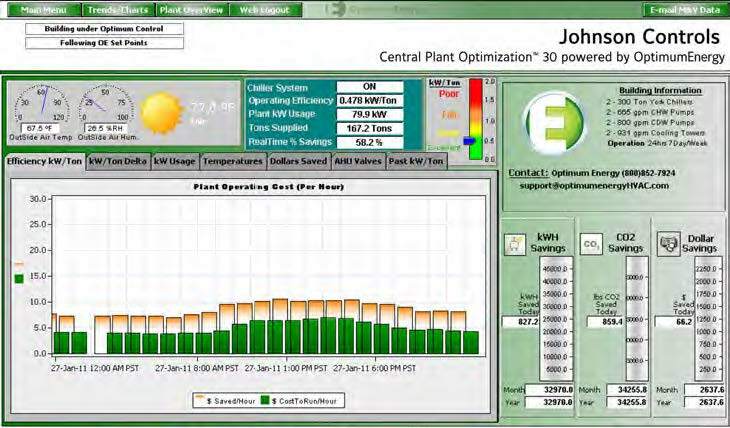 Using the software solution saved time and money during the 6-week startup and commissioning process of a critical control application where rooftop package units are seldom used. 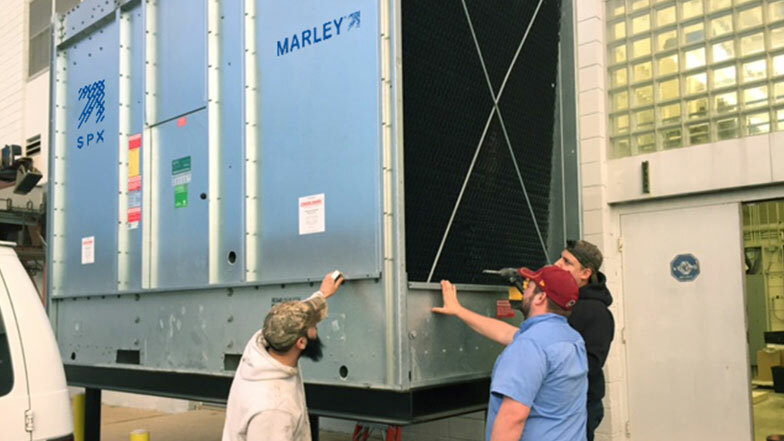 When the Steamfitters UA Local 602 Mechanical Trades School needed equipment to use in its apprenticeship program, SPX Cooling Technologies donated a Marley® NC cooling tower, enabling the school to present students with a real-world environment. Instructors use the complete new cooling system to teach students how to troubleshoot and fix problems with HVAC systems. 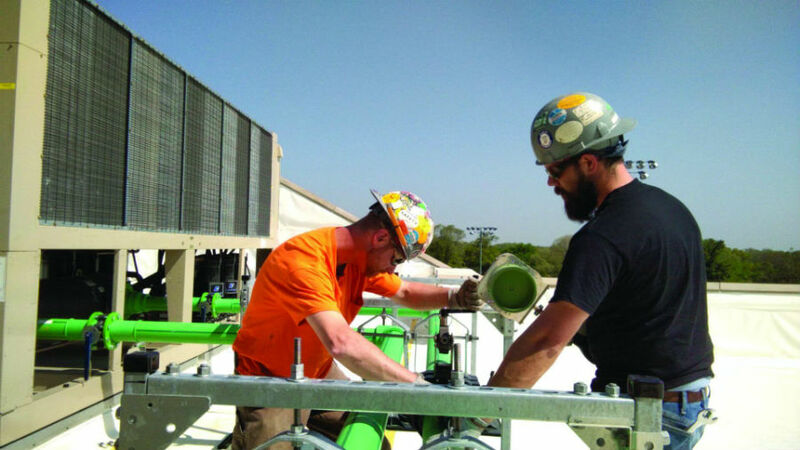 In the summer of 2016, The Hill Group called on Erickson Inc. to lift and place cooling towers and chillers by air into a building in crowded downtown Chicago, accomplishing the goal in hours compared with weeks needed for other methods. The project was located at East Randolph Street in a crowded landscape with multilevel streets and nearby residential buildings, so land crane equipment was not an option. Using Erickson’s precision capabilities, aerial crane operators placed chiller equipment through a hole in the roof, with inches to spare, and then set it 15’ below the roof level. Contracted to design and install the mechanical, electrical, plumbing, and fire protection systems for a massive renovation, Arden Building Companies faced a tight timeline, a tight space, and a tight budget—all of which made welding a poor choice for completing the mechanical room. 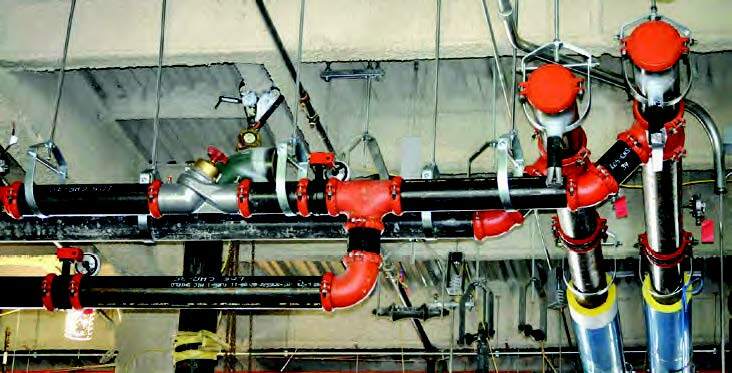 Using Victaulic’s easy-to-install grooved connections, Arden joined, hung, and installed pipe quickly and efficiently once it was lowered into the mechanical room. Arden estimated that the speed of installation reduced overall costs by approximately $100,000. 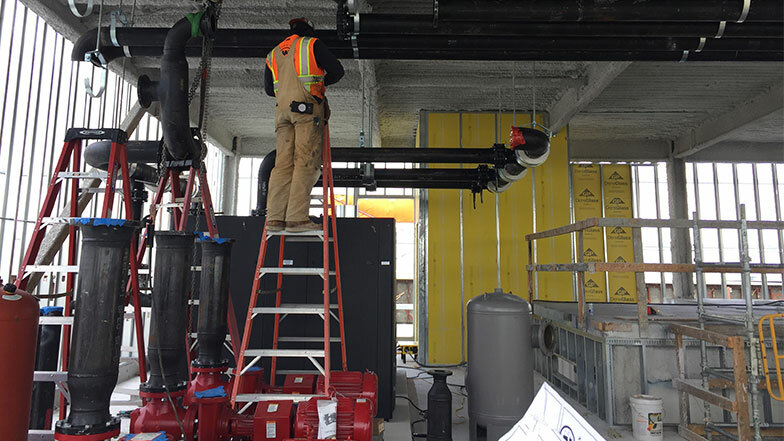 In 2015, Atomatic Mechanical Services won the bid to install a large chiller plant in a renovated office building in Chicago’s West Loop and chose Wheatland Tube pipe for nearly every part of the project. Atomatic knew that reliable, high-quality, domestic pipe is easier to weld then imported pipe and much less likely to deteriorate or cause leaks—so it would save Atomatic time both onsite and after installation. As expected, the system has had no leaks, which helped allow the chiller plant to become operational two weeks ahead of schedule. JH Kelly recognizes how much time and money it stands to lose when tools are lost or stolen. 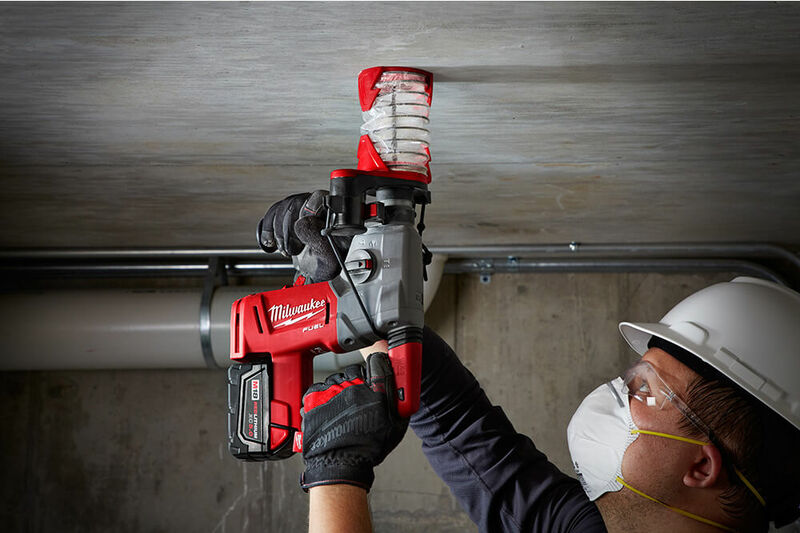 To avoid delays on the job or, worse, the cost of replacing expensive equipment, they adopted Milwaukee Tool’s One-Key™ system, the first digital platform for tools and equipment. 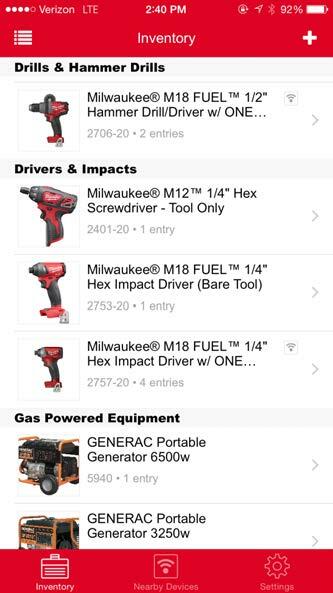 Now, with the addition of Milwaukee Tool’s TICK™ equipment tracker, they can manage inventory, recover tools quickly—and even locate lost items. 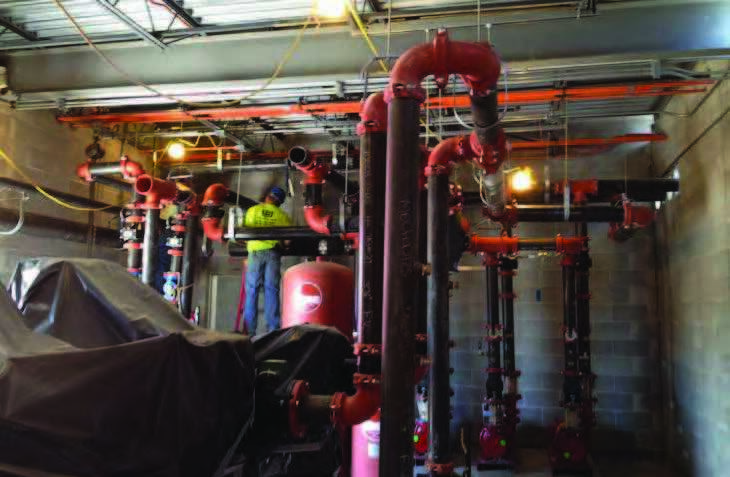 Metropolitan Mechanical Contractors (MMC) of Eden Prairie, MN, found that using Uponor’s AquaPEX® crosslinked polyethylene (PEX) piping for the risers and the unit piping in a new hotel saved crews about two to three days of installation per floor. On a 13-story project with 50 units per floor, that adds up to almost a month of installation time savings. Egan Company installed the MobileTech solution from KEY2ACT, slashing billing time and eliminating time-consuming paperwork. 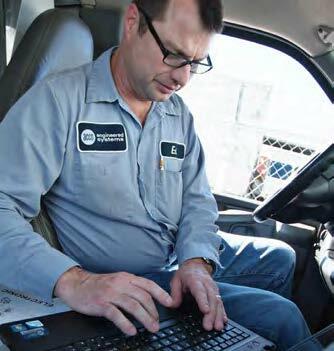 Jeff Hawthorne, Egan’s senior vice president, estimated that Egan will see its return on investment (ROI) within 18 months of implementing MobileTech, which connects field staff to the back office, providing instant access to information and enabling both sides to easily manage service calls and appointments. 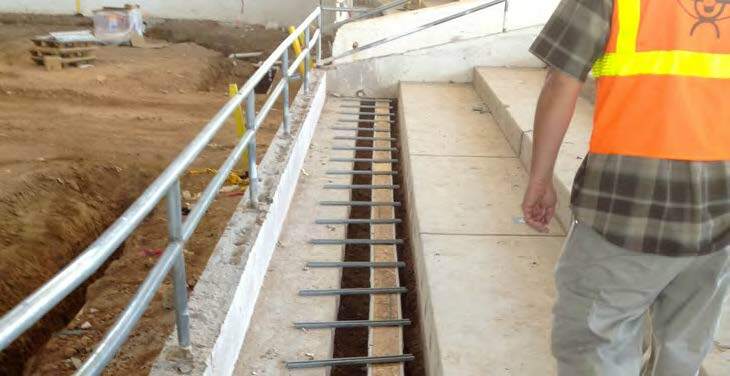 With its light weight and easy installation, Josam Company’s Pro-Plus trench drain system not only minimized hassle for Miinc Mechanical Contractors of Dallas, TX, but it also saved them labor and installation time. 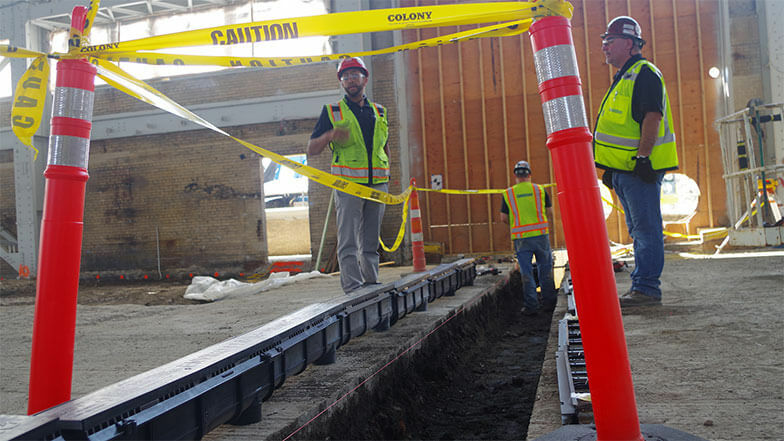 Instead of using three or four workers to install the trench drain, Miinc needed only one or two workers laying the Pro-Plus system during a recent project for Southwest Airlines. Implementing a fully automated, integrated software solution from Jonas Construction Software helped Flo-Tron Contracting streamline their business, enhance efficiencies, and reduce payroll processing time by 50 percent. “The software we were using prior to Jonas was very limited, and we found ourselves having to regularly pay for external services and consultants to handle many of our business processes. With the fully-integrated nature of Jonas, we could handle all facets of our business in-house, which truly helped us meet all of our needs in a single software solution,” said Kari Cordell, controller at Flo-Tron. 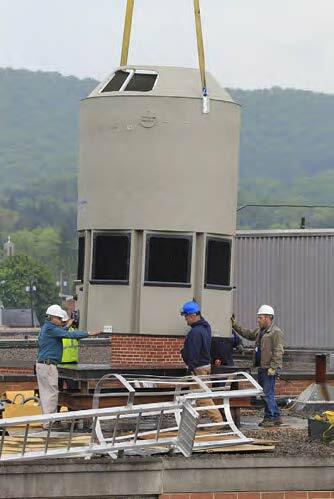 Only EVAPCO, Inc. had cooling towers with a small-enough footprint, yet large-enough capacity, to meet WellSpan Gettysburg Hospital’s need for upgraded towers that would lend themselves to future expansion. Manchester, PA-based James Craft & Son Inc. worked closely with EVAPCO to find the perfect solution to a challenging installation. 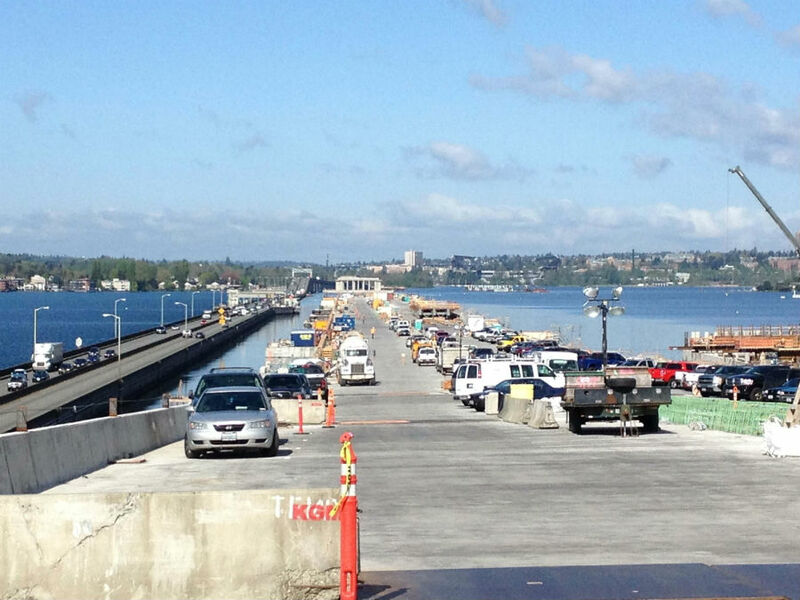 For Seattle’s new State Route 520 Evergreen Point Floating Bridge, Diamond B Constructors, Inc. knew they could count on Anvil International for flexible couplings and fittings for the Schedule 40 pipe of the bridge’s wastewater removal system. In addition, because Anvil’s products used on this project were manufactured in its U.S. plants, they satisfied the requirements of the Federal Highway Administration for American-made construction supplies. 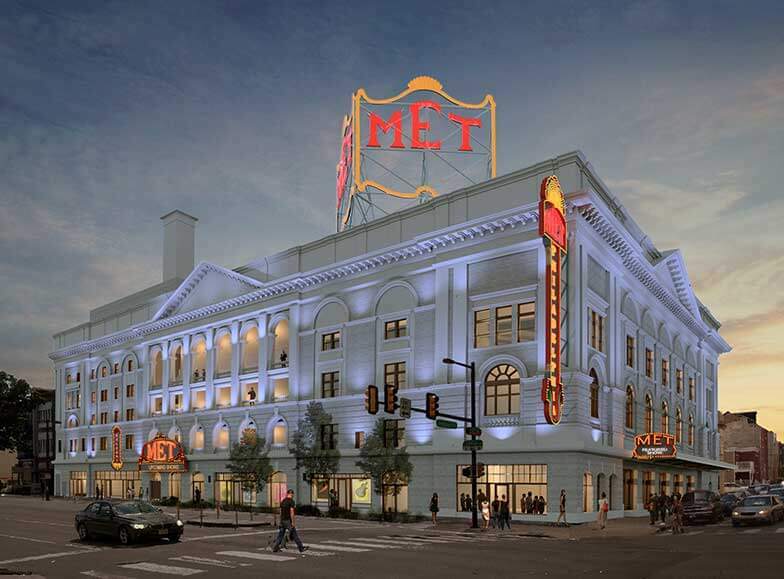 Victaulic’s project management, coordination, and new 3D scanning technology allowed Western Mechanical Contractors, Inc. to cut days off the schedule for a historic building renovation, cutting labor costs and keeping the project on time and within budget. 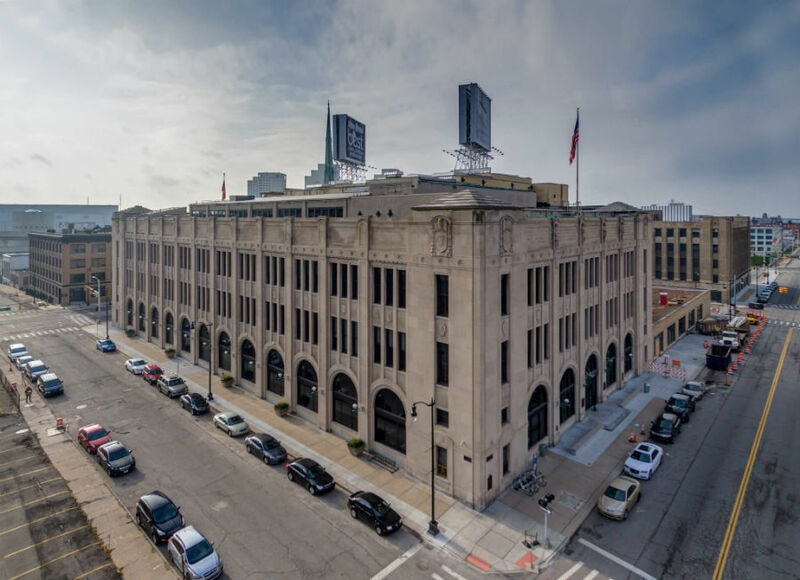 The 100-year-old Detroit News Building in downtown Detroit, MI, posed several challenges to restoration—including one tenant who remained in the building throughout the project. 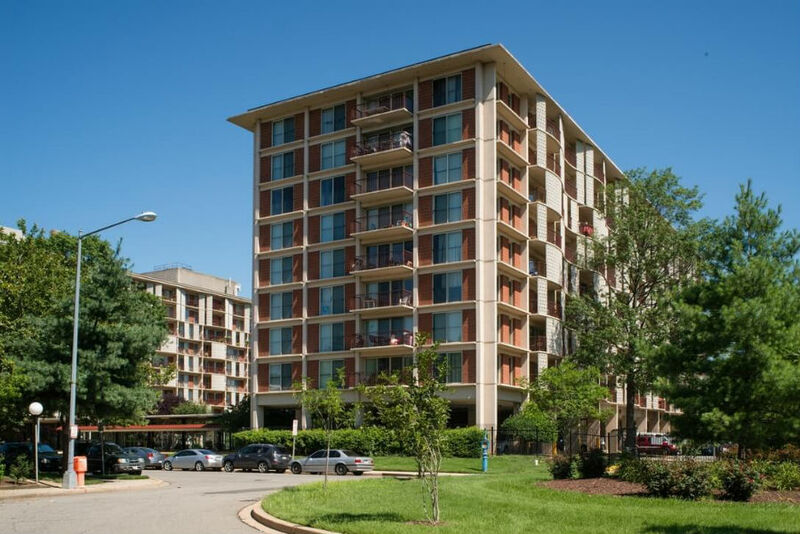 Owners of a Washington, DC, apartment complex undergoing renovation selected Daikin products for their reliability and energy-saving potential. 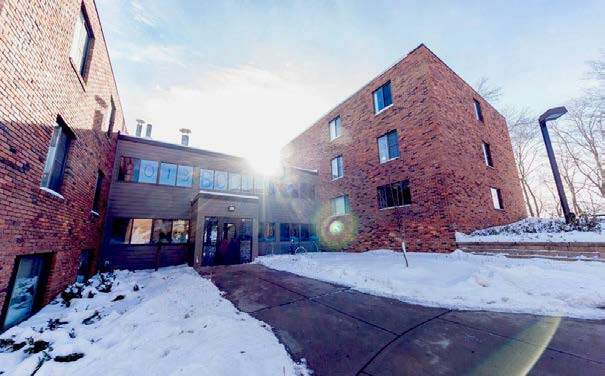 The choice not only improved comfort and energy efficiency in the buildings but also netted a $62,000 rebate from the local electric utility, enhancing the owners’ return on investment. 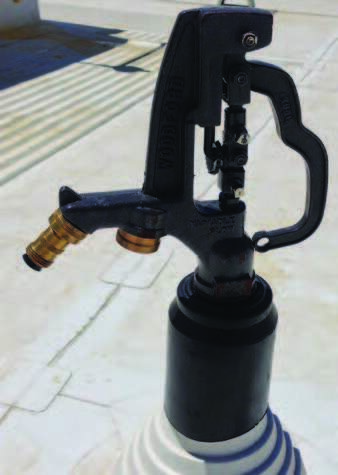 To repair a refrigerant leak in the computer room of an office tower tenant, Davis Mechanical Service, Inc. turned to Parker Hannifin Corporation’s ZoomLock™ Braze-Free Fittings, avoiding the need to use a torch or get a burn permit. 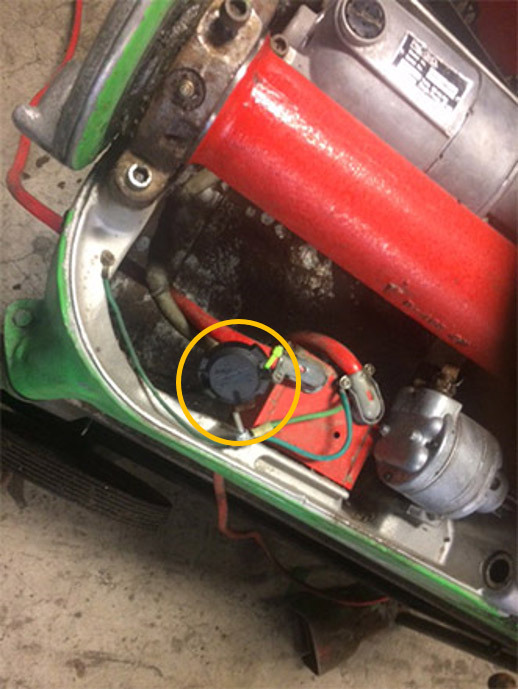 As a result, Davis Mechanical completed the whole repair in less than an hour and with minimal disruption to the client. 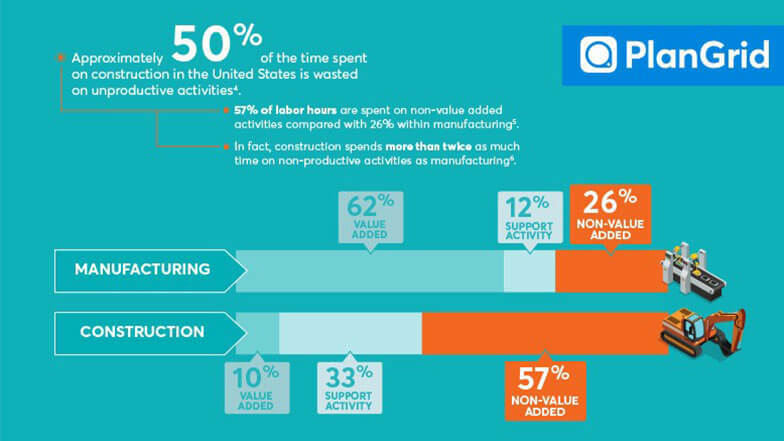 Manual material handling is the largest single cause of lost workday injuries in construction. One out of every four work injuries happens because someone lifted, carried, pushed, or pulled something the wrong way or lifted beyond his or her capacity. Workers should be trained on proper and safe material handling techniques either manually or by using mechanical means. The use of correct handling techniques is one of the ways to help reduce injuries. 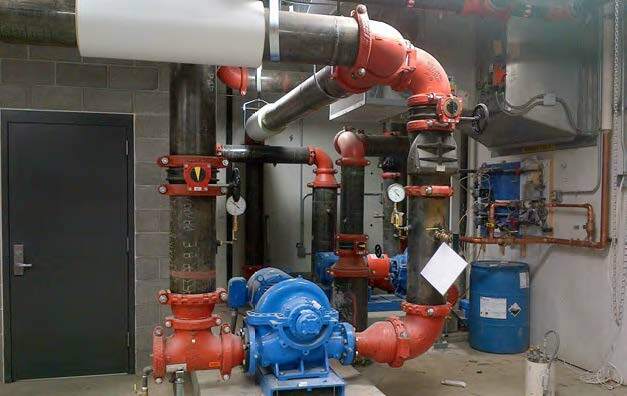 John E. Green Co. of Highland, MI, cut labor and installation time by using Aquatherm’s polypropylene-random (PP-R) pipe systems for a 2013 project at the University of Detroit Jesuit High School and Academy (U of D Jesuit). 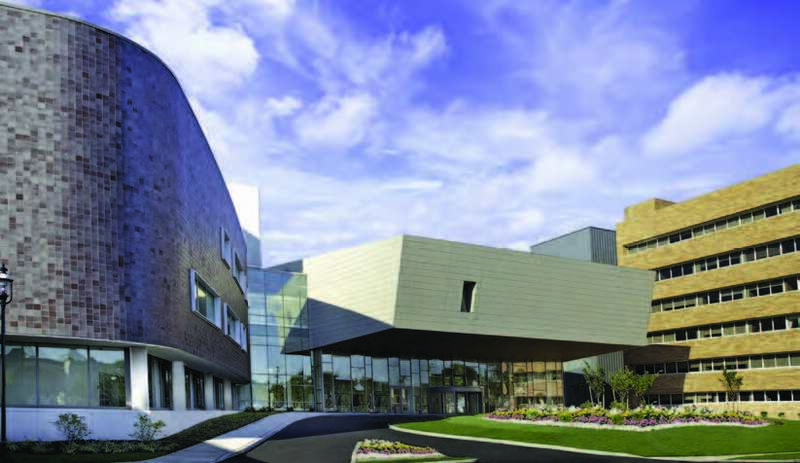 The project went so well that when U of D Jesuit and John E. Green teams reconvened in 2014 to plan the school’s new science building, no other piping options were considered. Just one year after investing in the BuildingAdvice Energy Services Delivery platform, T.H. Eifert Mechanical Contractors has generated in excess of $400,000 in new preventive maintenance (PM) contracts and pull-through sales, providing a sizable, early return on investment. 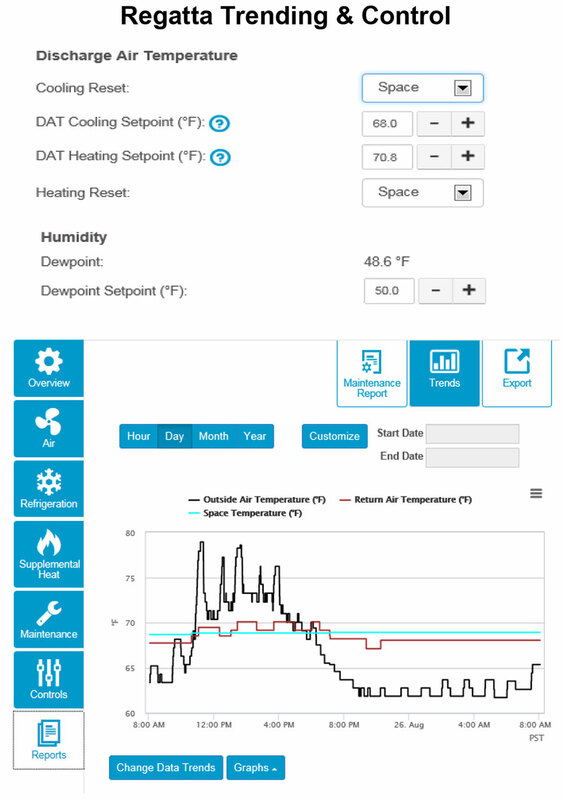 The energy assessment and tracking tools from BuildingAdvice help T.H. 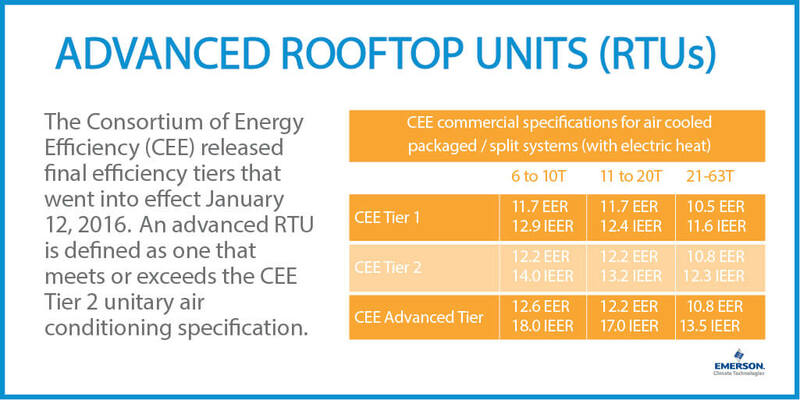 Eifert make a solid case for installing and maintaining energy-efficient products. 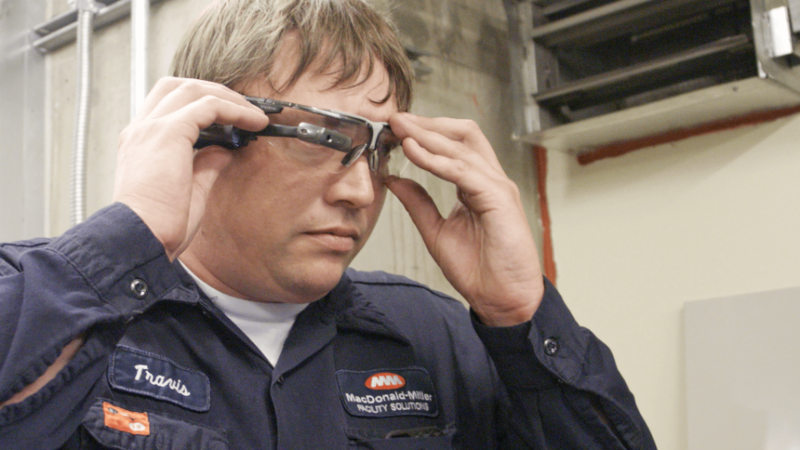 MacDonald-Miller Facility Solutions partnered with KEY2ACT to create See, software that allows contractors to use smart glasses on job sites to capture photos and videos of their work. The new technology helped MacDonald-Miller speed up customer payment and dramatically cut down the time spent explaining work that was done to customers disputing charges. It also increases customer engagement, building trust and leading to new work. 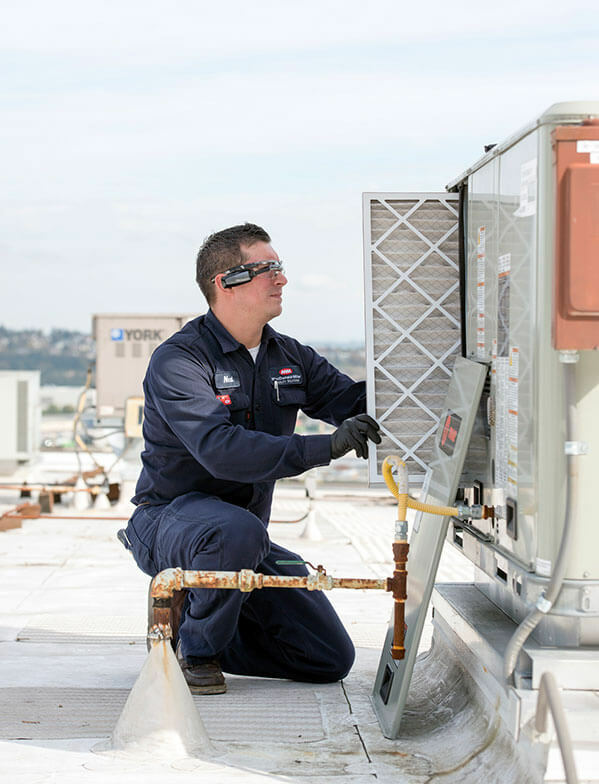 While refrigerant recovery is accepted as a fact of life for today’s air conditioning and refrigeration (AC/R) technicians, it remains one of the most time-consuming steps in servicing an AC/R system. This can make it tempting for a technician on a tight schedule to skip the recovery process. However, with the proper understanding of equipment and methods, refrigerant recovery can be faster and easier than venting. Just like tires can affect a car’s performance, the hoses, fittings, manifold, and recovery cylinder all play a role in how quickly and efficiently the recovery process is completed. Emerson conducted a survey in 2015 of more than 450 HVAC professionals and found that only 11 percent are aware of upcoming commercial HVAC regulations and many don’t understand how those regulations will impact their business. Here are 10 things you need to know about the changes affecting the commercial air conditioning (AC) market. Team IndustriesMiller Electric Mfg. Co.
To combat the signs of mold and mildew growth, a Southeastern U.S. house of worship installed the APR Control manufactured by Rawal Devices, Inc. to eliminate the humidity causing the problem. Thanks to the new control, the organization avoided major health effects and was able to restore its facility to full use. When Graves Mechanical, Inc. formed Graco Mechanical, Inc.—a 24/7 service arm concentrating on preventive maintenance—the company needed a business solution that would support its essential and continuous office-to-field communication and its promise to stay constantly connected and available to customers. 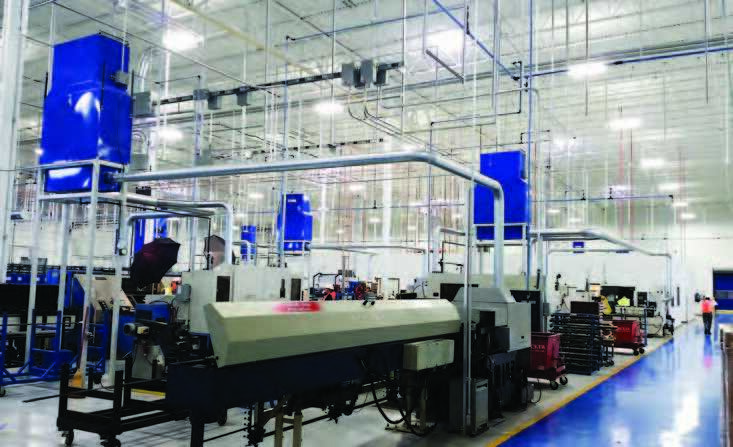 In addition, Graco Mechanical needed to expedite many of its processes, especially its 10–14-day billing turnaround time. With Davisware technology, the company reduced its billing turnaround time to 3–5 days and decreased its invoice processing time. In addition, Davisware’s Remote Field Service solution allowed Graco Mechanical to reduce its gas costs by 10–20 percent. Ease of installation and reliability made the Woodford RHY2-MS roof water hydrant the ideal choice for a school in Parker, CO. Roof hydrants provide access to rooftop water, which is then used to clean condenser coils, windows, cooling towers, green roofs, and other types of rooftop equipment. 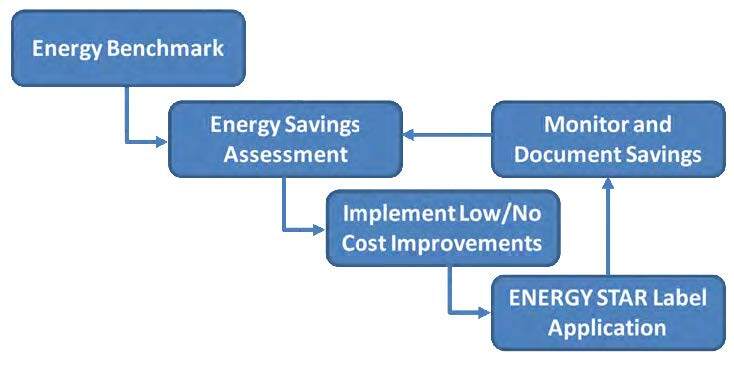 After completion of an HVAC controls retrofit project, Western Allied Mechanical engaged AirAdvice energy analysts to demonstrate that the upgrades yielded a return on investment (ROI) of 65 percent and a payback time of 1.5 years. Being able to demonstrate rapid ROI on HVAC upgrades gives the contractor a significant competitive advantage. Installing Viega ProRadiant™ systems as part of the renovation of New York City’s famous Tavern on the Green restaurant was a simple process—so simple, in fact, that Robert Stewart, steamfitter foreman for Vanguard HVAC Technologies, joked, “I was disappointed there wasn’t more to do.” Completing the radiant floor heating installation quickly allowed the rest of the project to move forward. Take a look around your company. Chances are, your workplace has changed in the past 10 years. Your workforce has changed as well. Regardless of industry, the U.S. workforce is aging. The U.S. Bureau of Labor Statistics has estimated that 25 percent of the workforce will be age 55 or older by 2020. This aging workforce brings with it the potential for escalating workers’ compensation costs, particularly since older employees typically experience more severe workplace injuries and illnesses than younger ones. With 26,000 students and a growing campus, Florida’s Nova Southeastern University (NSU) was challenged with finding a reliable cooling system that kept both expenses and the environment in mind. 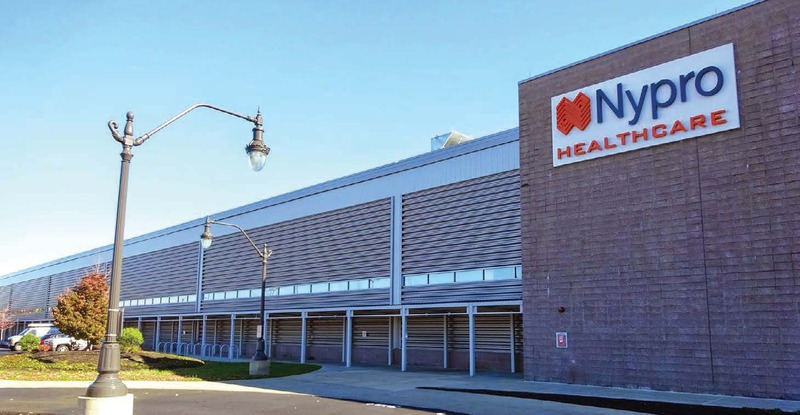 Baltimore Aircoil Company (BAC) and Hill York mechanical contractors worked together to find a solution for NSU, finally settling on BAC’s innovative ice thermal storage. Now, NSU is reducing their peak electrical demand and saving electricity costs while remaining environmentally sensitive. 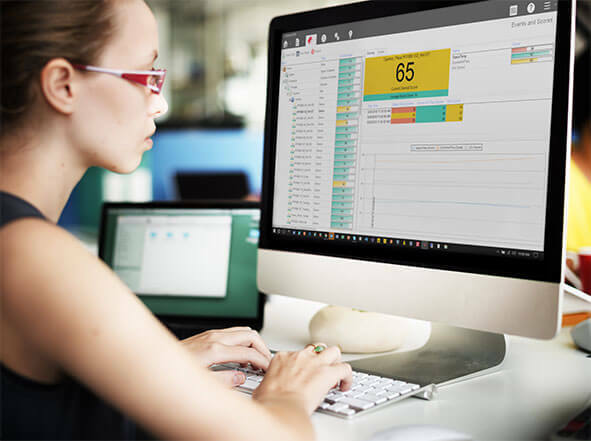 When a business has been using the same software system for years, it is easy for employees to get trapped in a cycle of doing things the way they have always done things. It does not occur to them that there are different—and sometimes better—ways to tailor their software to fit their needs. A GPS tracking system can make your fleet more effective and efficient. GPS Insight suggests what to look for when buying a system. 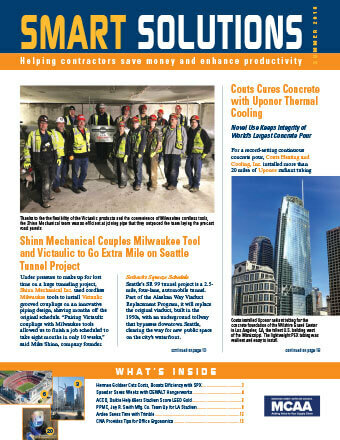 By moving from an outdated accounting system to WennSoft Signature® and Microsoft® Dynamics® GP, Chicago-based HVAC firm Atomatic Mechanical Services dramatically streamlined its accounting processes, improved its service management capabilities, enhanced its customer service, and boosted employee productivity. The Department of Energy’s (DOE’s) new energy efficiency mandates, which take effect April 16, 2015, will require higher energy factor (EF) ratings on virtually all residential gas, electric, oil, and tankless gas water heaters. These changes will impact how water heaters are manufactured, distributed, and installed. 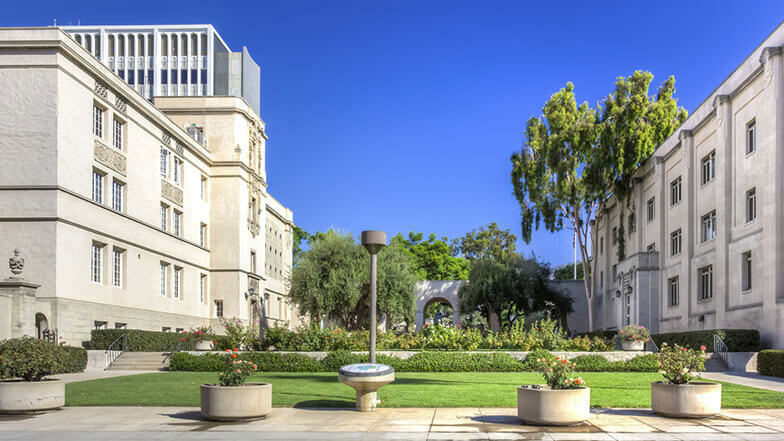 By installing new BITZER compressors to replace aging, inefficient, and unreliable technology, ACCO Engineered Systems of Glendale, CA, helped Cedars Sinai Medical Towers in Los Angeles improve the health of its two 11-story buildings. The upgrade not only met the needs of the building’s inhabitants but also qualified for a substantial rebate. For a challenging project with a short timeline, BMW Constructors, Inc. (BMWC), partnered with Lifting Gear Hire (LGH), who not only supplied the appropriately sized, tested, and certified lift equipment but also expertise in developing a lift plan. As a result, BWWC set two 15’ x 52’ cooling tower unit sections inside an active, working refinery without disrupting day-to-day operations, completing the project on schedule and under budget. 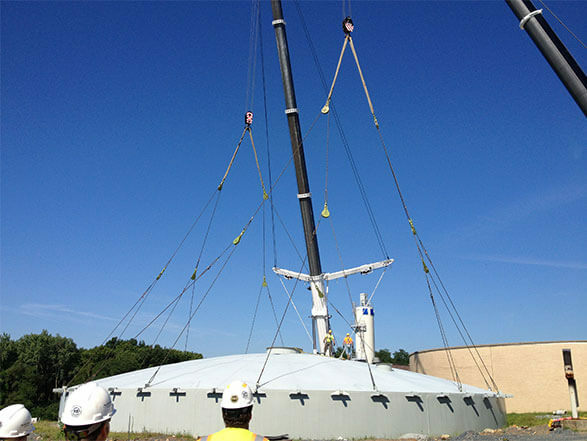 In addition to coordinating placement and use of a 550-ton crane, submitting an engineer lift plan for approval, and preparing the site to meet the project soil compaction requirements, BMWC was also responsible for removing the HVAC/scrubber units. 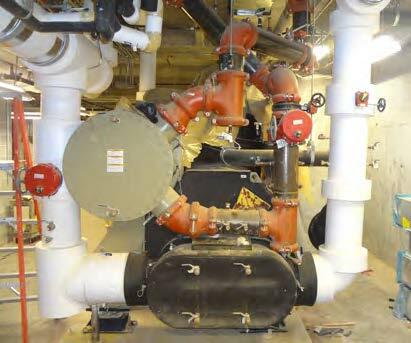 Minimizing installation time was an especially high priority for Braconier Mechanical & Plumbing Services’ work on a children’s hospital, so they used Jay R. Smith Mfg. Co.’s new Quarterback Water Closet Support for the project. Tom Stone, president of Braconier, said the Quarterback provided a 50-percent labor savings because it’s quicker to build and assemble and more adjustable, offering more flexibility when compared with the older Linebacker model. Braconier Mechanical & Plumbing ServicesJay R. Smith Mfg. 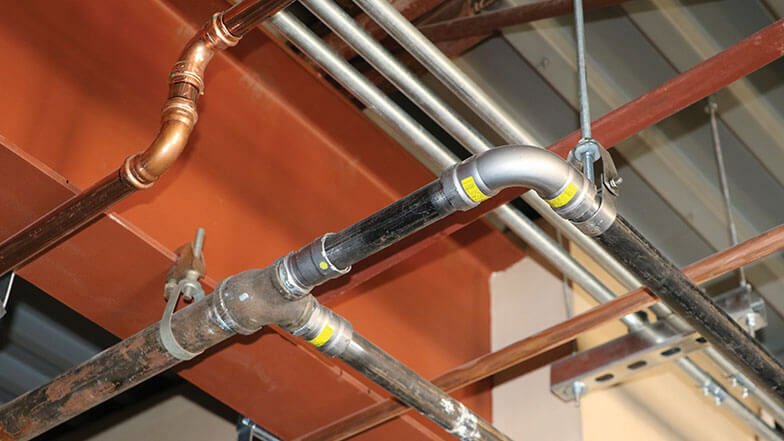 Co.
For the gas piping in the new Candlestick Heights apartment complex in San Francisco, CA, Broadway Mechanical-Contractors, Inc. (BMC), chose TracPipe CounterStrike® because it is easier to install than traditional black iron pipe, saving BMC time and money. The fact that TracPipe CounterStrike, OmegaFlex’s premier corrugated stainless steel tubing (CSST), provides vastly superior safety performance in earthquakes made the product the ideal choice for the job. 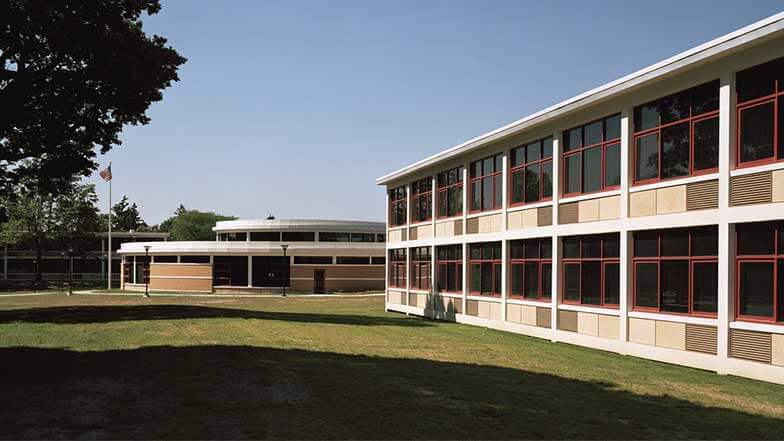 To install a central air conditioning system in a high school campus’ main residence building during the short summer break, John E. Green Company called on Aquatherm for an easy-to-install, in-ground piping solution that allowed them to meet the rush deadline. 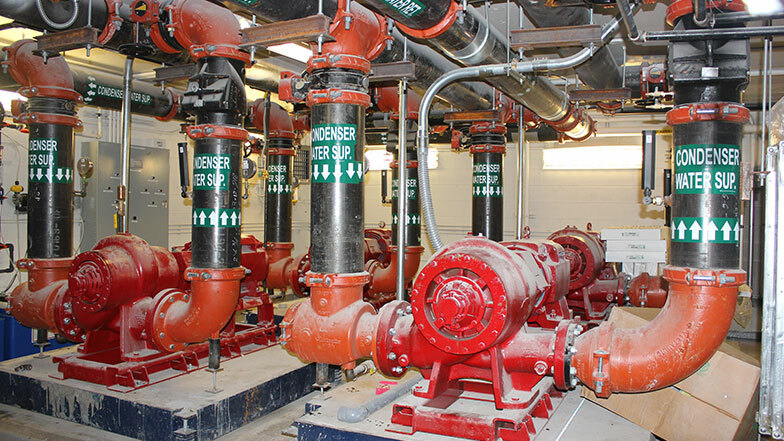 The Aquatherm piping also proved to be an environmentally friendly solution for the University of Detroit Jesuit High School and Academy (U of D), addressing concerns about the potential problems of burying pipe. 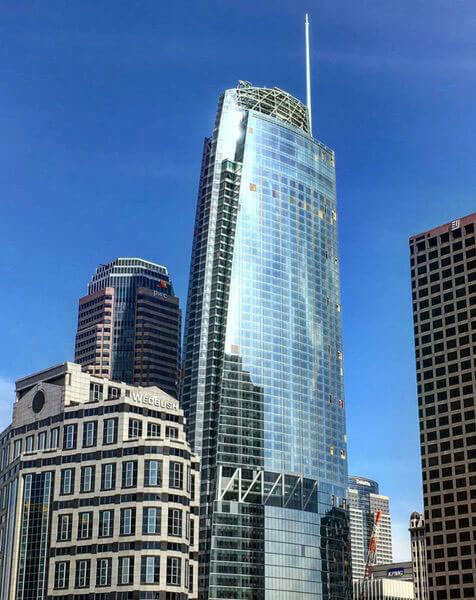 To install the mechanical system for the International Gem Tower, one of New York City’s largest HVAC installations, A. D. Winston Corporation turned to Victaulic, a global manufacturer of mechanical grooved systems and services. 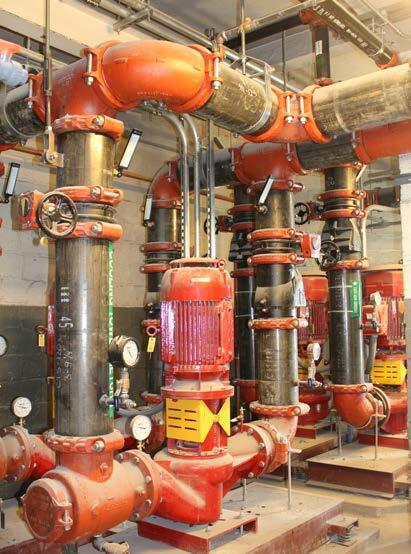 Contractors at A. D. Winston are well versed in working with mechanical systems in the five boroughs of New York City. The firm specializes in hotel, institution, residential, commercial, and health facilities. Are You Ready for the January 4, 2014, Lead-Free Compliance Deadline? The Reduction of Lead in Drinking Water Act (U.S. Public Law 111- 380) goes into effect nationwide on January 4, 2014. It reduces the allowable lead content of all products that come in contact with drinking water or water for human consumption. Beginning in January, no one can install or sell products that are not deemed lead free for water systems designated for human consumption, including cooking. Cincinnati, OH, plumbing contractor Nelson Stark Company is installing thousands of feet of Viega ProPress systems for both copper and stainless steel in sizes ½” to 4” at Mercy Health—West Hospital, currently under construction on 60 acres in Ohio’s Green Township. It is the latest addition to the Mercy Health system, which has more than 80 network locations throughout Cincinnati. Using Wade’s HydroMax® siphonic roof drainage system, a Wal-Mart in Chatham, IL, reduced the number of large pipes needed from 14 to three, thus saving installation time and material costs. Mercy Hospital in Des Moines, IA, turned to Wade’s HydroMax siphonic system to solve a space conflict—there was no room left in the ceiling space for the drainage pipes needed. 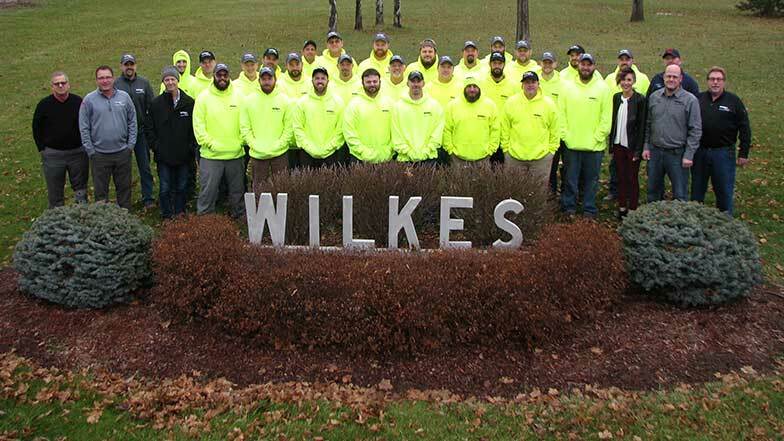 To meet growing demand, Michigan based De-Cal, Inc., opened its own fabrication shop with four multiprocess pipe welding systems (the PipeWorx Welding System from Miller Electric Mfg. 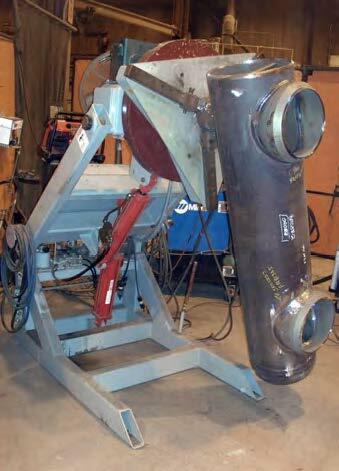 Co.), along with a series of weld positioners. The speed and ease of use of the PipeWorx welding process has helped De-Cal refine its pipe welding processes to significantly improve productivity by as much as 30–40 percent and grow business. 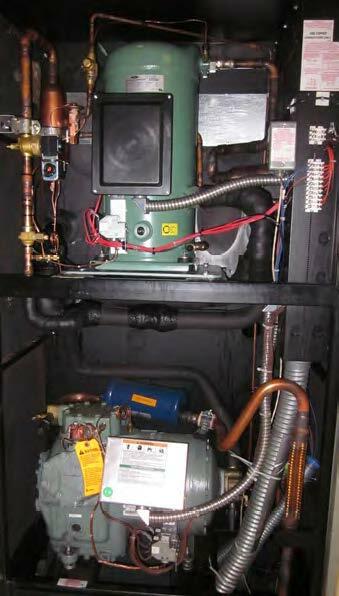 Temp-Control Mechanical Service (TCMS) was confident that the BuildingAdvice™ suite of energy services from AirAdvice would help them win a preventive maintenance (PM) contract and deliver measurable energy cost savings to The Avamere Group, a family of more than 40 senior living facilities in the Pacific Northwest. In their first meeting with Avamere, TCMS uncovered concerns about operating costs and a less-than-robust PM program implemented by onsite staff with little HVAC experience. To demonstrate their capacity, TCMS proposed an action plan that included surveying, benchmarking, and collecting cost data at three of Avamere’s facilities. 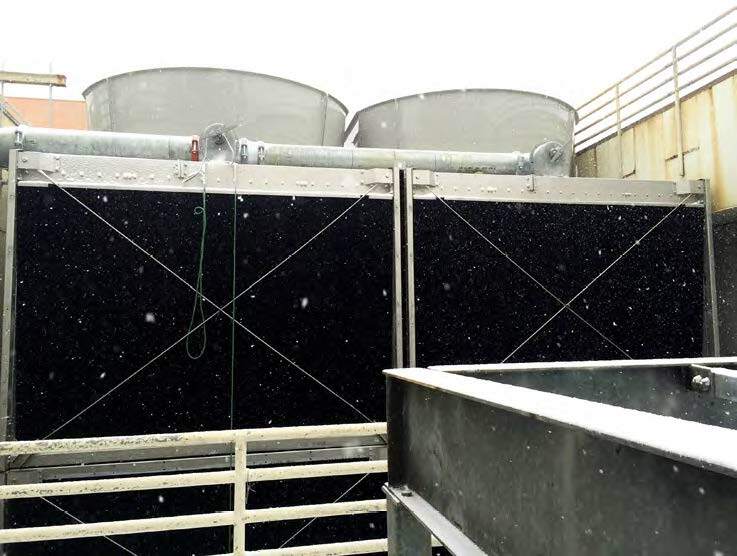 To overcome recurring cooling tower-related HVAC performance problems, Davis Memorial Hospital of Elkins, WV, recently purchased two high-density polyethylene (HDPE) cooling towers, manufactured by Delta Cooling Towers, to support its two 300-ton chillers. The new towers were selected to meet the hospital’s demanding specifications for high performance, minimal maintenance, and minimal noise. In recent years, HVAC trade magazines have cited that more than one third of the commercial HVAC systems in the United States are broken. They also point out the poor state of HVAC equipment across much of the K–12 market. Installing upgraded HVAC equipment and effective building control systems in new and existing buildings significantly improves occupant comfort and productivity, but it is the damper actuators that move the equipment and allow the user to deploy control strategies. 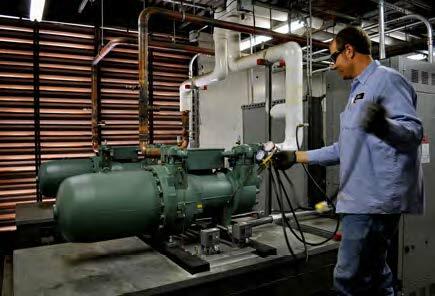 Because damper actuators enable HVAC systems to deliver measurable, sustainable energy savings, Siemens offers these tips on selecting the right product for your project. Industrial Cooling Corporation (ICC) of Metuchen, NJ, recently retrofitted a 10-ton reciprocating compressor with a BITZER scroll compressor (ESH736-4SU) to keep overall client costs down, reduce power consumption, and minimize noise. Replacing large, inefficient recips with high-efficiency screw compressors on chillers and rooftop units is standard practice in many areas, but it is unusual to convert smaller recips to scrolls. 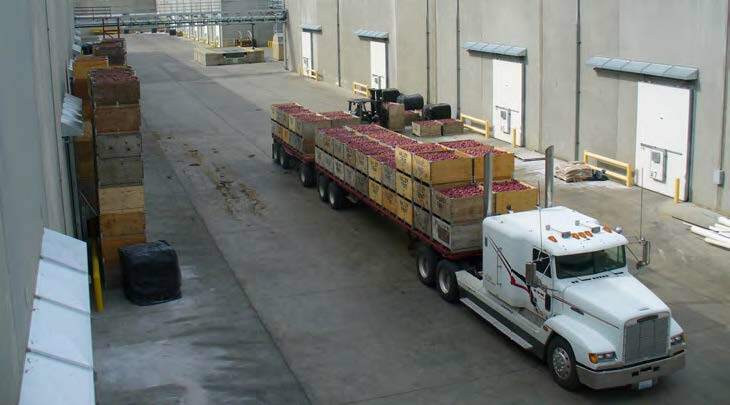 Washington State had a record apple harvest in 2012, so Double-Kold of Yakima, WA, stepped up to expand storage capacity rapidly for growers across the state by relying on Baltimore Aircoil Company’s (BAC) products. After apples are harvested in the fall, they need to be stored in cold rooms for several months to supply various markets for the entire year. To support a massive water tower for a NASA launch pad, Sauer Group Inc. employed Anvil pipe supports and rollers for their durability and history of quality manufactured products. 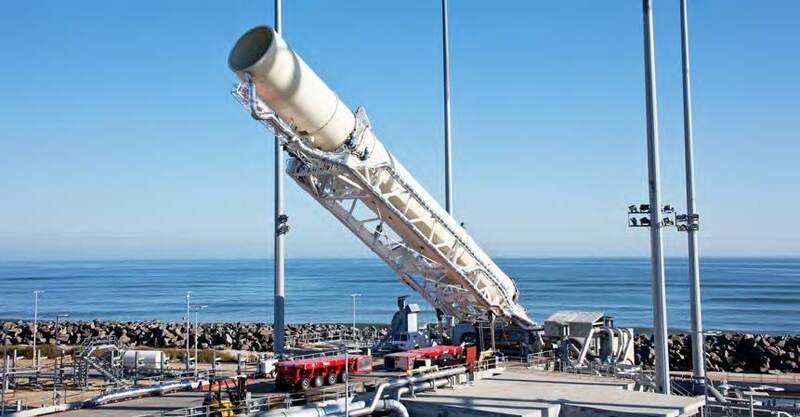 When rockets and spacecraft launch from NASA’s flight facility at the Mid-Atlantic Regional Spaceport (MARS) on Wallops Island, VA, the engine exhaust generates an enormous amount of heat and vibration. To keep the launch pad cool, stable, and safe, a special deluge system pumps water from a 307-foot water tower, the tallest in the world. 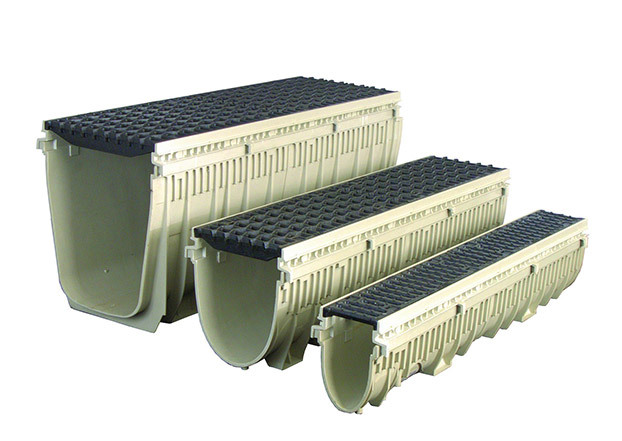 The Sauer Group’s support structure keeps the deluge system safe during tumultuous takeoffs. 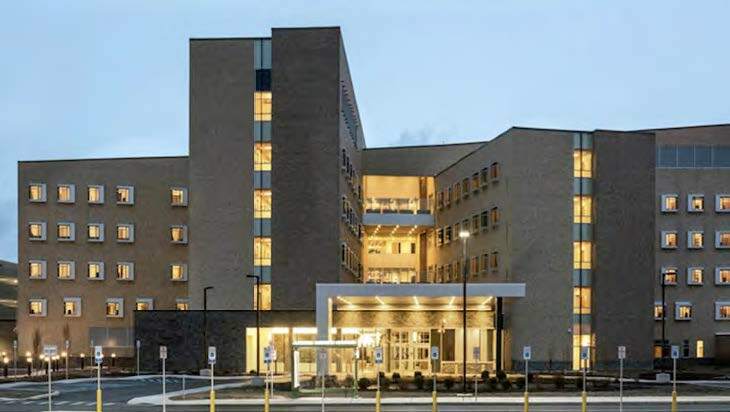 In urgent need of more space, Erie County Medical Center Corporation (ECMCC) shortened the construction timeline for its new long-term care facility from two years to 15 months. MLP Plumbing & Mechanical, Inc., of Cheektowaga, NY, met the challenge by relying on Zurn products. Zurn Industries, LLC, helped MLP eliminate contractor hours by providing customized, engineered solutions to fit jobsite dimensions and install easily. As a result, the ECMCC saved millions of dollars financing its $103-million project. The need for specialized equipment may arise so infrequently that a company cannot afford to purchase it. Moreover, storing, maintaining, and, in some cases, certifying equipment can create additional headaches. To meet their short-term needs, some contractors choose to rent equipment from sources such as Lifting Gear Hire Corporation (LGH). When the Miami International University of Arts and Design needed to upgrade its chiller, Pyke Mechanical was able to install a new, high-efficiency BITZER Screw compressor at only marginally higher cost than rebuilding the original compressor. The conversion went so well that Pyke plans to install BITZER screws whenever an upgrade opportunity presents itself. 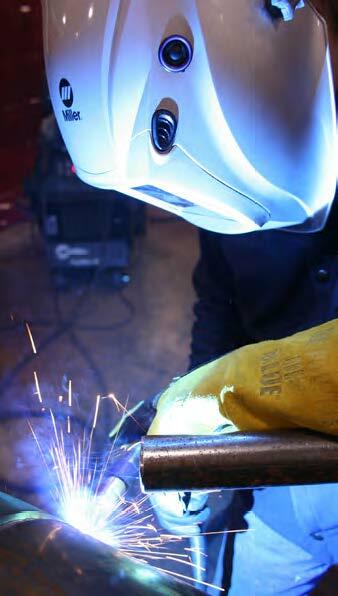 While most weld positioners will improve the productivity of a pipe welder, a positioner designed specifically for the pipe welding industry to reduce welder fatigue increases the quality of the welder’s work. To fix a decades-old leaky piping system in Seattle’s King County Jail, Auburn Mechanical used Aquatherm’s polypropylene-random (PP-R) pipe systems to combat the aggressive water degrading the existing pipes. 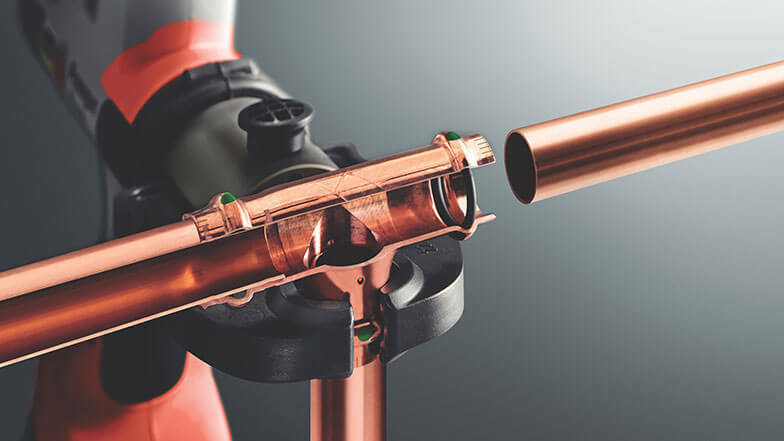 Aquatherm’s products not only provided an ideal solution but also cut installation time and cost when compared with copper piping. 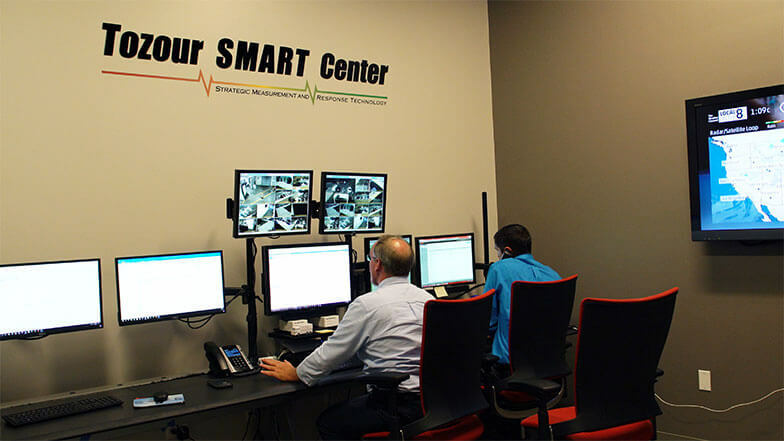 In 2012, ACCO Engineered Systems of Glendale, CA, trained more than 200 service technicians to use its new MobileTech system, tailored for ACCO by WennSoft, and immediately realized more benefits from the system than expected. 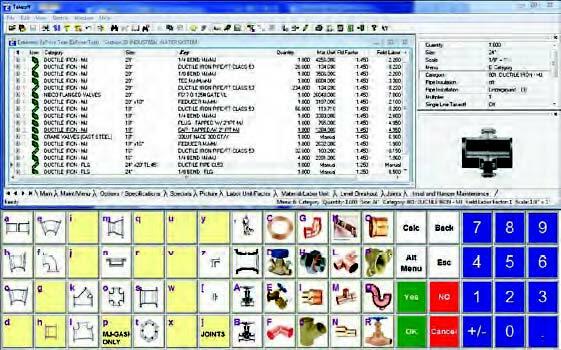 The new technology speeds up and even eliminates some paperwork and improves communication. 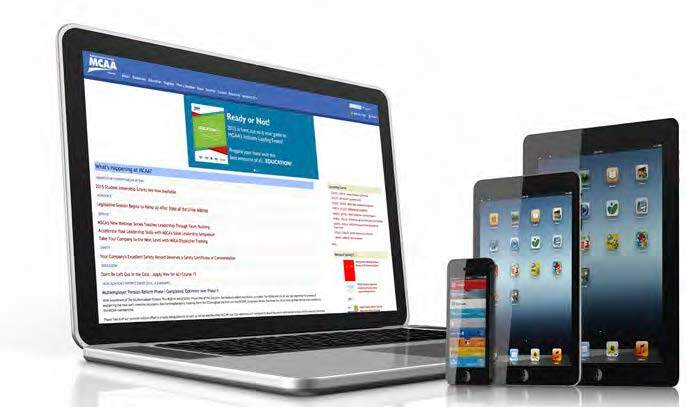 By using the streamlined, electronic quoting features, ACCO has already realized a return on its investment in MobileTech. 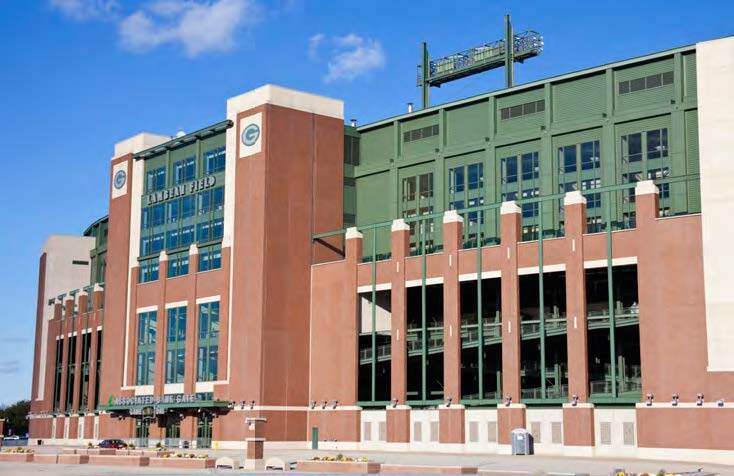 To win the contract to renovate the Green Bay Packers’ Lambeau Field, Tweet/Garot of Wisconsin put Bidtracer’s invitation management software to work to solicit bids and organize proposals from vendor and subcontractors. 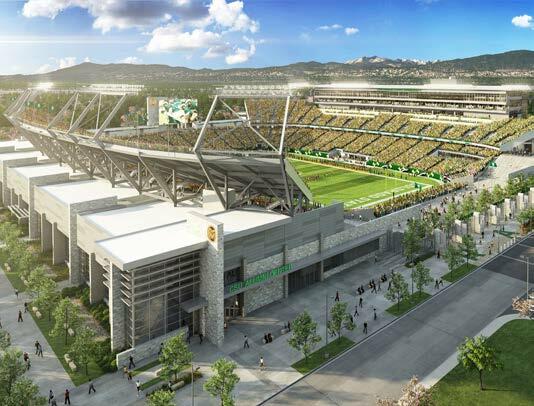 Once awarded all of the mechanical work (HVAC, plumbing, and radiant systems) for the Packers’ $165-million South End Zone Project, Tweet/Garot turned to Bidtracer again for construction project management software for the submittal, request for information (RFI), and change-order process. 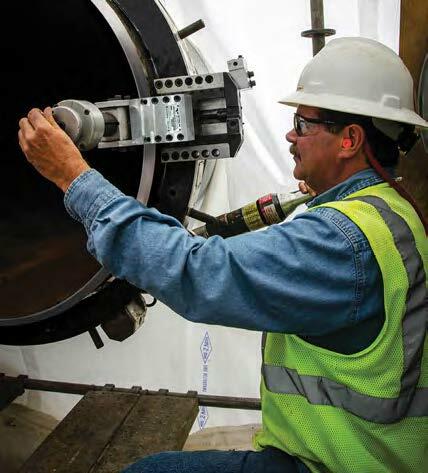 To address the challenge of vibration noise from pipes, GRINNELL Grooved Flexible Couplings reduce vibrations, minimizing the amount of noise distributed through a pipe system, while providing a tight seal to prevent leaks. 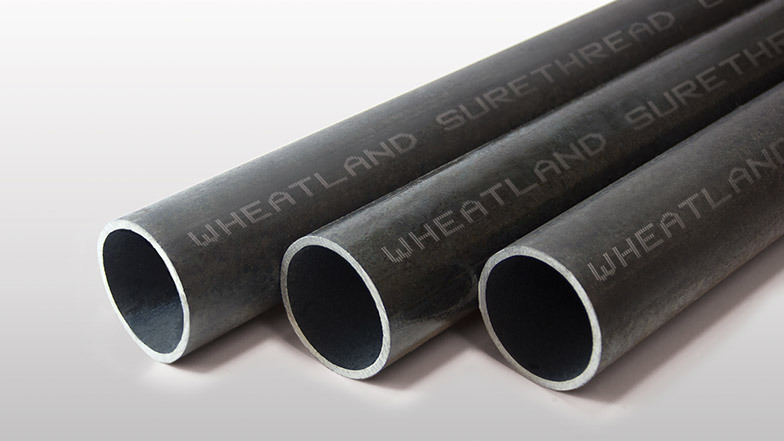 In contrast, some elastomeric and braided metal flexible connectors designed to minimize vibration noise require you to install additional parts to pipe sections, perform extra welding, or add large, heavy flanges on pipe connections to accommodate the system’s lack of flexibility. These methods complicate the piping system and increase the risk of leaks. All stadiums and arenas tend to get dirty, but an arena floor covered in dirt poses a unique problem. Keeping such an arena clean is the challenge that Scottsdale, AZ, faced when it decided to undertake a $42.8-million expansion of the Tony Nelssen Equestrian Center at WestWorld—a challenge solved by an Enviro-Flo drain from Jay R. Smith Mfg. Co. In addition, the Enviro-Flo was easier to install than standard floor drains, resulting in cost savings. Think You Don’t Need a DOT Number? Think Again! There has been much confusion about who is required to have a U.S. Department of Transportation (USDOT) number. Many contractors feel it’s only needed for truckers hauling for hire, which is not the case. 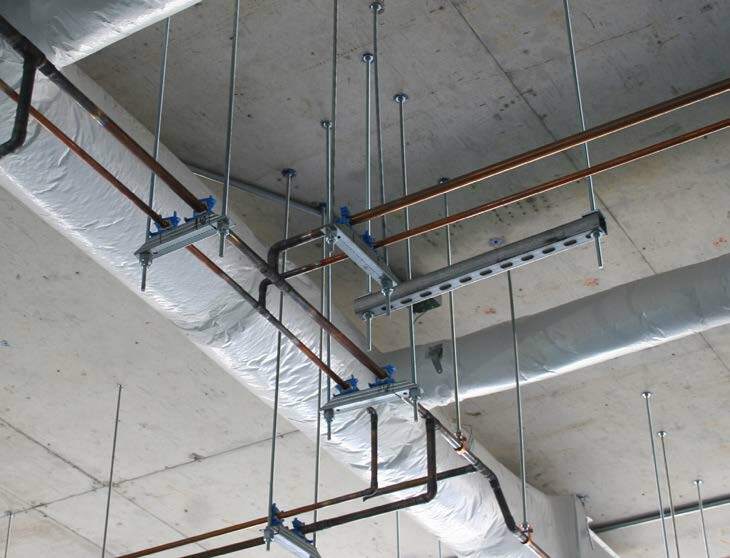 In early 2011, Smith & Oby Company began work on a new office building in Cleveland, OH, that included 250 active chilled beams, which required an extensive amount of small-diameter copper pipe and multiple trapeze racking systems. 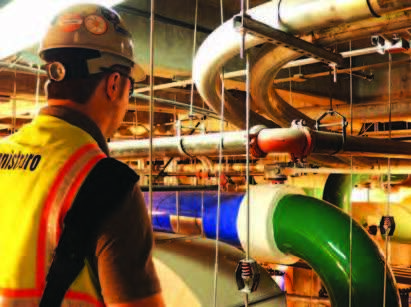 To manage installation of approximately 28,000 linear feet of pipe in a 95,000-square-foot building, Smith & Oby turned to ERICO for an innovative and time-saving installation solution. When CFI Mechanical in Houston, TX, took on an $8.5-million mechanical job with an aggressive schedule requiring massive coordination before the structure was built, they knew they could count on building information modeling (BIM) software tools from Technical Sales International (TSI) to get the job done. 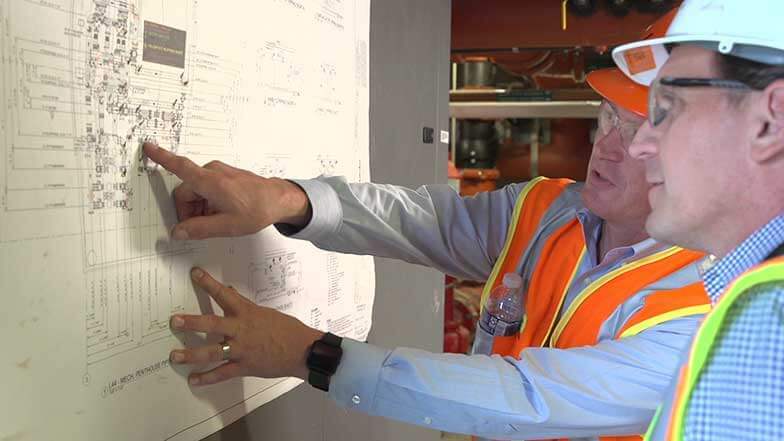 Led by President Chuck Fell (who is also MCAA’s senior vice president and treasurer), CFI Mechanical has been using BIM tools for over a decade to improve efficiency and mitigate risk in fabrication and construction. 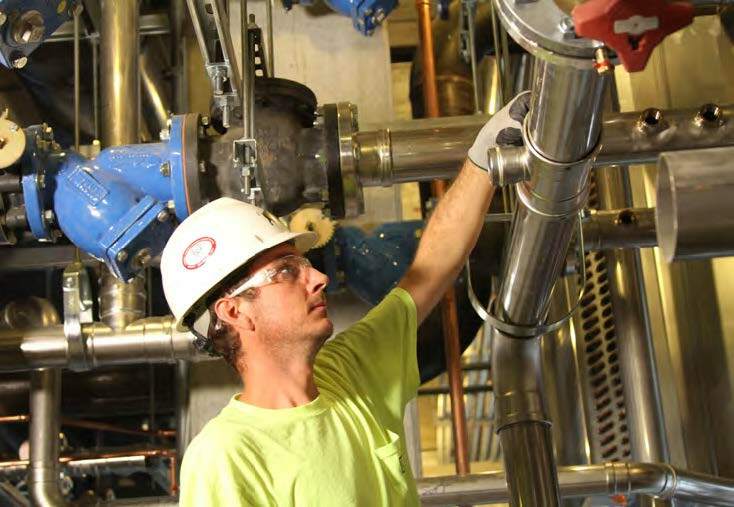 Faced with the challenge of replacing all of a biotechnology company’s existing piping with stainless steel in just 14 weeks, Hart Engineering found that Viega ProPress® systems provide clean, consistent connections quickly. 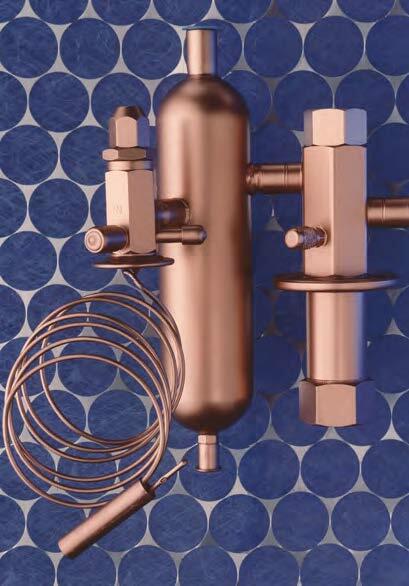 Viega ProPress for stainless steel offered a complete solution, including pipe, valves, and fittings in two high-quality grades of stainless steel, 304 and NSF-approved 316. 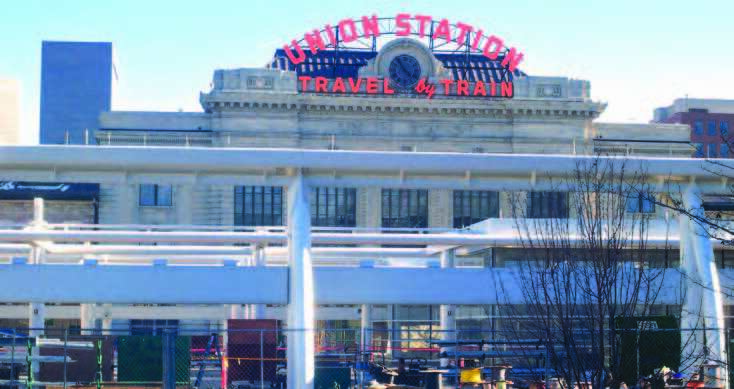 For U.S. Engineering Company, finding creative ways to keep the University of Colorado Hospital’s (UCH’s) new expansion on track helped them increase productivity while delivering on schedule and on budget. 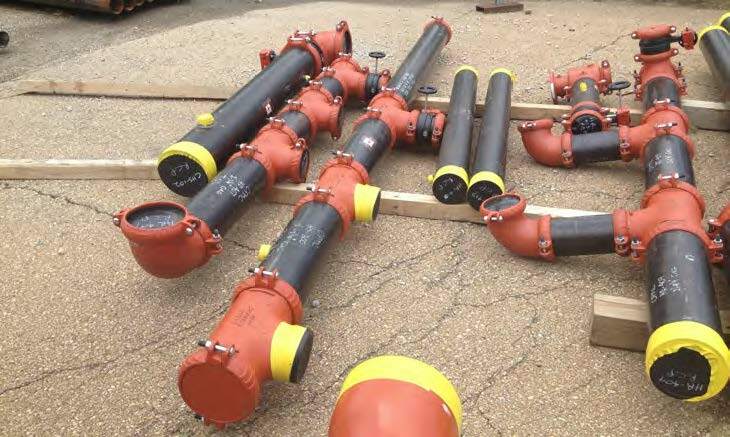 To maximize productivity, U.S. Engineering decided on a multi-trade prefabrication process using Victaulic grooved systems whenever and wherever possible. Commitment to energy-efficient products such as Daikin McQuay’s Magnitude® chillers and reliance on building information modeling (BIM) to manage a complex project helped ACCO Engineered Systems complete what has been called “the greenest urban office building in North America.” The San Francisco Public Utilities Commission (SFPUC) headquarters in downtown San Francisco at 525 Golden Gate opened in July 2012. It produces a 50-percent-smaller carbon footprint and uses 32 percent less energy and 60 percent less water than similar 13-story office buildings. For the Crystal Bridges Museum of American Art, MMC Contractors met the demands posed by a complex design and environmental challenges by using tools from Technical Sales International (TSI). 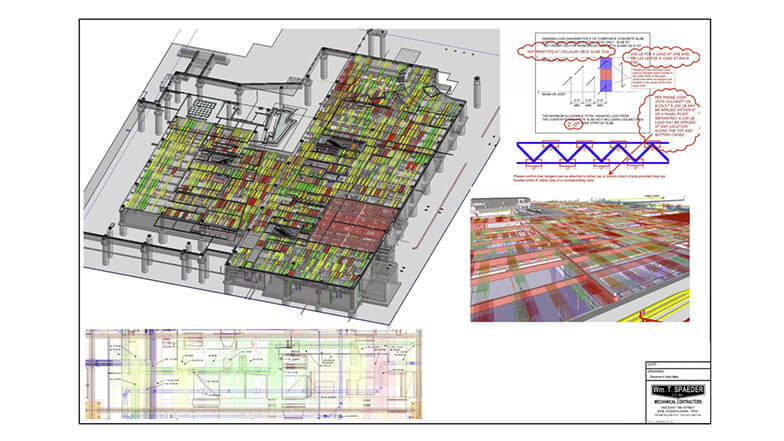 With Autodesk® Fabrication CADmep™ 2013 software, MMC Contractors was able to take the 2D drawings and detail the angles, hangers, couplings and air handling units in a fully-detailed building information modeling (BIM) 3D plan, then fabricate the entirety of the museum’s mechanical systems. 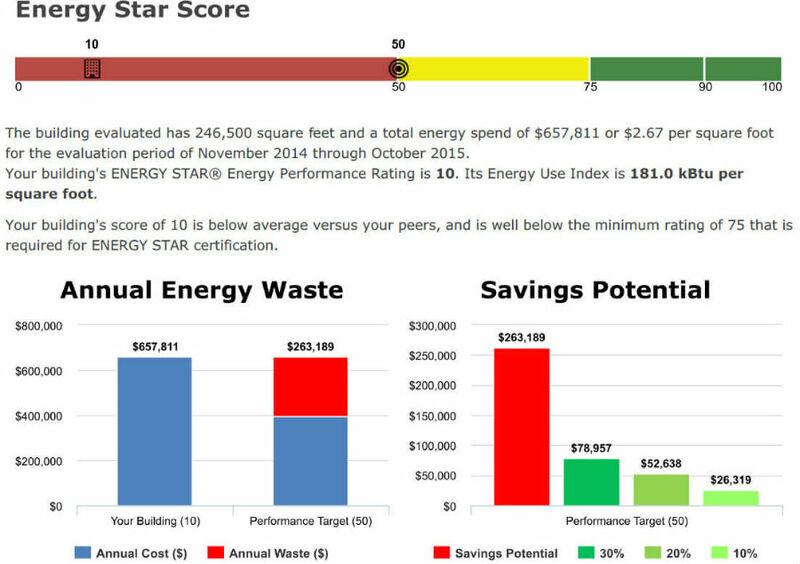 Limbach Company uses BuildingAdvice software and sensors to identify energy-saving fixes, helping a Columbus, OH, property management group ensure that its buildings meet ENERGY STAR requirements. That success was the “in” that Limbach needed to secure more opportunities for energy services that may lead to preventive maintenance and retrofit contracts. Legal actions sometimes cast a wide net, drawing an employer into a claim by alleging that the use of a vehicle in the case was for business purposes. Business use can be alleged as the result of something as simple as storing some small tools in the automobile, taking the mail to the post office, or being on a cell phone call with the office. 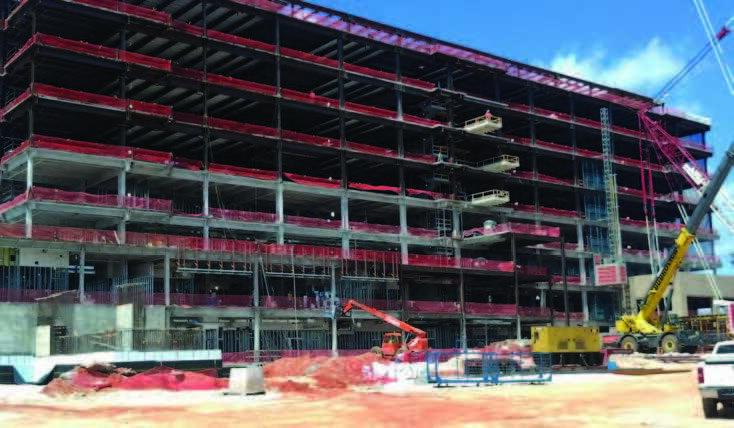 A major expansion of the 1960s-era Riverside Regional Medical Center in Newport News, VA, is on track and on budget, thanks in part to Warwick Plumbing and Heating, which relied on NIBCO products, prefabrication, and building information modeling (BIM) to keep the project running smoothly. Because lives are at stake, maintaining uninterrupted service during construction in the hospital is crucial. 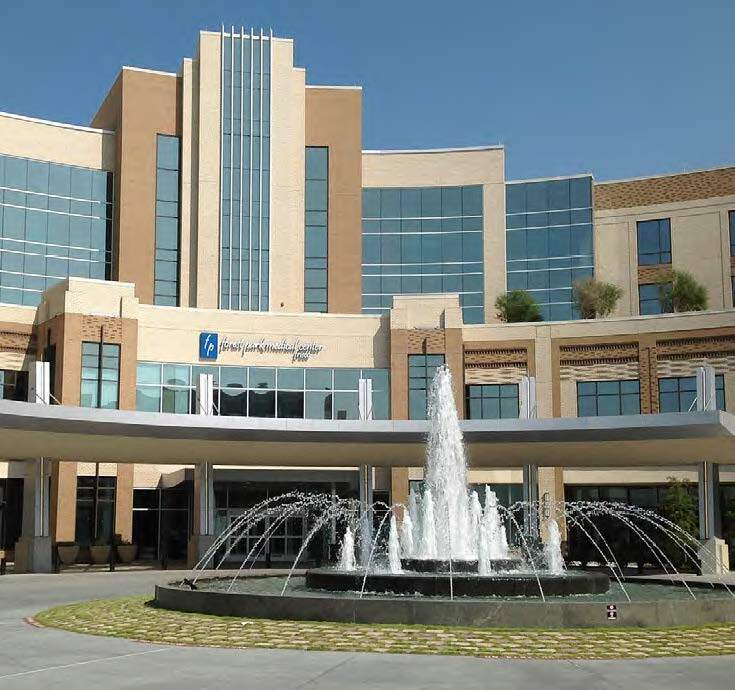 When Brandt needed a way to prevent sewer gas odors in the Forest Park Medical Center in Frisco, TX, they turned to the Quad Close Trap Seal Device manufactured by Jay R. Smith Mfg. Co.® The time saved installing the Quad Close when compared with trap primers “really makes a big difference,” said Keith Rosson, general superintendent at Brandt. BrandtJay R. Smith Mfg. Co.
Soefker Services, LLC, of Memphis, TN, has taken a proactive approach to managing the diminishing supply and rising costs of R-22 refrigerant by using Polar Technology’s TrakRef™ software to manage their reclaim process and get the recovered R-22 back for future use. For years, R-22 has been the refrigerant of choice for commercial and residential systems. With so much demand, production of new R-22 remained strong even as pending U.S. Environmental Protection Agency (EPA) regulations sought to reduce use of the refrigerant because of its high potential to contribute to global warming. 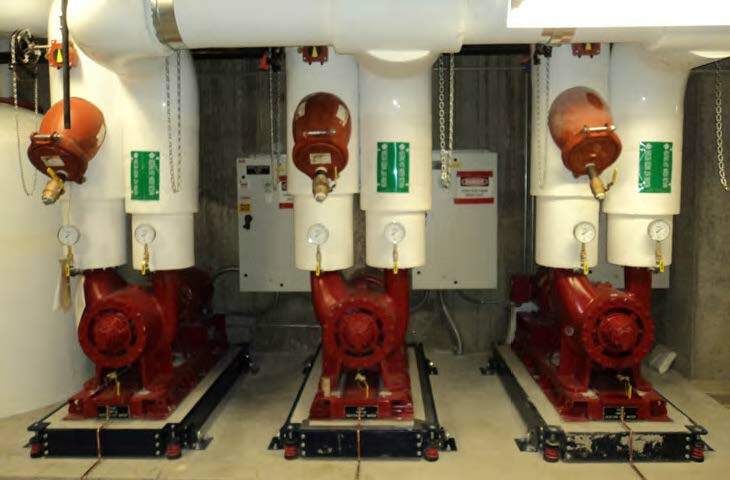 By opting for Carrier’s geothermal exchange system, Elliot-Lewis helped The Friends Center in central Philadelphia upgrade its heating and cooling plant and earn LEED® Platinum certification, despite the challenges posed by an urban location and national landmark status. 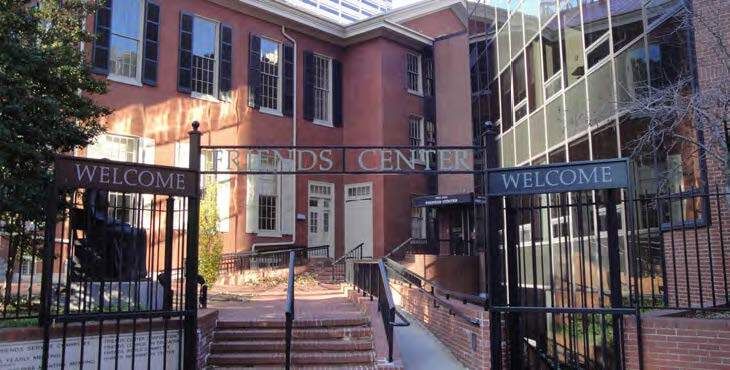 The Friends Center campus in central Philadelphia is owned and operated by The Religious Society of Friends, commonly known as the Quakers. With an impossible deadline to meet, Trautman & Shreve needed an ultra-efficient tool to meet the twin performance criteria of energy efficiency and cost control for the new Research Support Facility (RSF) at the National Renewable Energy Laboratory (NREL) in Golden, CO. 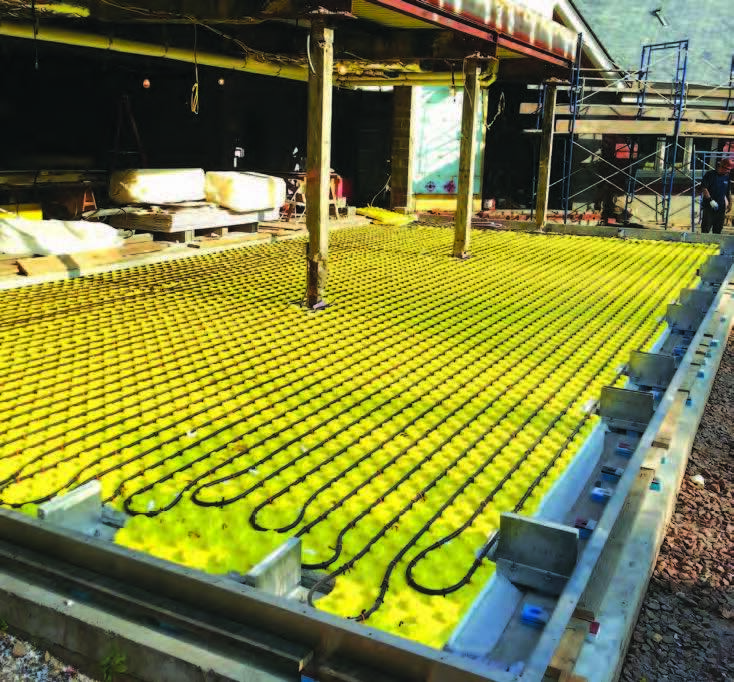 So they prefabricated 42 miles of Uponor’s cross-linked polyethylene (PEX-a) tubing into customized “radiant mats” and installed them in just two days, dramatically cutting both labor time and costs. 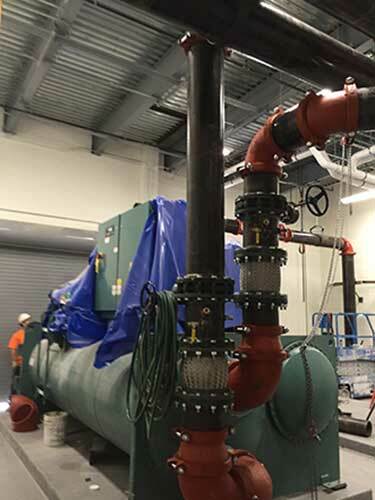 Efficient prefabrication strategies and Victaulic products made it possible for California-based Marelich Mechanical to overcome a tight timeline and space constraints for a 43,000-square-foot data center project by speeding up the installation process and keeping costs down. 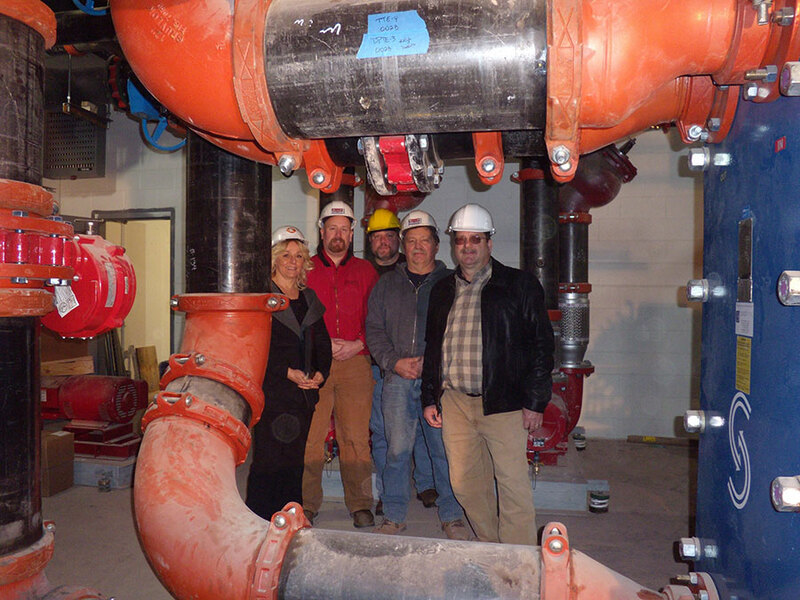 Marelich Mechanical constructed all of the project’s mechanical and plumbing systems in just three months. “Measure twice, cut once” is perhaps the oldest adage in the construction industry. Companies like Grinnell Mechanical Products offer a technical services team of experts who work with engineers and contractors to think through every detail, and the result is improved project management that reduces scrap, decreases labor, and saves money. Here are some tips to help you get the most out of mechanical services. For its new, expanded facility, the Almost Home Animal Shelter in Fort Dodge, IA, needed an air handling system that would heat and cool while saving energy, improve indoor air quality for employees and visitors as well as the animals, eliminate odors, and remove humidity. Not only did Greenheck products meet all of those needs, but the equipment paid for itself in less than two years, thanks to reduced energy costs. 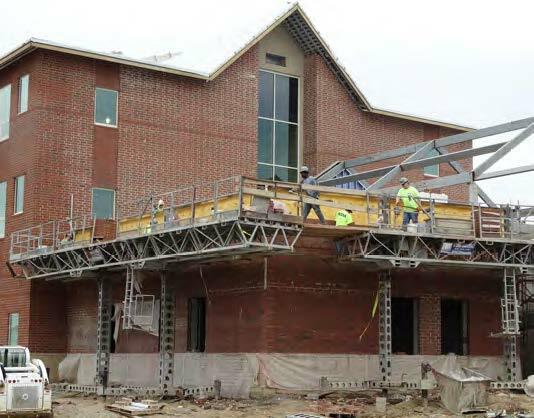 When faced with the challenges of installing a quiet, energy efficient HVAC system for Eastern Kentucky University’s (EKU’s) new, state-of-theart science building, H&R Mechanical Contractors selected Baltimore Aircoil Company (BAC) PT2 Cooling Towers. The PT2 towers not only solve the energy challenges but are equipped with several features that keep noise to a minimum. The new campus facility, located in Richmond, KY, houses classrooms and labs for the departments of Chemistry, Science, and Physics & Astronomy. 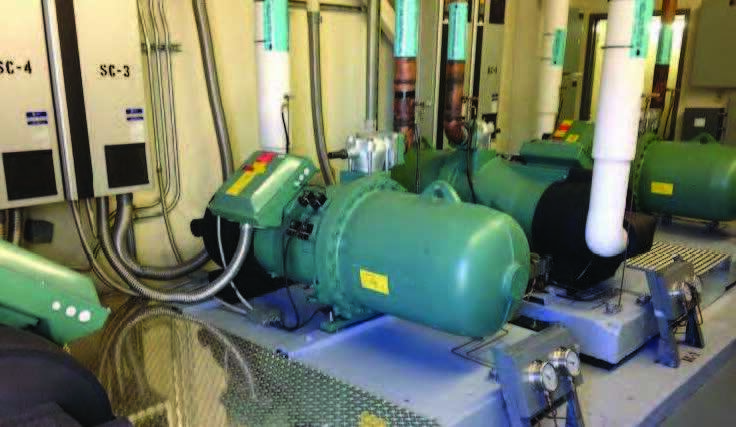 Confronted with correcting the performance problems of an R22 direct expansion system with two magnetic levitation, oil-less centrifugal compressors at a building in Newport Beach, CA, ACCO Engineered Systems staff ran energy comparisons between oil-less, centrifugal compressor models and screw compressors. To their surprise, BITZER CSW Screw Compressors provided full load and part load efficiencies comparable to the oil-less, centrifugal compressors. The question often arises within an organization, “For our next project, should we rent or should we buy equipment?” Renting equipment from companies like Lifting Gear Hire Corporation (LGH) comes with effective cost- and time-saving benefits. Keep these 12 reasons to rent in mind when organizing your next project. Where do you turn when an aging A/C unit needs service but the original manufacturer no longer supports the model? Entech provides handson training for technicians to enable them to dismantle and repair such equipment. Each week-long class is dedicated to products by a single manufacturer (Trane, Carrier, York, or McQuay). 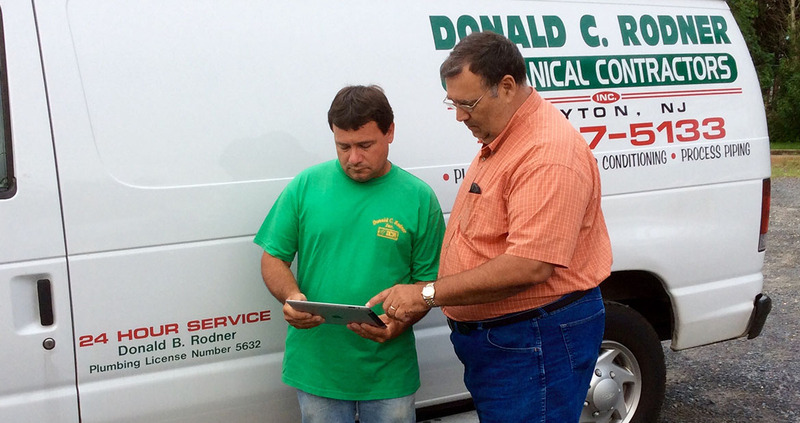 Field technicians with years of experience pass along knowledge and tricks of the trade that make service and troubleshooting easier. Global business insurer CNA, the Mechanical Contractors Association (MCA) of Georgia, and several other construction trade associations partnered with the nonprofit community revitalization group Rebuilding Together to celebrate the 123rd anniversary of Atlanta’s Carrie Steele-Pitts Home (CSPH), one of the nation’s oldest child-caring homes. On October 15, approximately 100 volunteers gathered for a day of major repairs to renovate and transform CSPH. While some contractors are focused on weathering the storm of the current economic environment, others—such as Egan Company in Brooklyn Park, MN—continue to grow their business aggressively. To improve customer service and become a more sales-oriented company, Egan turned to its longtime partner WennSoft® for an integrated customer relationship management (CRM) system. Now, Egan is improving relationships with current customers, better identifying new prospects, and honing its competitive edge. To increase productivity, keep costs low, and achieve optimal profitability, Dorvin D. Leis Co., Inc. (DDL) turned to Maxwell Systems™ Estimation® software to automate its estimating and procurement process. With Estimation, DDL is able to tie together estimates, labor needs, and cost analyses and so bid more quickly and accurately to win more jobs. And, once a job is won, DDL can leverage Estimation to take control of their entire procurement process—achieving greater efficiency and cost savings. Because not all contractors estimate projects in the same way, software developers such as McCormick Systems have created programs tailored for electrical, plumbing, and mechanical contractors. Often, product changes and enhancements are added to meet specific requests of contractors. Here are some of the features that contractors should look for when choosing estimating software. 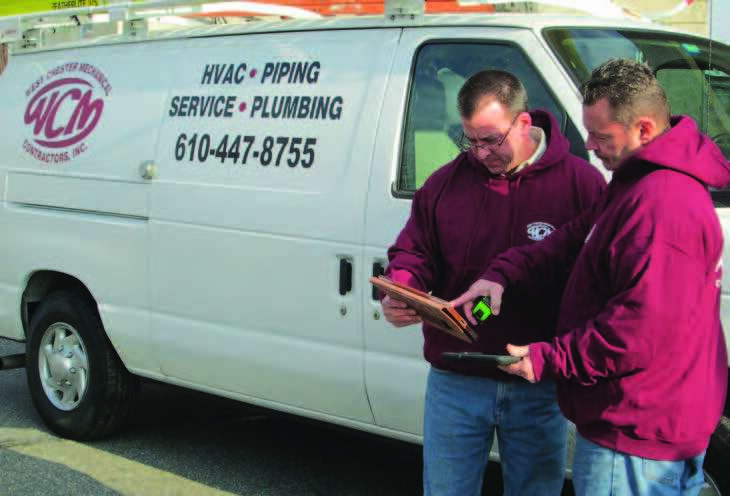 With AirAdvice training and BuildingAdvice™ technology, Airco Commercial Services, Inc. amped up its energy services program, adding five to seven percent to their annual revenue in 2010. 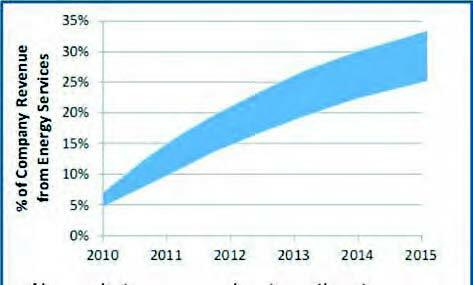 In 2011, revenue from energy services doubled to comprise 10–15 percent of total company revenue. 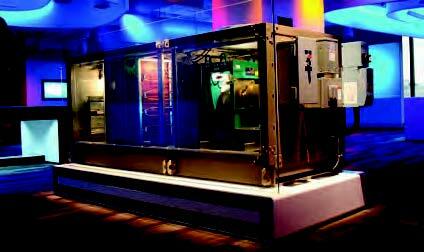 With lots of air-handling units to choose from, such as YORK® Solution units from Johnson Controls, HVAC contractors have the flexibility to find the best unit for some of the most demanding applications, including hospitals, theaters, schools and universities, government facilities, and office buildings. 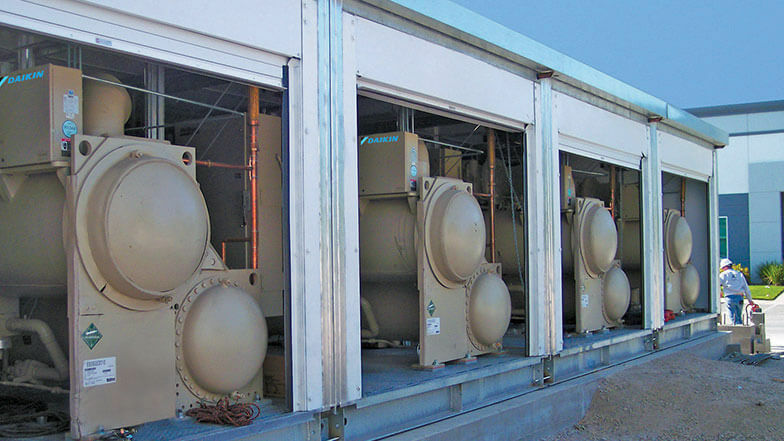 Contractors can customize the size and components of air-handling units to accommodate a building’s space constraints, performance needs, and budget. Choosing the right unit can make installation simpler and faster, saving you time and money. 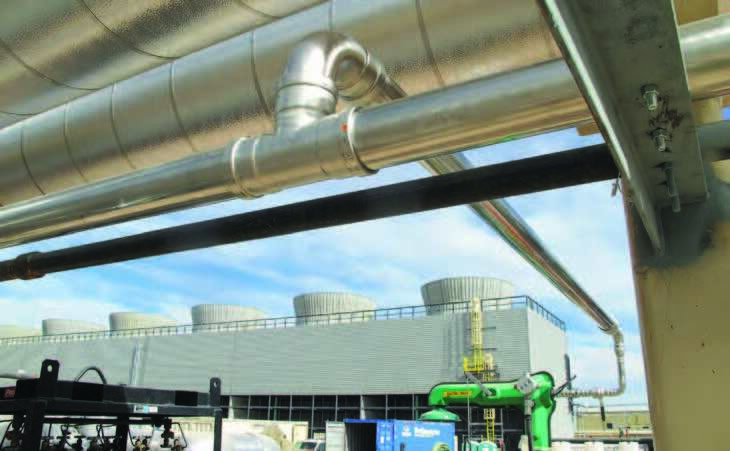 When selecting air-handling units for a project, consider these questions. 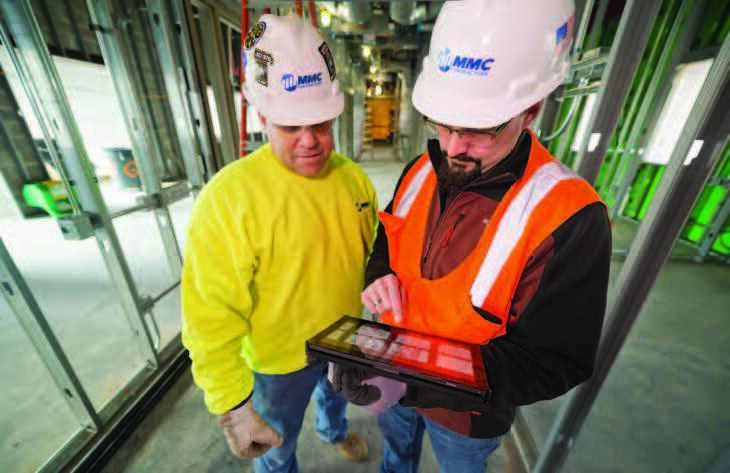 To maximize the benefits of using building information modeling (BIM), and to keep the Penn State Hershey Medical Center expansion project on schedule, Rado Enterprises of Bloomsburg, PA, turned to Victaulic. 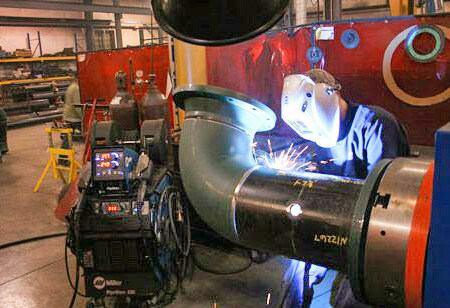 With proven experience installing grooved products in various HVAC systems since they began fabrication shop operations more than 15 years ago, Rado Enterprises knew that Victaulic grooved products provided a number of benefits over welding, such as ease of installation and maintenance, ability to meet demanding schedules, and decreased liability. What they learned with this project was the benefit of Victaulic’s project management services. When the J.W. 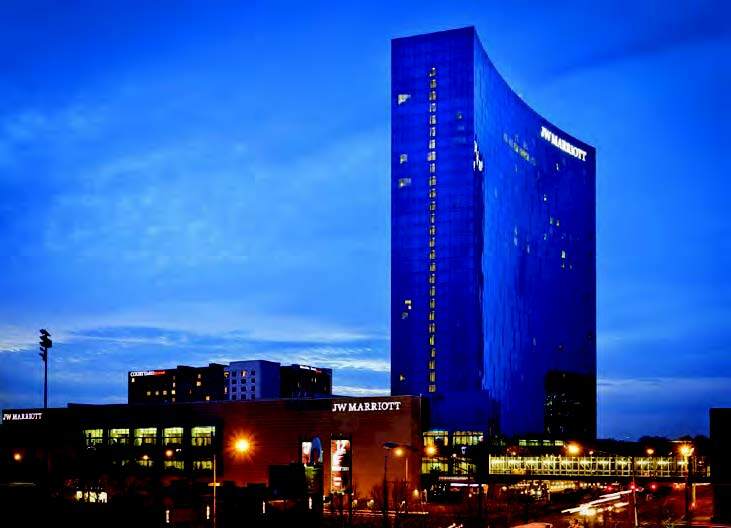 Marriott Indianapolis required some fundamental building systems to be completed ahead of the rest of the building schedule, North Mechanical Contracting, Inc. knew it could count on Viega ProPress® pipe fittings to get the job done. North Mechanical installed Viega ProPress for domestic water and hot water heating applications on all copper piping systems sizes 2” and below in the prestigious hotel. The 34-story J.W. 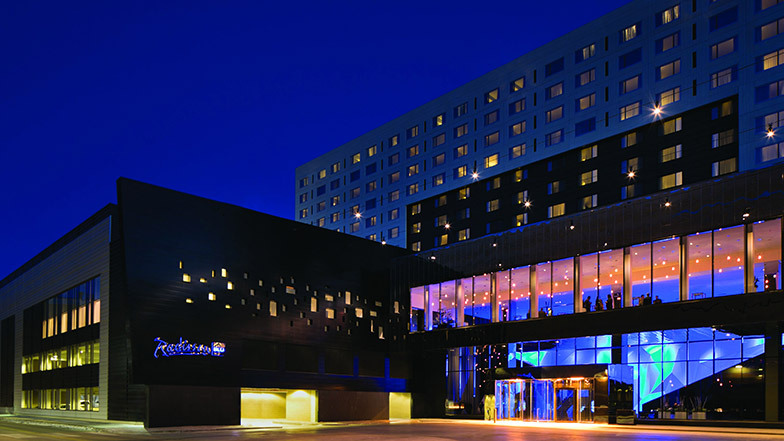 Marriott opened its doors in February 2011; it is both the largest and tallest hotel in Indianapolis, with more than 1,000 rooms. MCAA members A.O. Reed & Co., Pan-Pacific Plumbing & Mechanical, and Murray Company united with Monaco Mechanical (a member of the National Certified Pipe Welding Bureau, an MCAA subsidiary) to form a joint venture (Monaco/RPM) to design and install the total mechanical package of the Camp Pendleton Replacement Hospital, taking advantage of Technical Sales International (TSI) software and technology to enhance the collaboration. 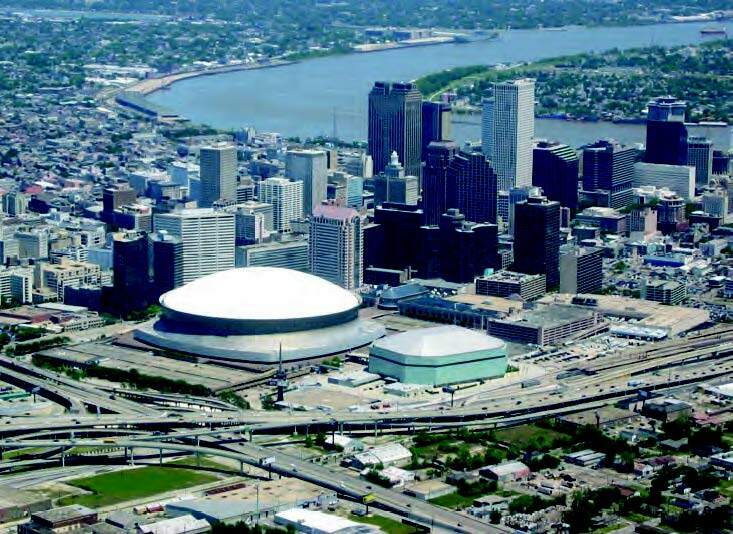 To take on the major renovations needed to restore New Orleans’ famed Superdome to its former glory, Gallo Mechanical chose Sloan Valve Company plumbing systems. 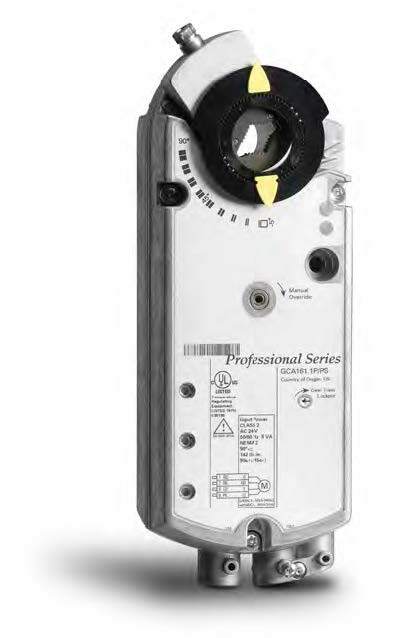 Not only does Sloan provide the high-efficiency fixtures and technology the job required, but it offers a manual override system in case of power outages that addressed project planners’ concerns. The speed and ease of installation with Viega ProPress® fittings, as well as overall lower costs, were significant factors for MMC Contractors as they installed more than 15,000’ of stainless steel piping in a new solar power plant in the southwestern United States. 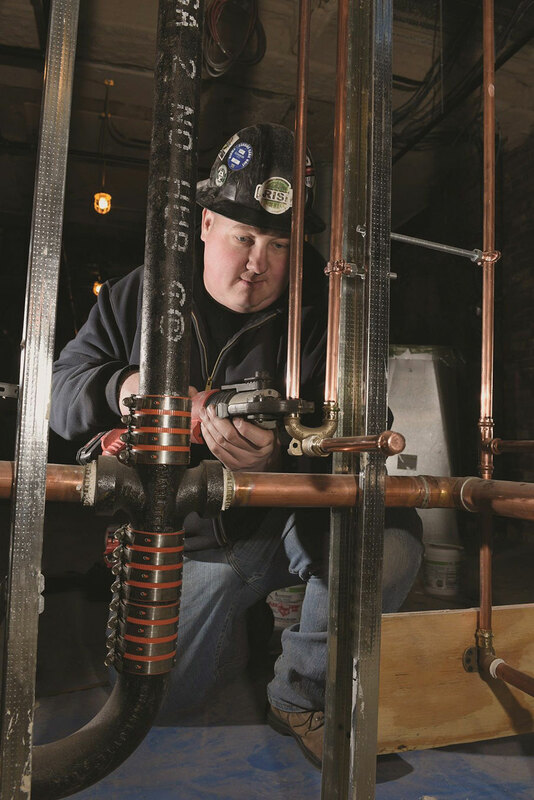 Jim Ed Thompson, project superintendent at MMC Contractors, said that by using Viega ProPress to join stainless pipe, MMC’s installers saved a significant amount of time per fitting. 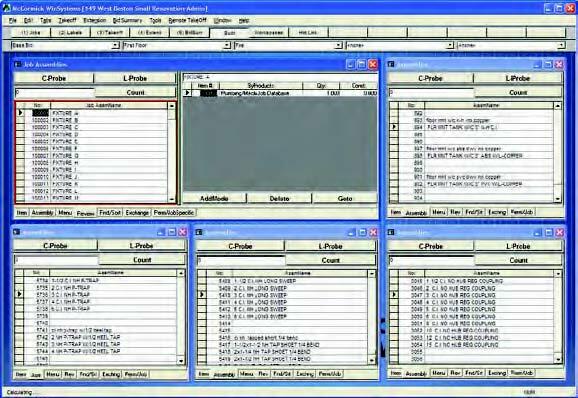 Even though Murphy Company has over a century of experience in delivering mechanical solutions and a long record of excellent performance (it is consistently recognized by Engineering News Record as a top-20 contractor), it was saddled with a 25-year-old software system. 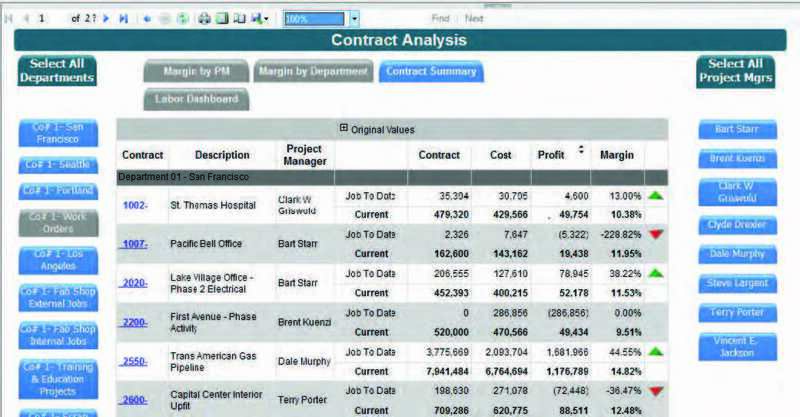 Since adopting the PENTA construction Enterprise Resource Planning (ERP) platform, Murphy Company took five days off its service billing process and cut more than $100,000 per year in costs related to lost/missing tools, among other benefits. C.J. Erickson Plumbing Co. took on the complex task of installing plumbing systems not only to meet the individual needs of an exacting group of tenants already scheduled to move in, but also to anticipate the needs of unknown future tenants. The new William Eckhardt Research Center at the University of Chicago will offer world-class scientific research facilities, and thanks to C.J. Erickson and Jay R. Smith Mfg. Co., those facilities are prepared for just about anything. C.J. Erickson PlumbingJay R. Smith Mfg. 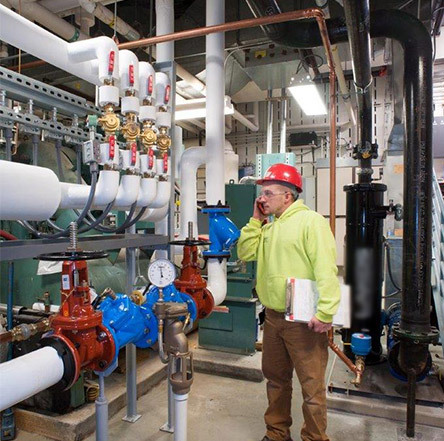 Co.
To upgrade the water systems at the University of Massachusetts Boston’s central utility plant—in a single weekend and without disrupting any other system functions—J.C. Cannistraro put to work the Autodesk® Fabrication CADmep™ system it has used since 2003. Thanks to building information modeling (BIM) and prefabrication technologies, Cannistraro installed in one day the temporary systems it needed to ensure a smooth transition for the rest of the project. Trimble Technology Proves Vital to Success of Prout Boiler, Heating & Welding, Inc.
Prout Boiler, Heating & Welding, Inc. relied heavily on Trimble’s AutoBid Mechanical and PipeDesigner 3D® to plan out a multitrade prefabrication approach during the bidding process for a hospital expansion project and take charge of multitrade coordination throughout the expedited construction schedule. 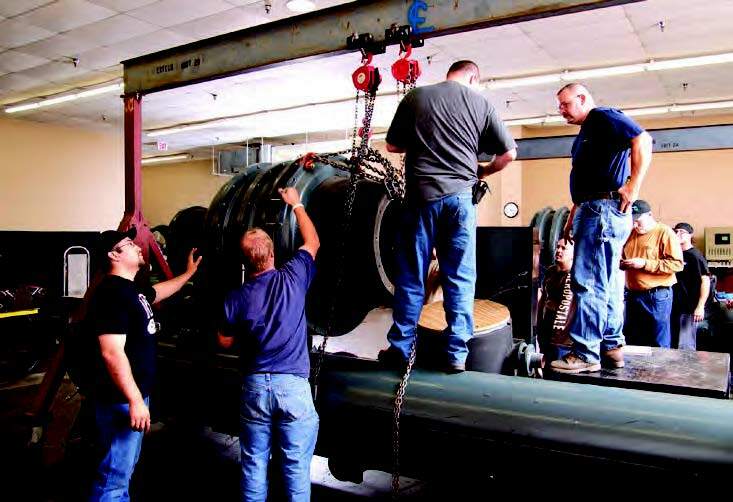 For a new production facility in St. Louis, MO, Mechanical Solutions found they could install Parker Hannifin’s Transair piping for the compressed air system with about half the number of workers needed for a black iron system. Mechanical Solutions also found that with Transair piping, they could preassemble parts in the shop, saving even more time on site. Because of the “design-on-the-fly” approach to building a solar panel manufacturing plant, Mollenberg-Betz, Inc., does not always know which products it will need and when, but it does know that F.W. Webb Company will provide just what they need when they do. The two have teamed up to provide engineered process piping solutions throughout the 1.2-million-square-foot SolarCity facility under construction in Buffalo, NY. 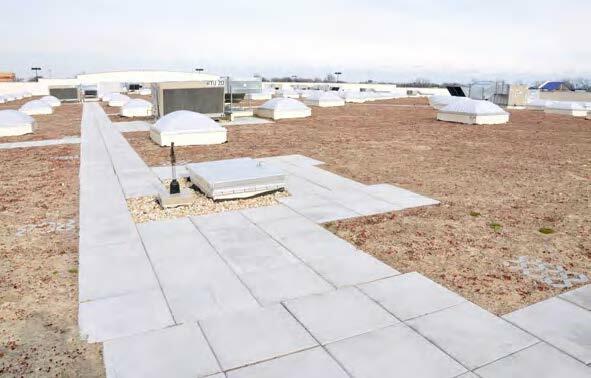 To keep on track with its project timeline, John W. Danforth Co. turned to Erickson Incorporated, a global provider of innovative aerial services, to place 44 sections of rooftop HVAC units securely in place in just one day. Erickson flew a Sikorsky S64 Aircrane helicopter above SolarCity’s 1.2-million-square-foot factory in Buffalo, NY. 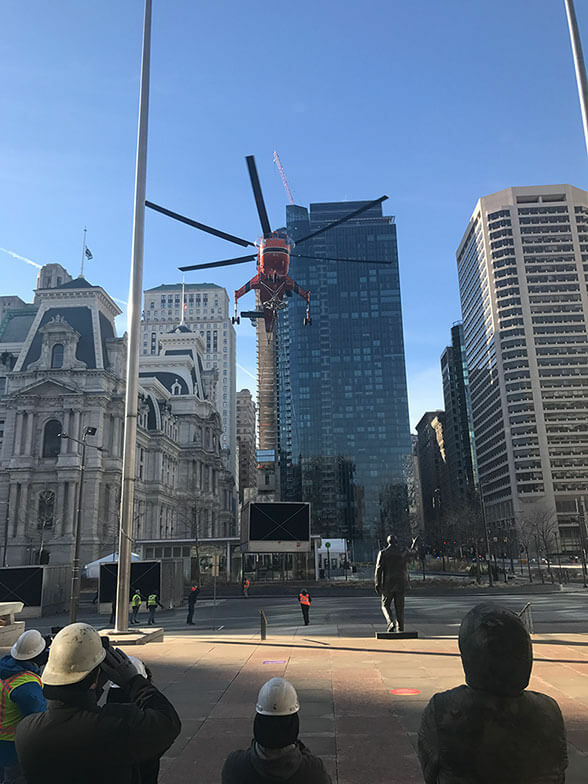 The Aircrane has a 25,000-pound lift capacity and easily carried the HVAC units—weighing between 14,000 and 18,000 pounds—in less than seven hours. 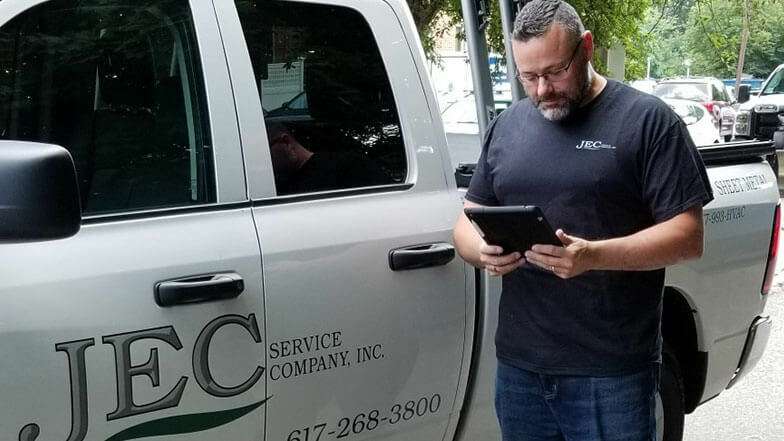 Herman Goldner Company, Inc., took its first steps toward a paperless workplace in 1998 with KEY2ACT and cites their continued partnership as the basis for improved cash flow and increased efficiency. 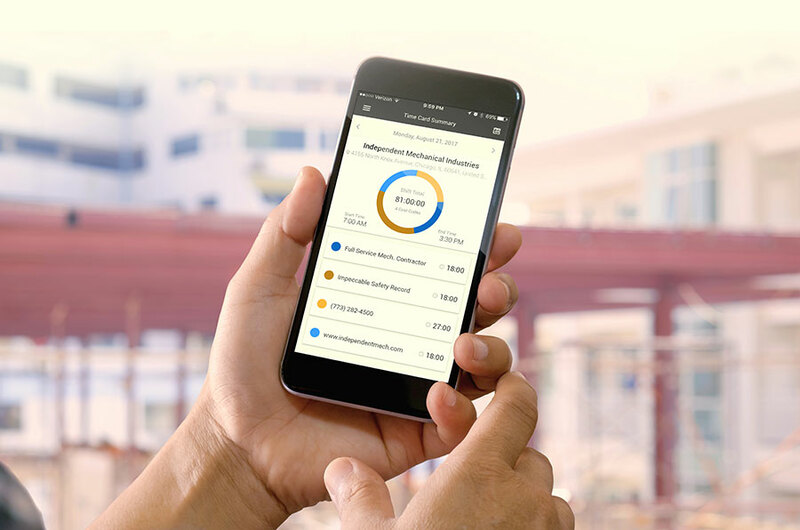 Goldner points to the KEY2ACT Signature solution suite as part of the reason they have become a company with annual revenue figures of over $80 million and a staff of 250 employees. Humphrey CompanyJay R. Smith Mfg. Co. 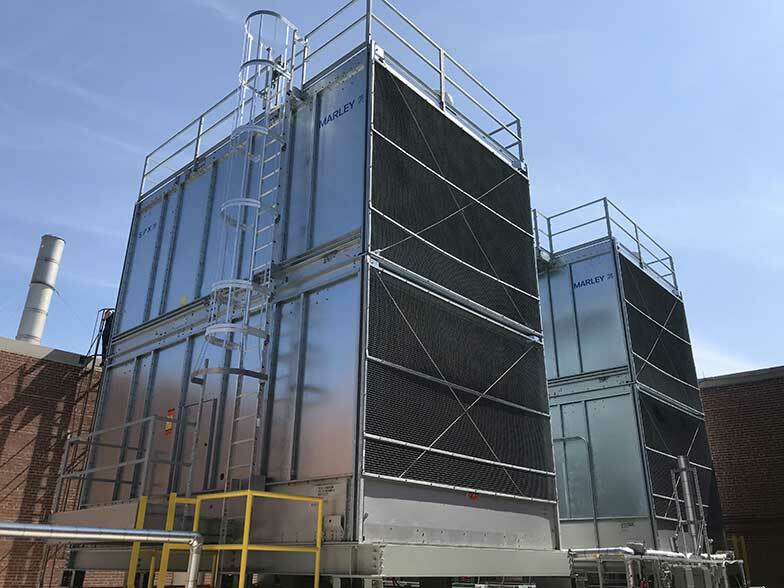 In selecting new cooling equipment for a university laboratory, Ideal Consolidated Inc., chose Baltimore Aircoil Company (BAC) cooling towers because they would stand up to harsh winters, but also for their ease of installation. Tim Stuver, project manager at Ideal Consolidated, said the small footprint of the BAC towers made installation and rigging more efficient and cost-effective than other options. What is the first thing that comes to mind when the word “safety” is mentioned in a meeting or on a jobsite? Perhaps you imagine superintendents reminding employees to wear their personal protective equipment (PPE). You may picture a checklist of all the necessary precautions to be completed prior to starting a job. It is often perceived that safety slows an operation down, when, says CNA, safety should be associated with profitability. 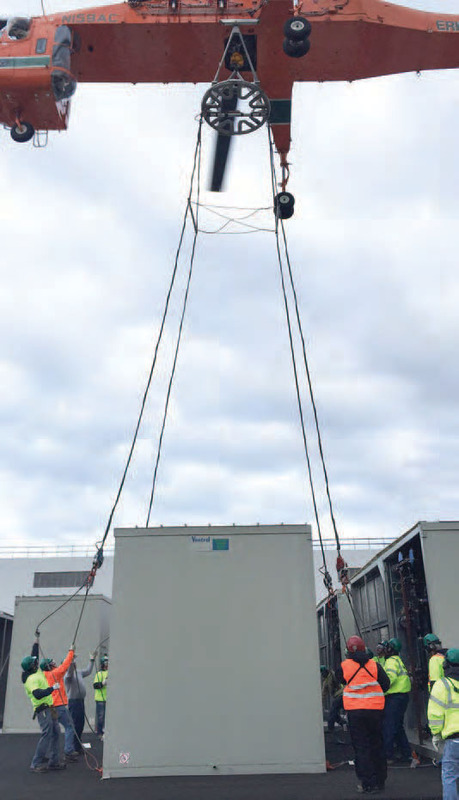 Facing space constraints, design restrictions, and a one-week schedule to replace three failing cooling towers, EMCOR Services Northeast, Inc. managed the tough project by installing two Marley NC® Cooling Towers from SPX Cooling Technologies without a hitch. The two towers were specially configured and manufactured to fit the tight space and meet the client’s requirements. With Anvil International’s Gruvlok® products and support, General Temperature Control (GTC) shaved months off its timeline for a school building project that had been behind schedule. Thanks to the swift installation time, the school opened on time. From GTC’s point of view, Anvil’s Gruvlok products and the company’s continuing support through field visits and behind-the-scenes logistics planning were critical to the project’s success. 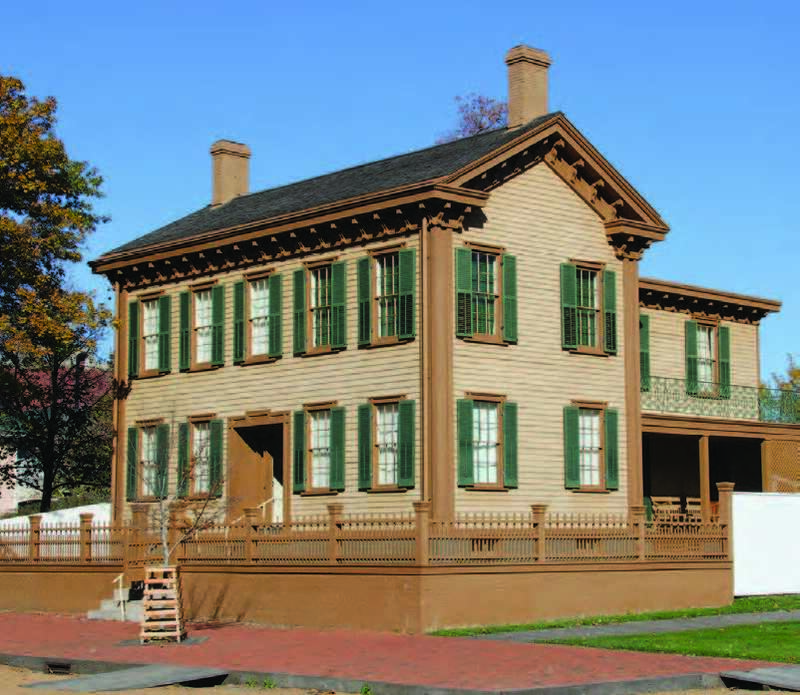 Called on by the National Park Service to modernize the HVAC system of the home of Abraham Lincoln in Springfield, IL, Henson Robinson relied on its expertise with historical sites and on Carrier HVAC products to upgrade the system without disrupting visitors or disturbing the site. Despite the challenges, the project went smoothly. New England Sheet Metal Works, Inc. (NESM) chose a Daikin Magnitude® chiller to upgrade the historic T.W. 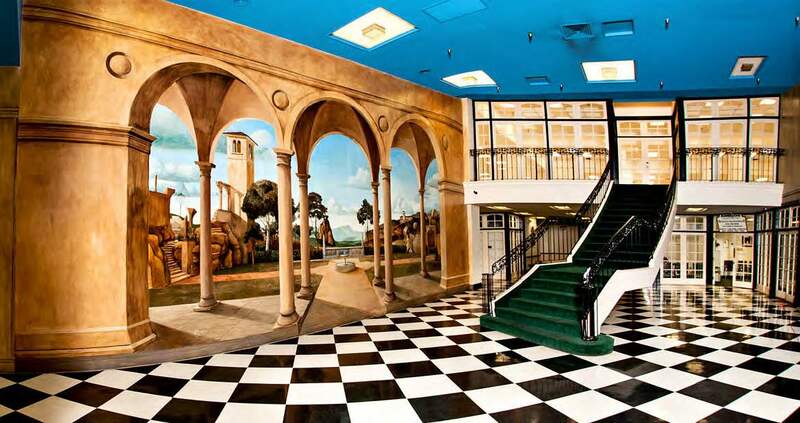 Patterson building in downtown Fresno, CA, because its compact design fit the tight spaces of the 93-year-old building. NESM provided temporary cooling, engineering design of the new water-cooled applied system, and services that included the installation of the Magnitude chiller, related piping, and a cooling tower. 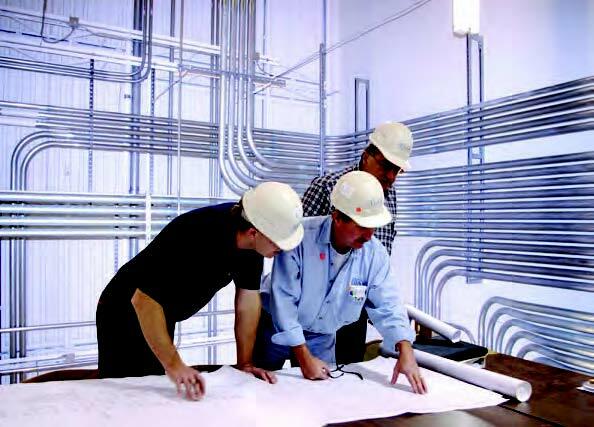 Victaulic’s Construction Piping Services (CPS) division helped P1 Group, Inc. win the bid for a major hospital expansion project by creating a 3D model of the mechanical systems, electrical systems, and ductwork. 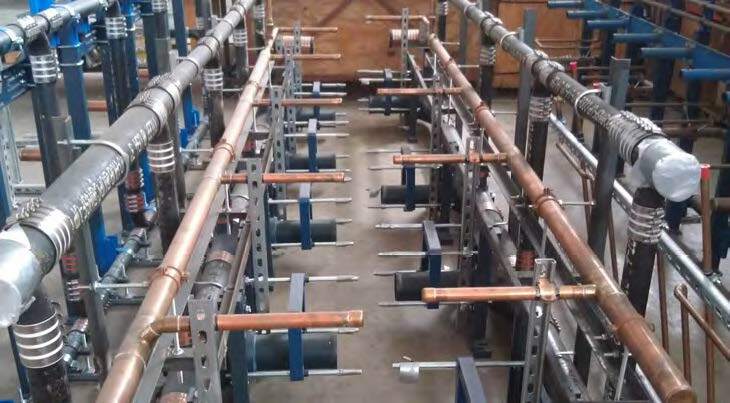 In the bid, P1 Group also made the case for Victaulic grooved mechanical piping systems for the project to save time and costs on installation. Without careful planning and support from Lifting Gear Hire (LGH), Hayes Mechanical might not have been able to install the new ductwork required by the Environmental Protection Agency (EPA) for a Midwest power generation company, which would have caused the power plant to close. Thanks to high-quality LGH equipment, backed up by a strong commitment to customer service, Hayes Mechanical finished the project on time, and the unit was released back to the customer ahead of schedule. 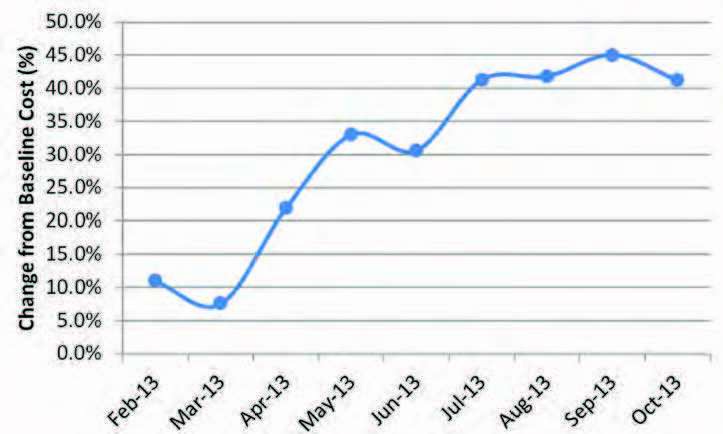 Since implementing Jonas Construction Software, Chiller Systems Service, Inc. has reduced their billing cycle from three weeks to just one week, which gets them a faster turnaround on their invoices, improving cash flow. 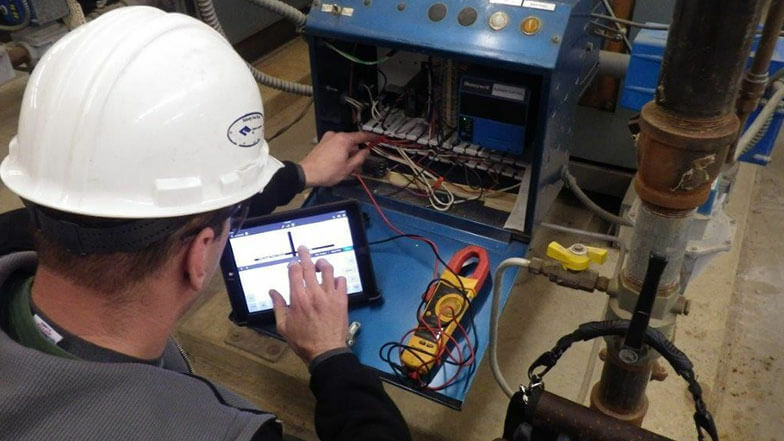 Using Jonas’ eMobile module, Chiller reduced their IT expenses by 50 percent, replacing laptops with more cost-effective tablets in the field. 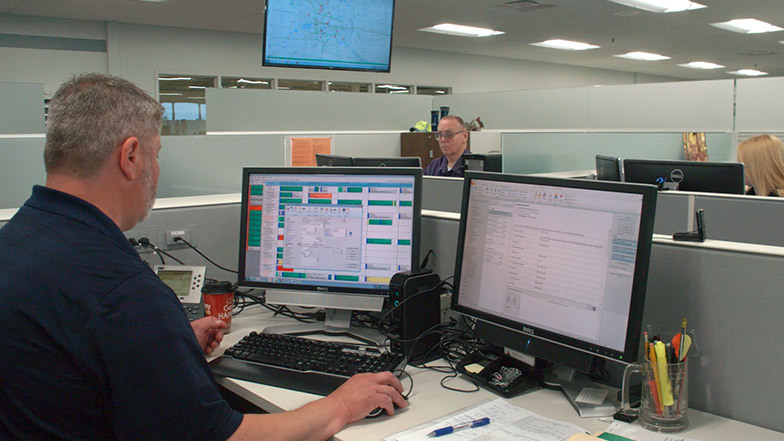 Jonas has also helped Chiller streamline their service operation and improve customer service. 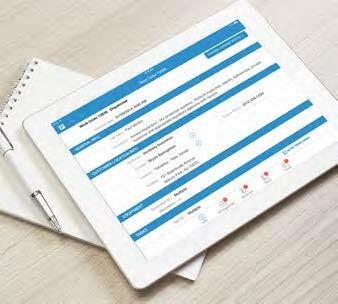 By transitioning from paper forms to iPad-based MobiliForms from iBusiness Technologies, “the time we save on paperwork is tremendous, and that translates directly to significant overhead savings,” said Marty Quarella, vice president of Louis N. Picciano & Son, Inc. The company also improved the quality of information recorded and saw a quick ROI. 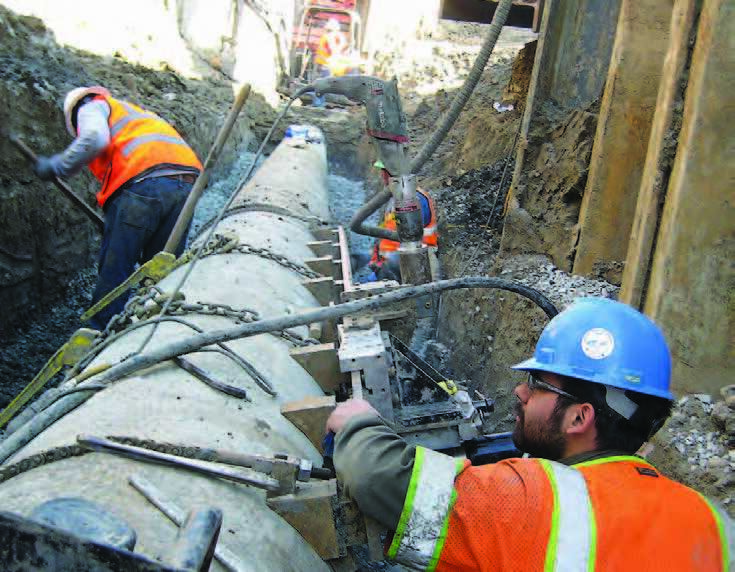 When a California transit project called for excavating and relocating buried telecommunication cables in Silicon Valley—while the cables remained live—Tri Tool Inc. created novel machinery to do the job. To complicate matters, a “hot work” permit would have delayed work, so the whole process had to be accomplished using cold-cutting techniques. Not only did the Tri Tool solution succeed in the delicate operation, it did so quickly, helping to bring the project in 10 months before schedule. 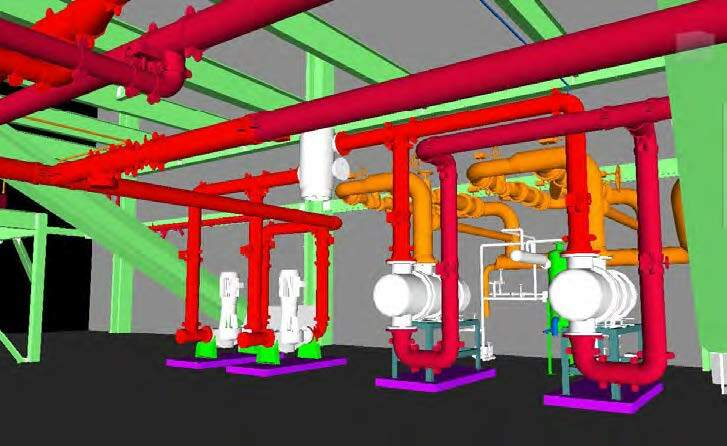 Building information modeling (BIM) and 3D modeling offered by Victaulic’s Construction Piping Services (CPS) division helped CFI Mechanical manage the lack of detailers available in Houston, where construction is booming. 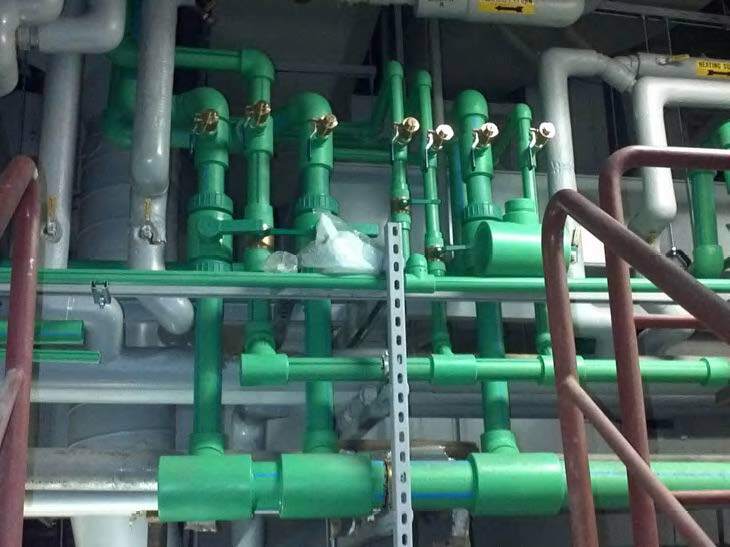 Victaulic’s grooved piping systems and prefabrication services also saved CFI Mechanical installation time and money on a new office building project. Pharmaceutical specialty and medical device manufacturer Angiotech had tried almost everything to keep humidity levels in its cleanrooms just right, but only the APR Control from Rawal Devices, Inc. was up to the task. Since The Warko Group installed the device, Angiotech has maintained humidity and temperature in its cleanrooms well within required specifications. 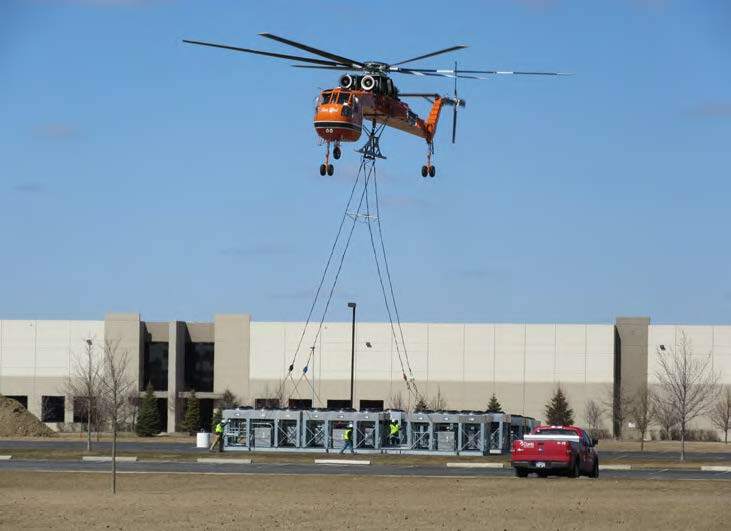 Innovative aerial service provider Erickson Incorporated successfully conducted 13 chiller equipment lifts to the top of the JPM Chase building in Belleville, MI, in just two-and-a-half hours, allowing Conti Corporation to cut installation time dramatically. 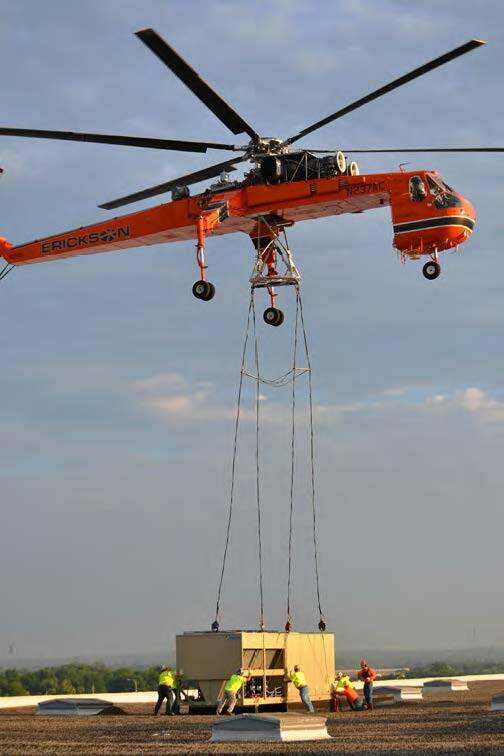 Erickson’s placement lifts saved time on the ground and also saved labor costs, because they were much more efficient than standard ground-based methods. When a major animation studio needed to replace a compressor and upgrade its systems, ACCO Engineered Systems took an unusual approach, replacing a tandem scroll set with a BITZER single semi-hermetic reciprocating 15-ton Varispeed™ model compressor with an integrated VSD. The new unit was easy to install and satisfied the customer’s demands. To overcome multiple and unusual challenges—including concerns about terrorism—Pan-Pacific Mechanical, in partnership with Murray Co., and A.O. Reed, collectively known as RPM, called on Jay R. Smith Mfg. Co. to accommodate unique specifications and complex coordination for the U.S. Navy’s Camp Pendleton Hospital Replacement Project, which had a budget of over $450 million. The 70-acre site includes a 500,000-square-foot, multilevel medical hospital; a central utility plant; a 1,500-space multilevel parking structure; surface parking; and supporting facilities. A.O. ReedMurray CompanyPan-Pacific MechanicalJay R. Smith Mfg. Co.
Autodesk’s mobile software prototype communicates with dust and noise pollution sensors attached to a hardhat and tracks when levels become dangerous, offering the potential to dramatically decrease the number of injuries. 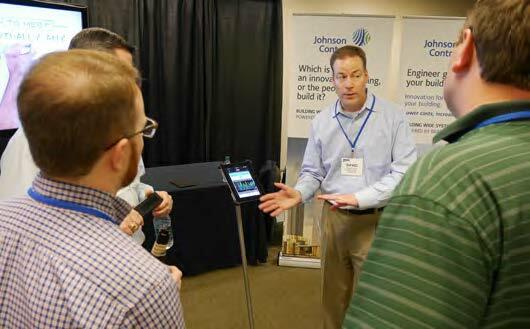 Attendees of the MCAA Technology Conference: The Best of Now, The Best of Next, held just outside of Chicago, had a chance to try out the app and give feedback. 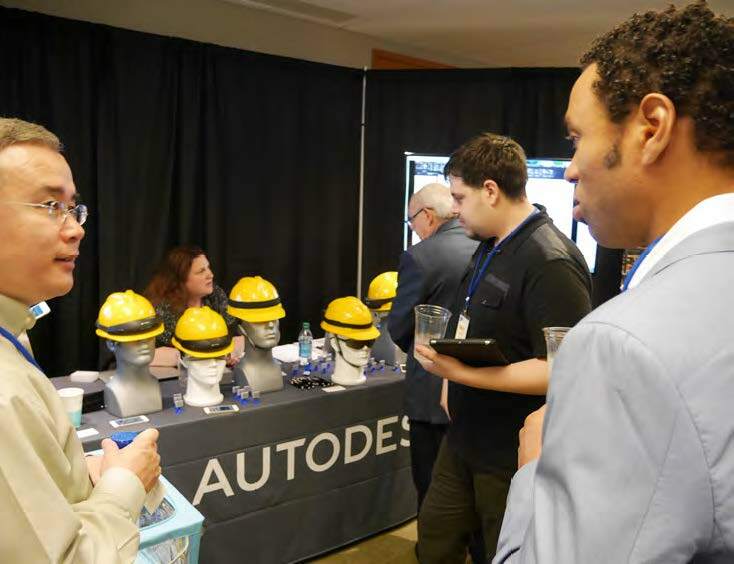 Several members of the Autodesk research team came in from China to demonstrate the product, answer questions, and interact with potential users. 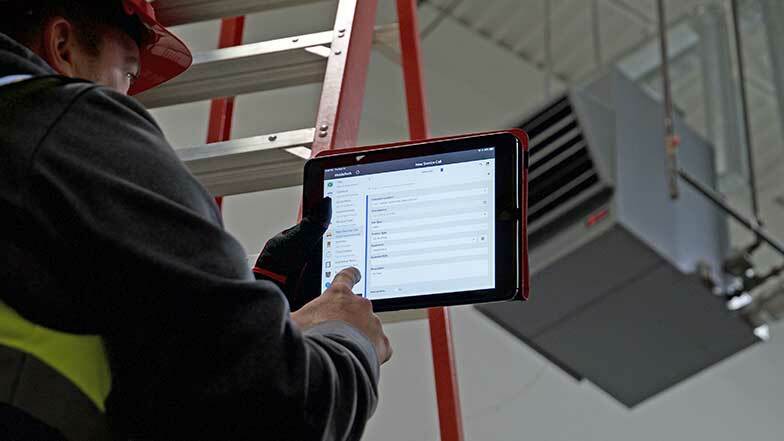 Johnson Controls, Inc. combined its YORK® chillers and Metasys® software technology to help contractors monitor the health of installed chillers during the warranty period so you can save time and money. Instead of sending multiple parties to the site to diagnose a problem, this connected approach gives you remote access to operating data and trends that help you pinpoint the root cause and resolve issues more quickly. With only two consecutive weekends scheduled to replace Cambridge Hospital’s aging cooling towers, TG Gallagher selected Baltimore Aircoil Company (BAC) towers designed to make installation and upgrades easy. 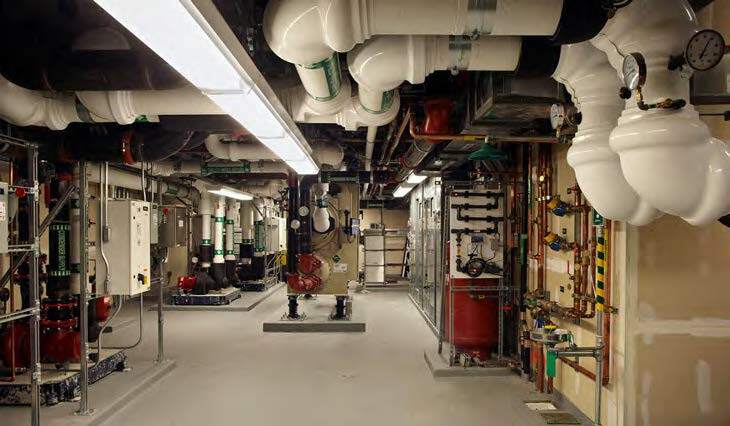 Recovering from one of the harshest winters in recent memory, the Boston-based hospital wanted to be prepared for their HVAC needs this summer, and they were looking for a more energy-efficient solution. The real challenge was getting the old towers removed and the new towers installed in the short timeframe while working around the busy Cambridge neighborhood streets. Laptop computers are vital tools used by a wide population of contractors and are also the number-one risk they are facing due to theft. 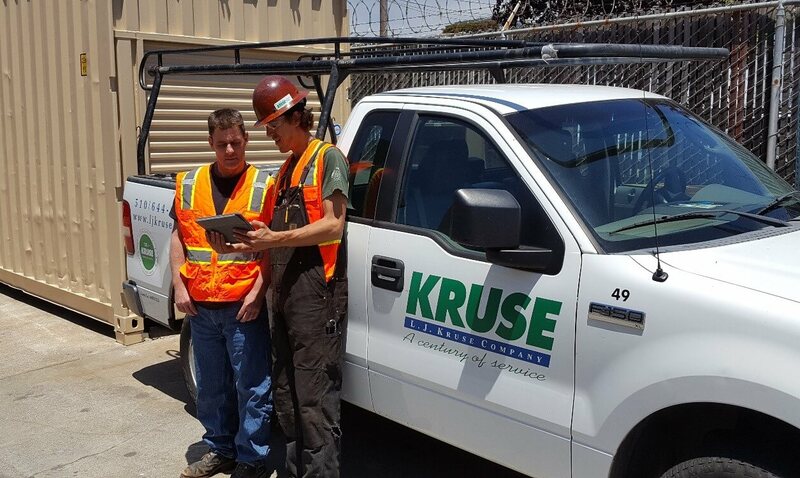 Since laptop computers and handheld devices are not typically used in a fixed, securable location such as a jobsite, additional measures are needed to protect them. Get started with these tips for laptop computer and mobile device security from CNA. In the United States plumbing industry, focus on water quality and waterborne pathogens is increasing. For public water systems, the Environmental Protection Agency regulates 88 different contaminants. Of these, Legionella has received the most recent attention. 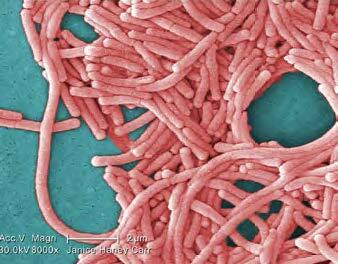 Legionella is the bacteria that can cause legionellosis. (Legionnaires’ disease is a form of legionellosis.) If not treated properly, legionellosis can be fatal. When legionellosis occurs, building owners and engineers may face legal action and damage from negative public relations surrounding the case. Viega explains that the best defense for a commercial plumbing system is to understand waterborne pathogens and how to minimize the risks they pose. When the scoreboard of the original Orlando Citrus Bowl Stadium was torn down in January 2014, the project team began a hurry-up offense to complete a roughly $200-million renovation in only ten months. Zurn Industries, LLC was drafted to provide its products and to meet the challenges of an expedited project timeline with made-to-order requirements. By making the transition from paper service tickets to iPads® using iBusiness Technologies’ MobiliForms, JS Thomas Service, Inc., sped up its billing process, so now they get paid faster. The move also improved customer satisfaction. Because MobiliForms is compatible with QuickBooks®, the switch was easy. 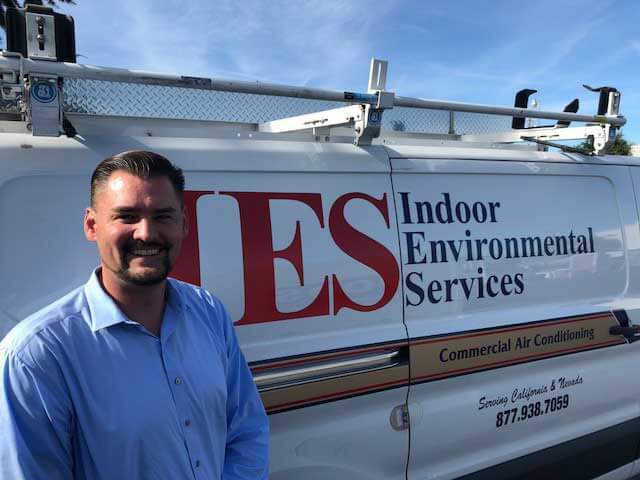 Thomas J. Dyer placed six air handling units and a condenser on a plant roof in less than one hour by relying on innovative aerial service provider Erickson Incorporated. Thomas J. Dyer commissioned Erickson to lift and place the HVAC components onto curb installations on top of the Toyota Motor Manufacturing plant in Georgetown, KY. After the air handling units and condenser were placed on the single-story building by helicopter, Thomas J. Dyer crews completed the installation. To meet the Shore Medical Center’s goal of obtaining LEED® certification, Carrier specified a range of chillers and a web-based integration system for its new Surgical Pavilion, earning the Medical Center a $117,000 rebate from the New Jersey Clean Energy Program™ in the process. 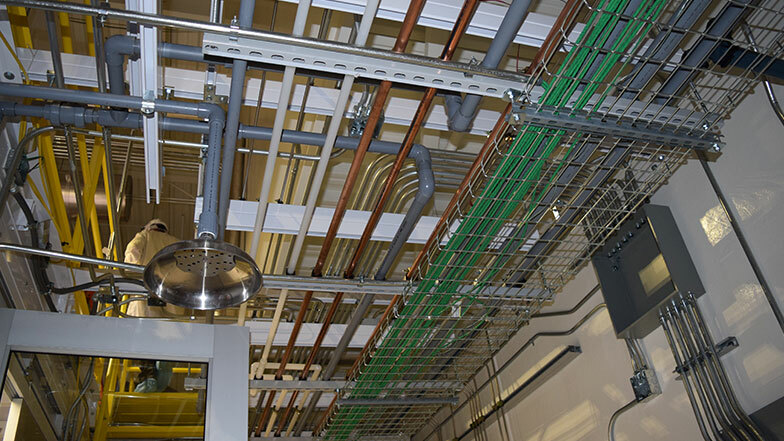 To meet a tight deadline, William F. Lynch Co., Inc. recommended Parker Hannifin’s Transair aluminum piping over copper piping, saving installation time, labor, and material costs. By using Transair, Lynch was able to install twice the piping specified in the initial design and still finish the job on time. 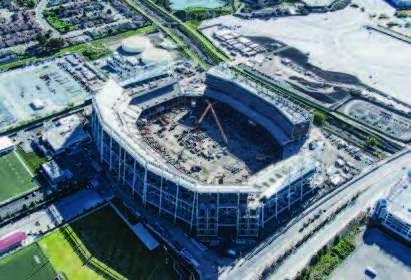 With just over two years to build the NFL’s new Levi’s® Stadium, F. W. Spencer & Son, Inc. turned to Jay R. Smith Mfg. Co.® for products designed with prefabrication in mind, allowing them to meet the accelerated deadline. 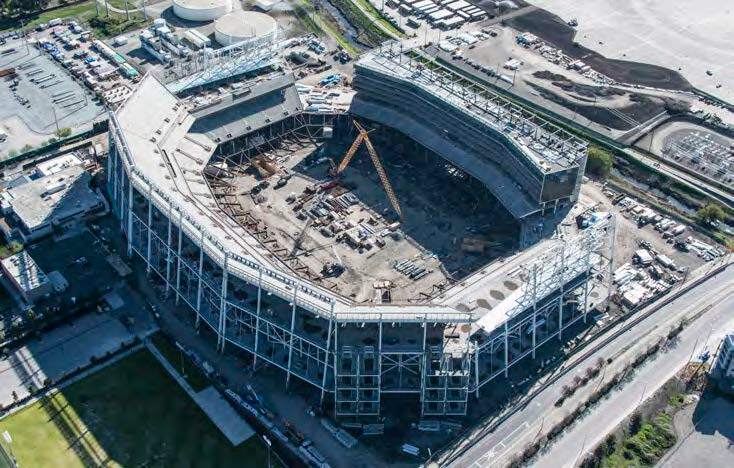 Installing a big battery of water closets typically involves prefabrication to save time, but the building of Levi’s Stadium in Santa Clara, CA, took prefab work to another level entirely. With careful planning and quick turnaround on materials, F. W. Spencer & Son succeeded in constructing all the fixtures in its warehouse and installing them in time. The stadium is home to the San Francisco 49ers. F. W. Spencer & SonJay R. Smith Mfg. 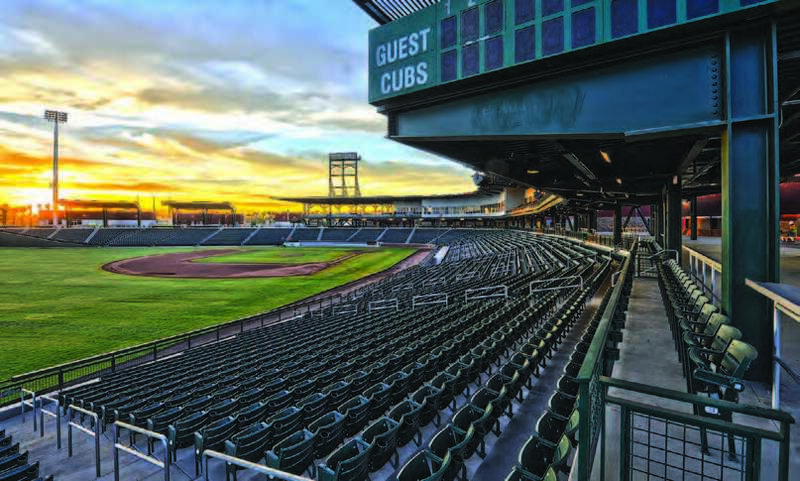 Co.
Major League Baseball’s Chicago Cubs specified Illinois-based Sloan Valve Company’s plumbing systems for its spring training facility in Mesa, AZ. Recently, the Cubs announced that Sloan has joined the organization as a Legacy Partner and the team’s Official Water Efficiency Partner. 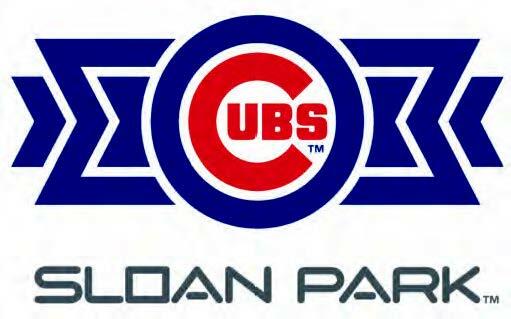 As part of this agreement, the Cubs’ spring training facility will be named Sloan Park. 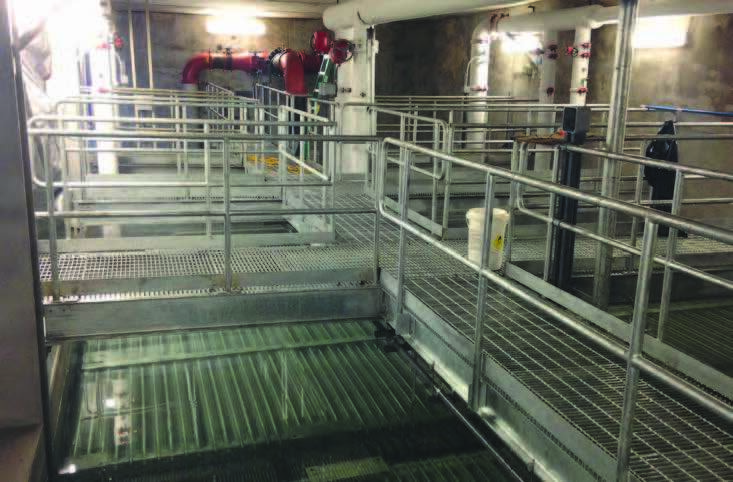 Having installed Victaulic grooved products numerous times, Environmental Mechanical Contractors, Inc. (EMC) knew Victaulic could help them meet a tight deadline for renovations at Kansas’ Fort Leavenworth. Working with Victaulic’s Construction Piping Services department (CPS) to create 3D renderings of the project also allowed EMC to minimize rework and identify and troubleshoot potential problems. “We picked up a 30-percent labor savings from fabrication to install[ation]” said Marcus Howell, EMC’s senior project manager on the Fort Leavenworth project (now director of construction operations). Dedicated Chicago Cubs fans who attended the Major League Baseball team’s spring training in Arizona this year were rewarded with modern restrooms (among other amenities), thanks to W.J. Maloney Plumbing, Heating & Cooling and Sloan Valve Company. W.J. Maloney chose Sloan plumbing because its products have such a good batting record at the Cubs’ main stadium and on other W.J. Maloney projects. To win the bid for a new Early Childhood Learning Center in Dayton, OH, Starco, Inc., proposed using GRINNELL products to speed installation time and GRINNELL Mechanical Services (GMS) to plan ahead for maximum efficiency. Northmont City Schools, based on the outskirts of Dayton, broke ground on the Early Childhood Learning Center in 2012, and Starco was awarded the hot and chilled water services for the project in 2013. 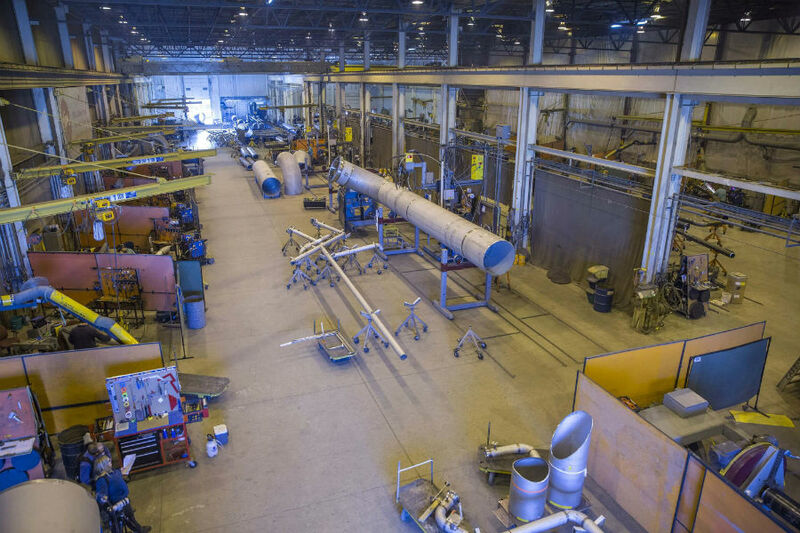 With 24 months to install 130,800’ of pipe, Palmer Christiansen Company relied on Victaulic for high-quality systems that reduce labor costs and installation time. As a result, the new federal courthousein Salt Lake City, UT, is expected to open in March 2014, with the mechanical system coming in on budget and ahead of schedule. 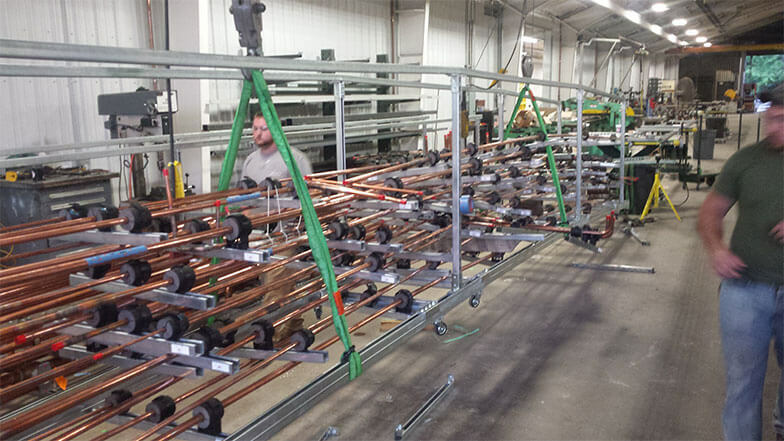 Modern Piping Inc. put the PipeWorx 350 FieldPro™ System from Miller Electric Mfg. Co. to work to save time and enhance safety for a job where some welding took place hundreds of feet in the air, far away from the power source. 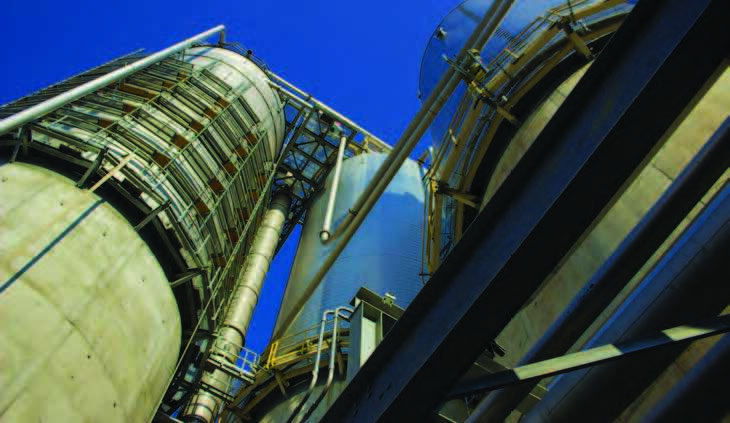 International food and agricultural producer Cargill had purchased an unfinished corn wet-mill ethanol plant in Fort Dodge, IA, in 2011 and contracted with Modern Piping of Cedar Rapids to complete the construction on an aggressive schedule. Modern PipingMiller Electric Mfg. Co.
To streamline the large amount of paperwork generated by each project and jobsite and to make it easier for key project team members to access, share, and update information, West Chester Mechanical Contractors, Inc., partnered with iBusiness Technologies to convert their processes and project documents to mobile, digital formats. The move was prompted by recommendations from both the MCA of Eastern Pennsylvania and Apple®. 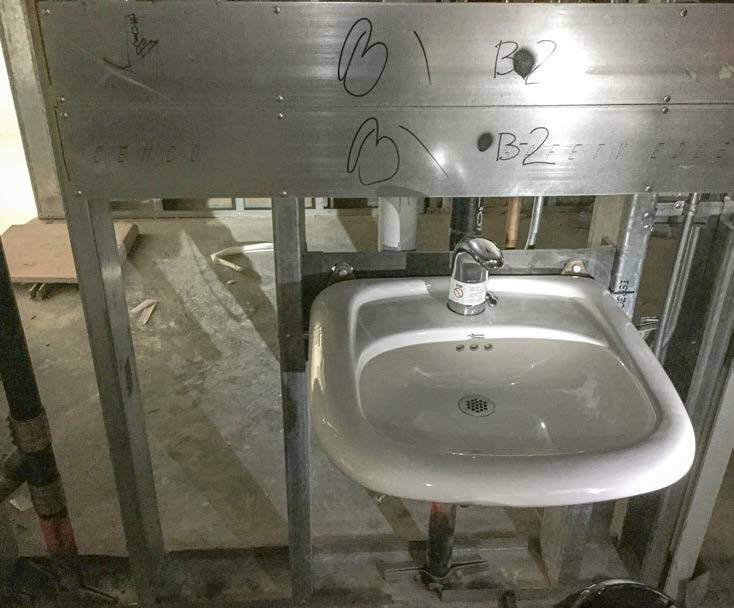 Prefabricating plumbing systems offsite can save time and money, but getting those systems to the jobsite poses its own challenges. 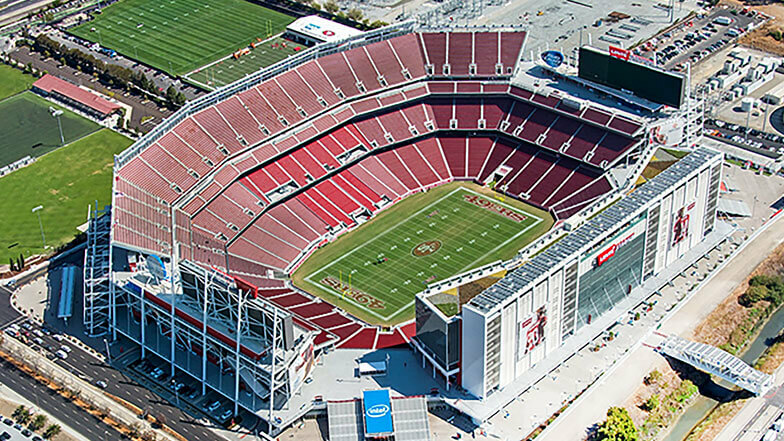 For Levi’s Stadium in Santa Clara, CA—future home of the NFL’s San Francisco 49ers—FW Spencer and Son, Inc., had to transport the high-capacity, back-to-back gang toilet systems that it had fabricated at its facility to the jobsite while maintaining a strong joint with a rigid seal. They chose Husky couplings from Anaco because they are designed to withstand joint movement while maintaining full joint integrity. The new Mercy Hospital Joplin in Joplin, MO, is on schedule to open in 2015, thanks in part to efforts by U.S. Engineering. To meet the needs of this fast-track effort to replace the former St. John’s Mercy Regional Medical Center, destroyed on May 22, 2011, by an EF-5 tornado, U.S. Engineering used a host of Trimble solutions to establish one of the industry’s most efficient, accurate, and repeatable design-to-fabrication-to-installation workflows ever put in place on a hospital project. Combining TSI Software’s Autodesk Fabrication and Building Data, along with other TSI solutions, Gallo Mechanical expanded their fabrication operations, increased productivity, and grew their business. 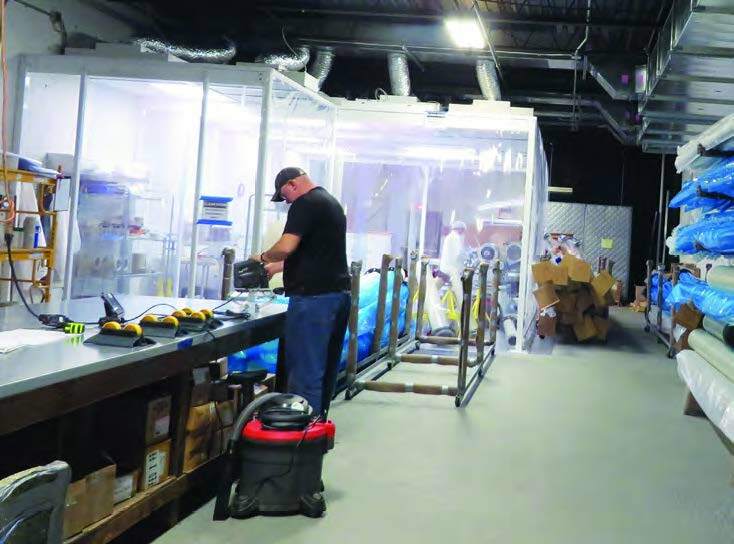 By boosting their use of Fabrication with content, Gallo Mechanical expanded use of their fabrication shop, going from two employees to 20 in the shop. Building owners and property managers have a lot at stake in their investments, so they look to their MCAA contractors for solutions. When evaluating mechanical equipment, hassle-free operation and long equipment life are important parts of the purchase equation — here are five ways to enhance the performance of evaporative cooling equipment and save on energy costs. 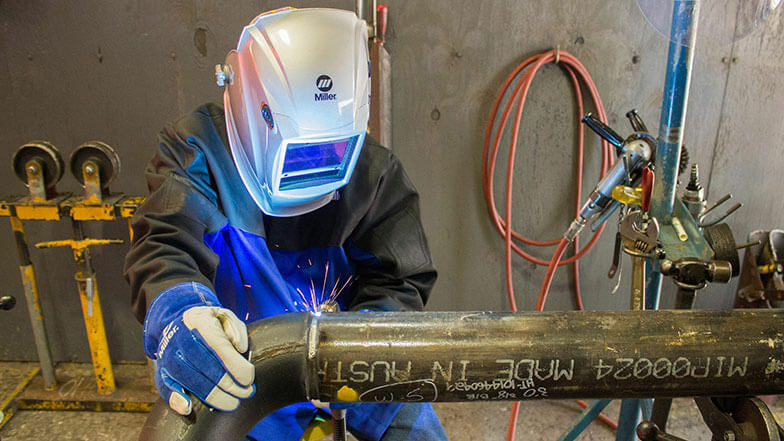 By taking advantage of the multiprocess capabilities of the Miller® PipeWorx 400 welding system, mechanical contractor De-Cal, Inc., was able to change its pipe welding processes to significantly improve productivity—by as much as 30–40 percent—while also growing business. Xylem’s Bell & Gossett Little Red Schoolhouse and the United Association (UA) union of plumbers, fitters, welders, service technicians, and roofers have formed a training partnership to equip trade professionals in the HVAC field with the technical expertise to service and repair pumps in an HVAC system. With customized solutions from Jay R. Smith Mfg. 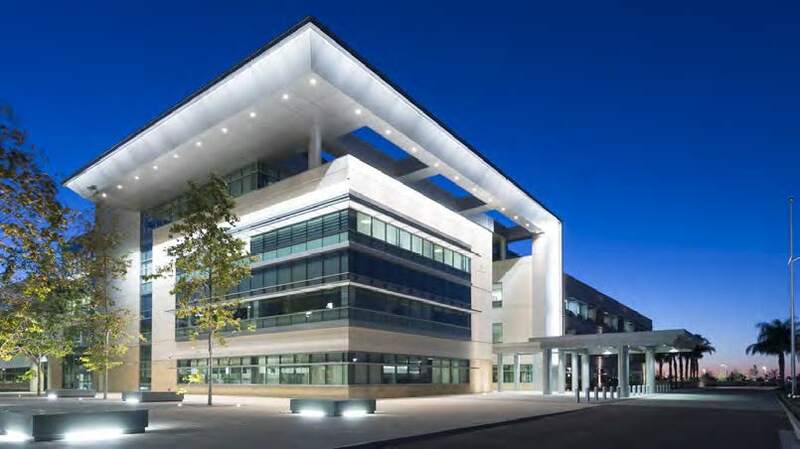 Co., Pan-Pacific Mechanical (PPM) met the challenges of the California Building Code and their client’s demand for a visually pleasing building. Jay R. Smith’s willingness to provide products that adapted to PPM’s custom approach ensured that construction of the new Kaiser Permanente San Diego Regional Medical Center (KPSD) went off without a hitch. Pan-Pacific MechanicalJay R. Smith Mfg. Co. The Nodaway Valley School District in Greenfield, IA, installed the APR Control manufactured by Rawal Devices, Inc. on all their unit ventilators to prevent the problems they had been experiencing because their direct expansion (DX) air conditioning systems were oversized for the spaces they were servicing. The Rawal controls addressed the immediate problems and also provided protection against other potential malfunctions. 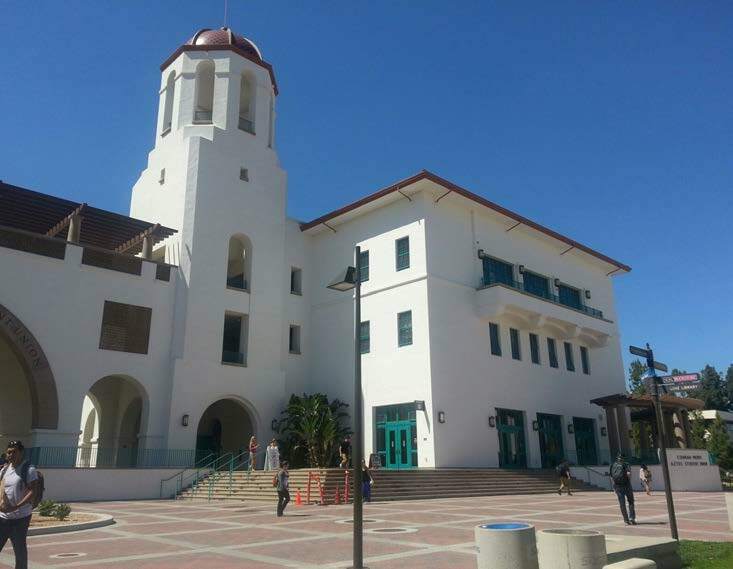 To help San Diego State University’s (SDSU’s) Associated Students reach its goal of making all its buildings LEED® certified by 2020, University Mechanical installed an Uponor in-slab radiant heating and cooling system in the new student union. Now, the three story Aztec Center is not only highly sustainable, it is also LEED Platinum certified. One of the issues that mobile-equipped companies struggle with is how to handle operating system (OS) updates. When to update depends on business needs, but you should only push out OS updates after evaluating risks and if they bring significant value to your business. 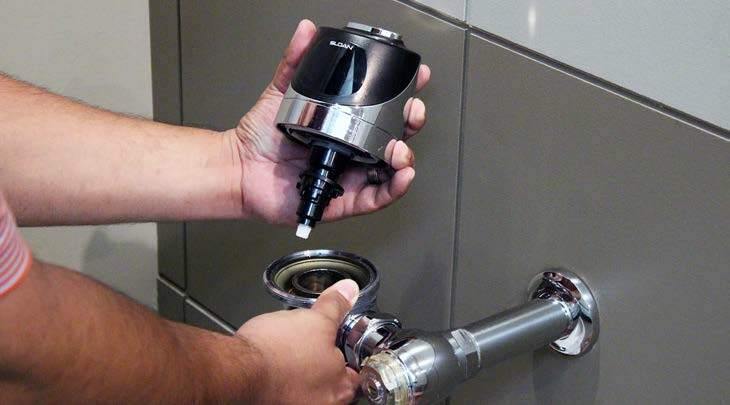 Knowing when to service or replace aging plumbing equipment is critical to maintaining a clean, operational commercial restroom. Like regularly changing the oil in your car, consistent preventive maintenance helps avoid critical, costlier repairs down the road. All Area Plumbing found that stainless steel waste and vent piping systems from Josam Company were the perfect fit for a restaurant in need of a product that could stand up to just about anything. Stainless steel has a lot of advantages over other materials, such as a low corrosion rate, strength, and durability. It is also recyclable, fireproof, nonporous, and attractive. Moreover, Josam’s Push-Fit joining system sped up installation. 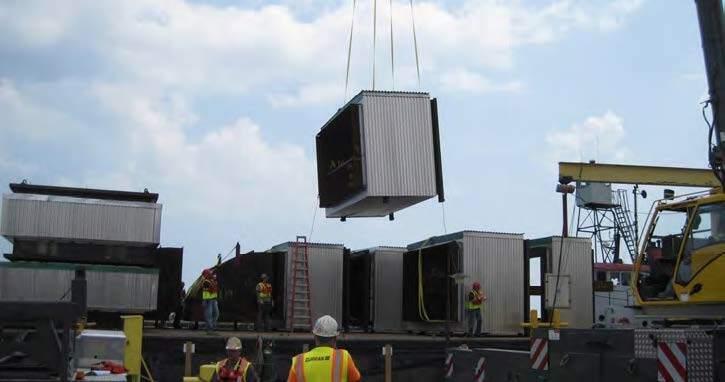 Faced with the need to minimize noise and limit work to daytime hours for a hospital remodeling project, Dynamic Systems, Inc. (DSI) prefabricated as much as possible, calling on CADDY products from Pentair to get the job done and also saving time on the jobsite. The project called for DSI to add a floor to the hospital while the hospital was still serving patients. 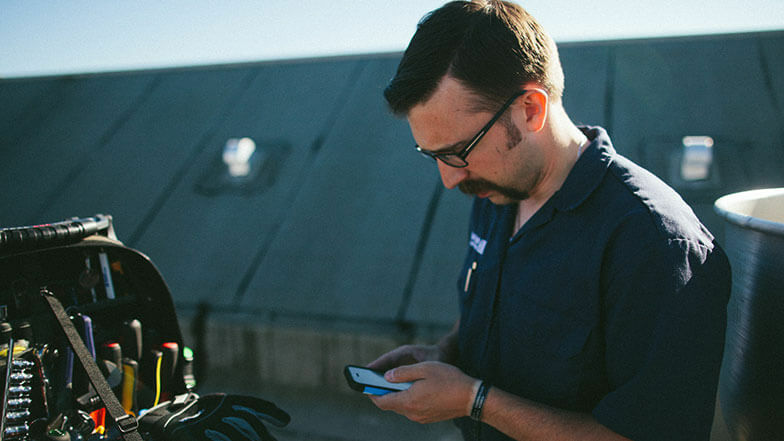 In search of a way to track equipment efficiently, Icon Mechanical took advantage of Milwaukee Tool’s ONE-KEY™, the first digital platform for tools and equipment. 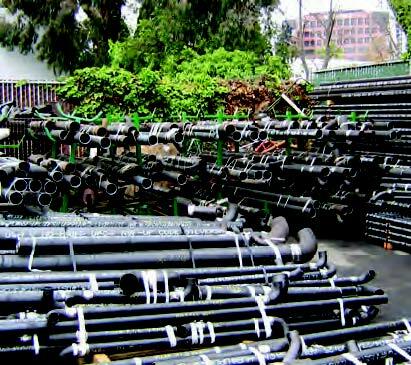 Now, it has a full picture of the company’s allocation and location of equipment and has experienced a noteworthy increase in tools being returned. 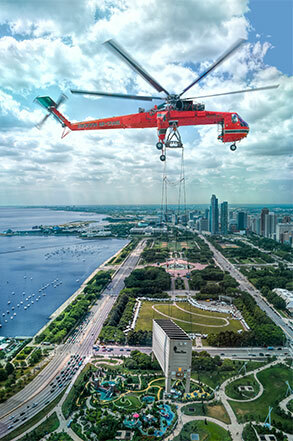 Thanks to Erickson Incorporated, a global provider of innovative aerial services, The Hill Group saved around $45,000 on several heavy lifts along the downtown lakefront of Chicago, IL, in one day. They also shortened their project timelines considerably. To meet the coordination challenges and compressed timeline of an historic building renovation in downtown Philadelphia, A.T. Chadwick turned to Victaulic’s drawing services team. The speed of installation of Victaulic grooved piping systems would also prove crucial to meeting deadlines, as well as reducing costs. By installing Daikin Applied highly efficient Rebel rooftop units, Egan Company overcame time challenges and space constraints, providing Bethel University with a more effective, energy-saving solution to its HVAC needs. Zurn Industries, LLC enabled U.S. Engineering Company to “move the chains” faster than usual during the rough-in phase of building a new stadium for Colorado State University in Fort Collins, CO. Patrick Barnett, project manager for U.S. Engineering, said Zurn’s lean construction practices provided “at least a 10-percent” labor savings for the company.